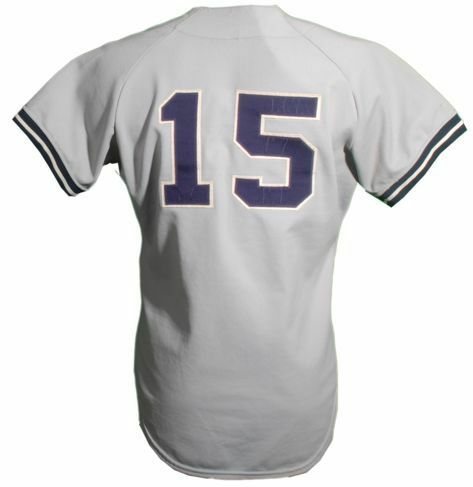 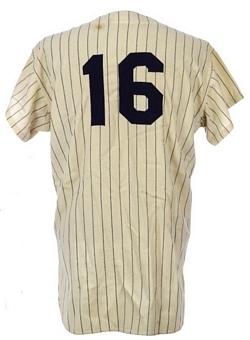 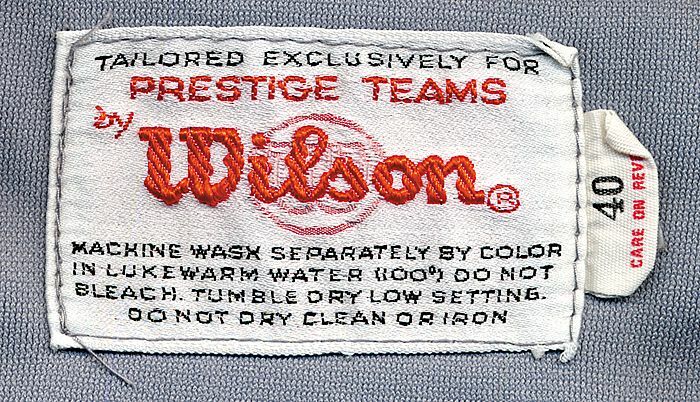 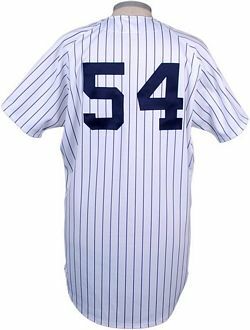 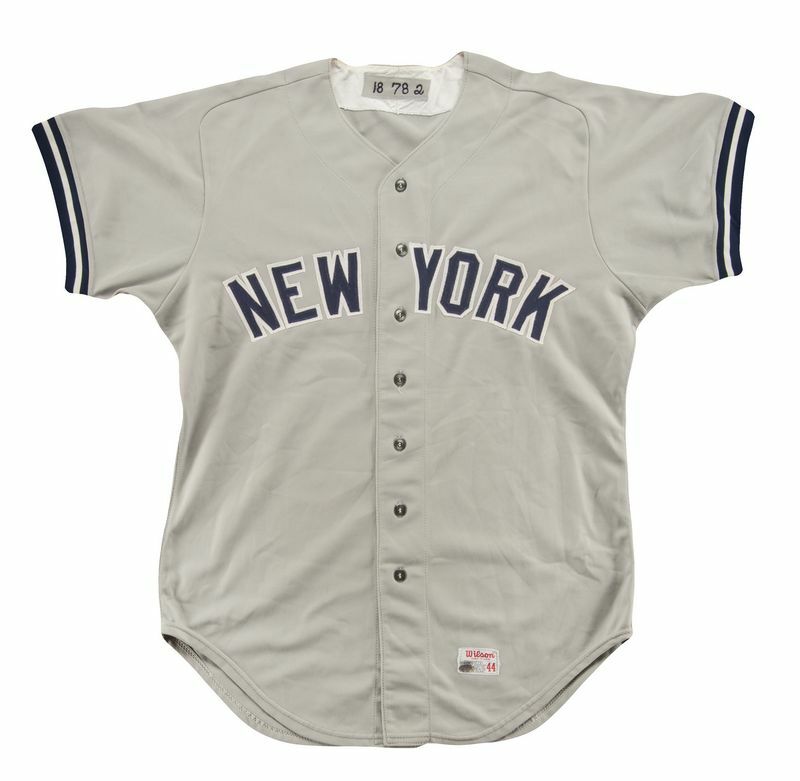 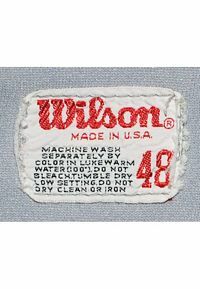 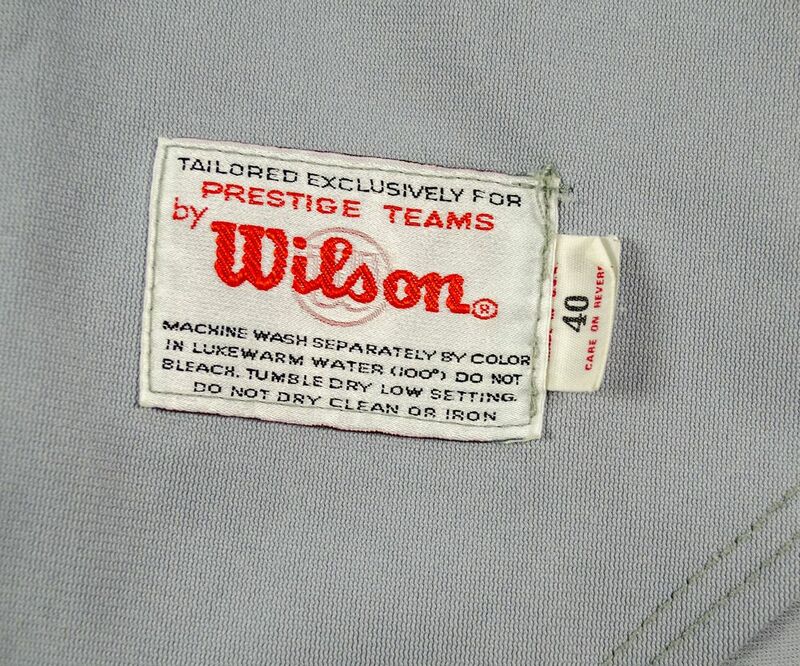 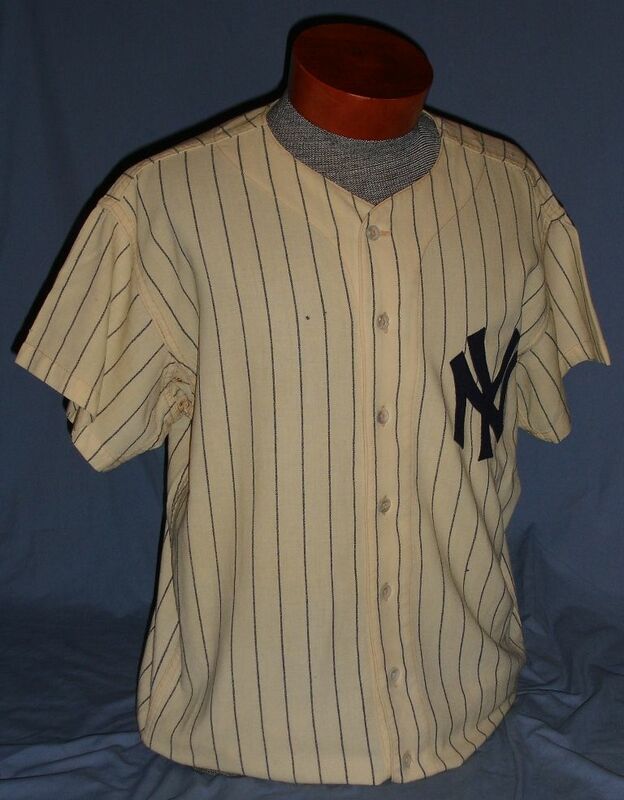 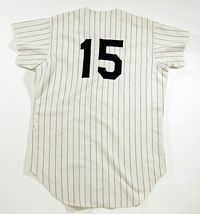 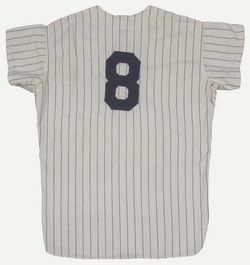 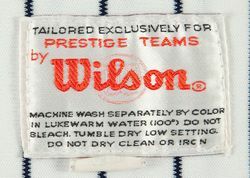 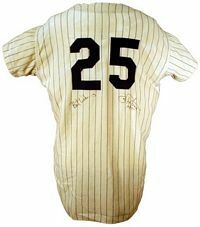 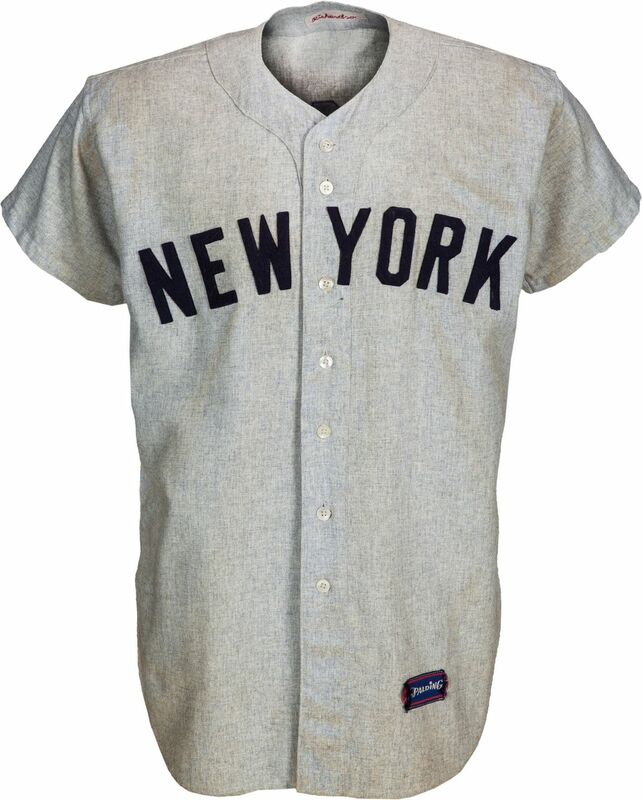 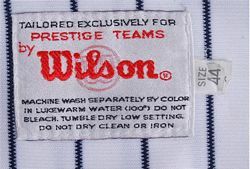 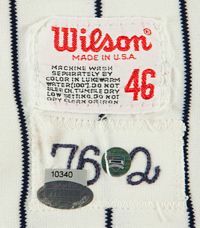 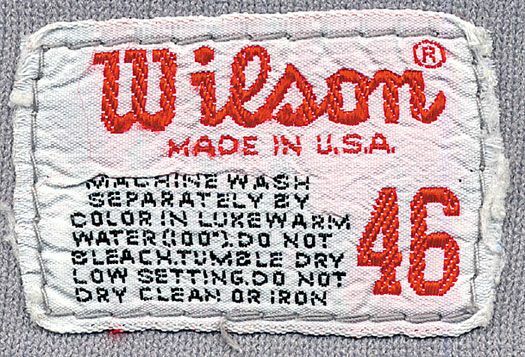 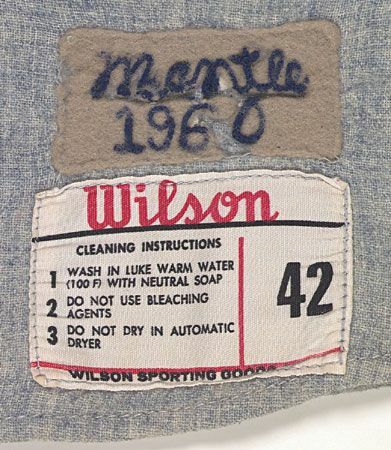 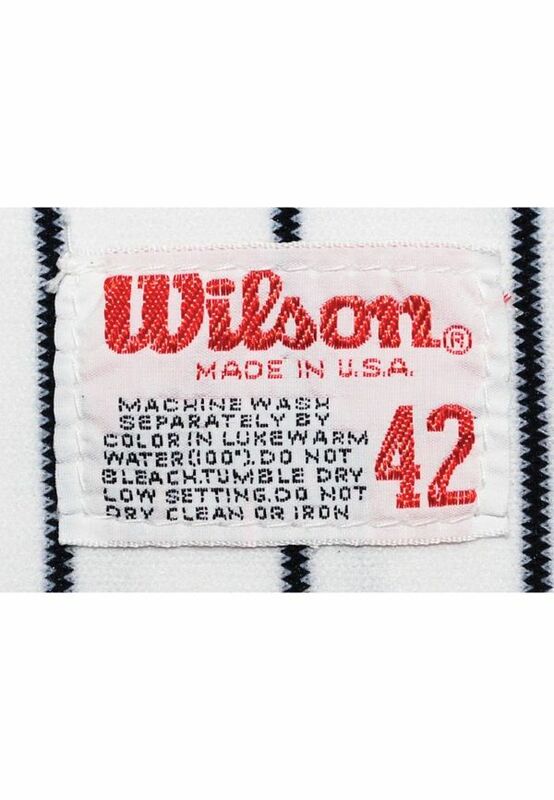 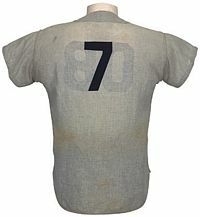 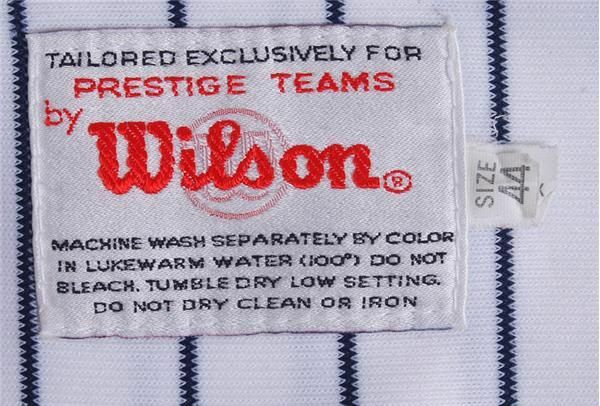 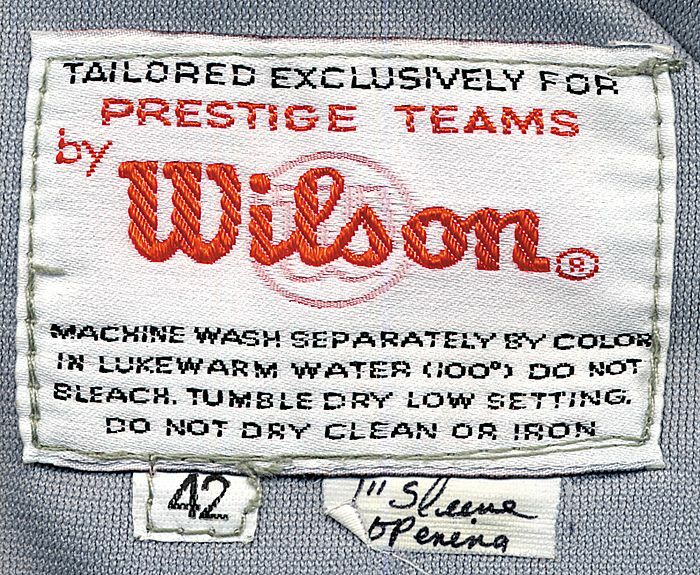 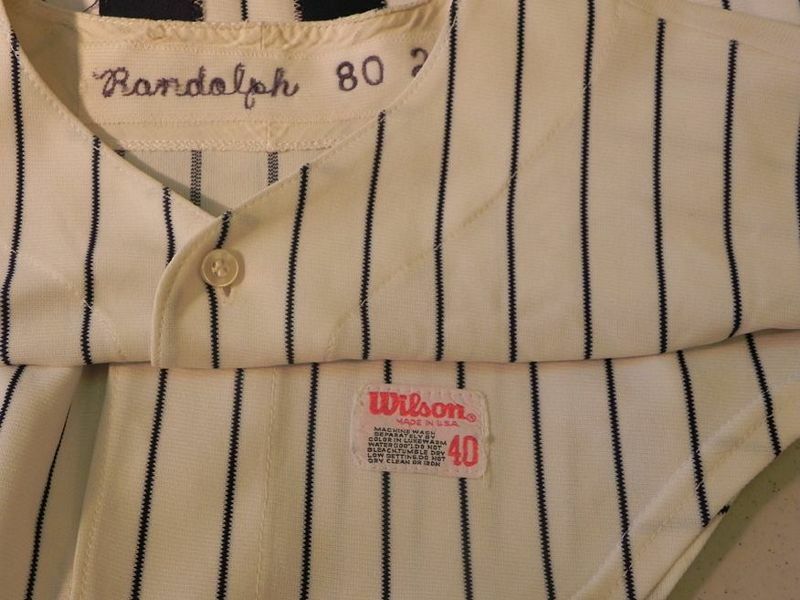 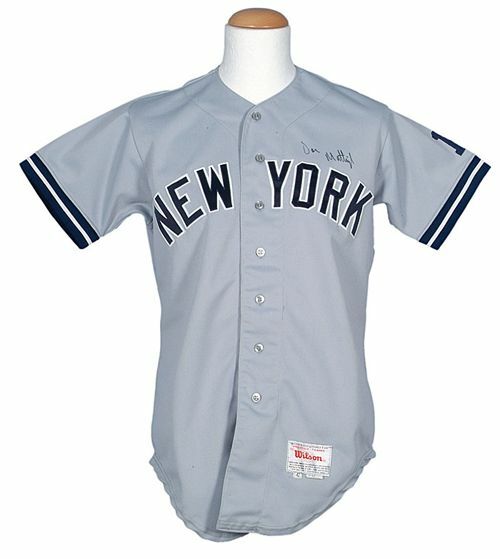 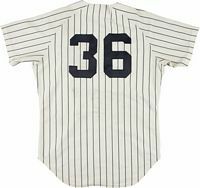 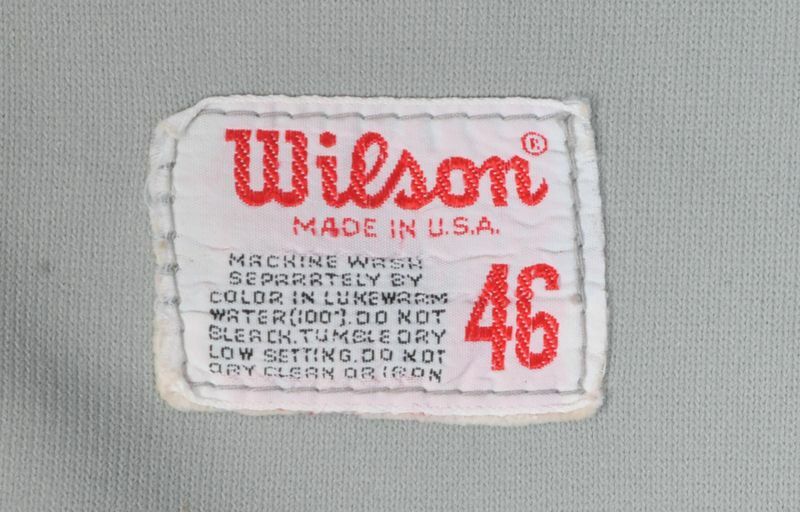 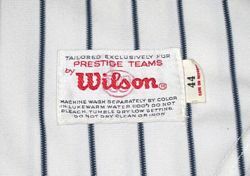 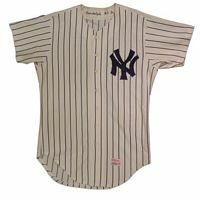 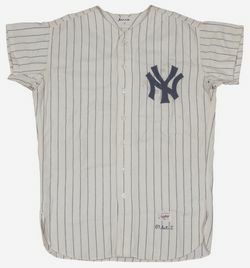 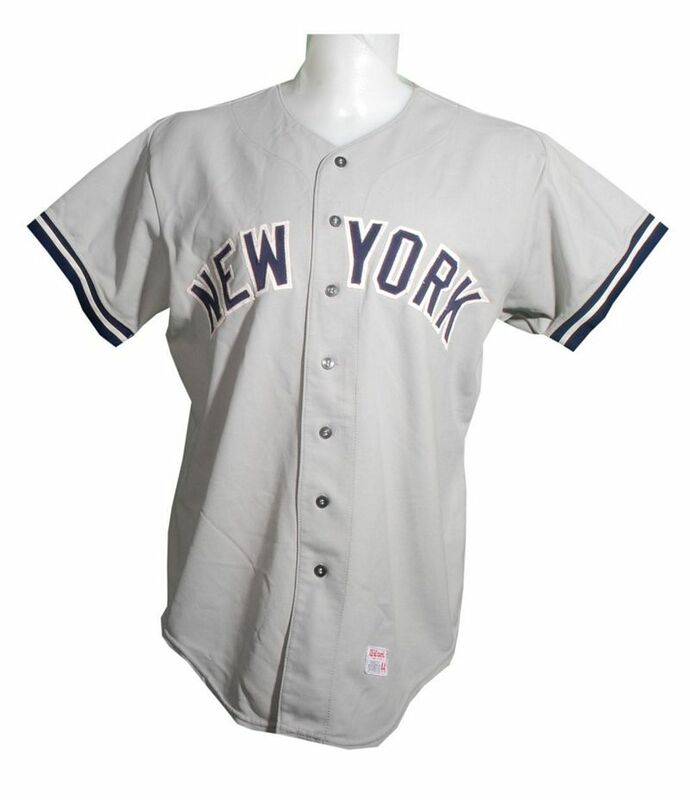 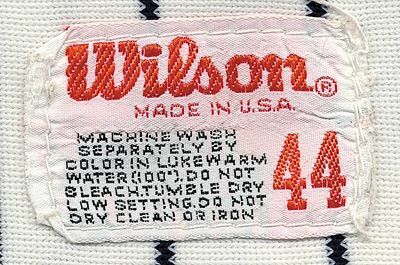 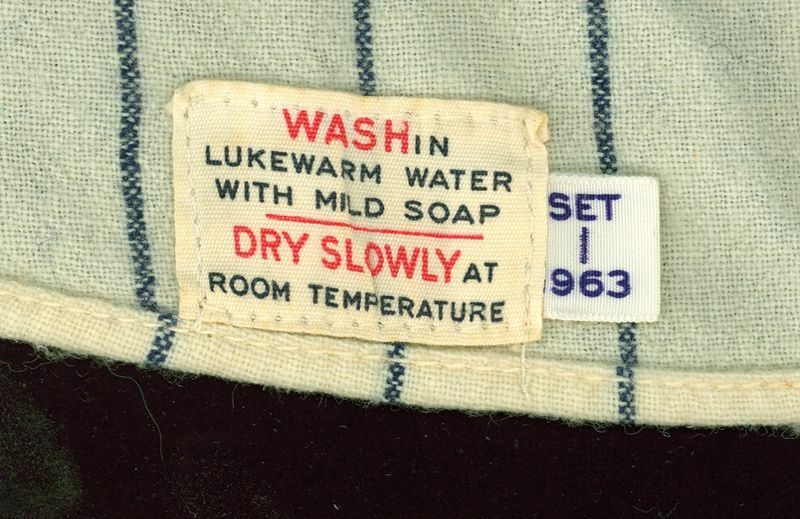 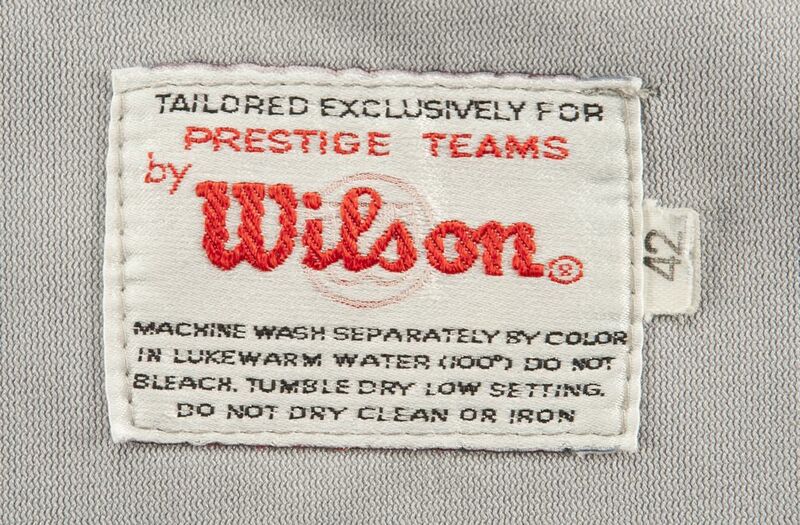 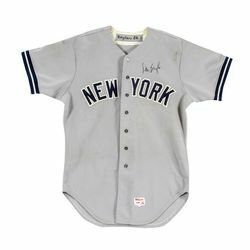 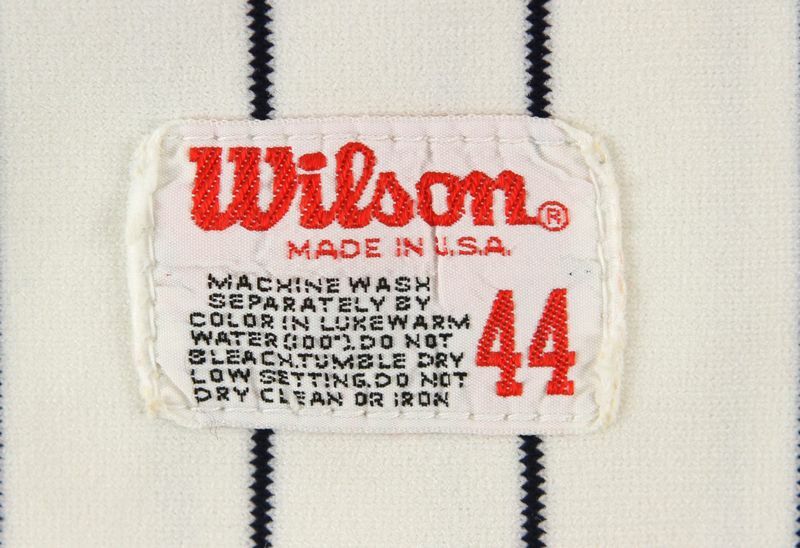 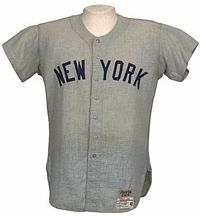 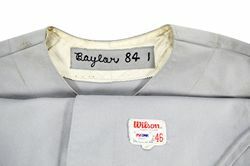 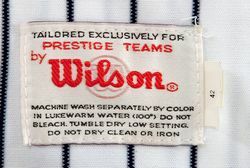 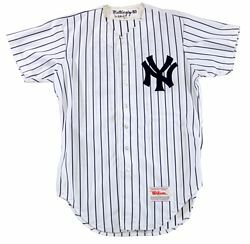 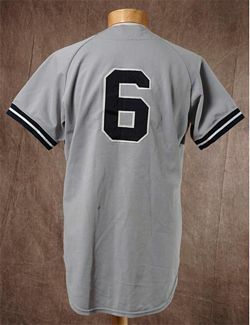 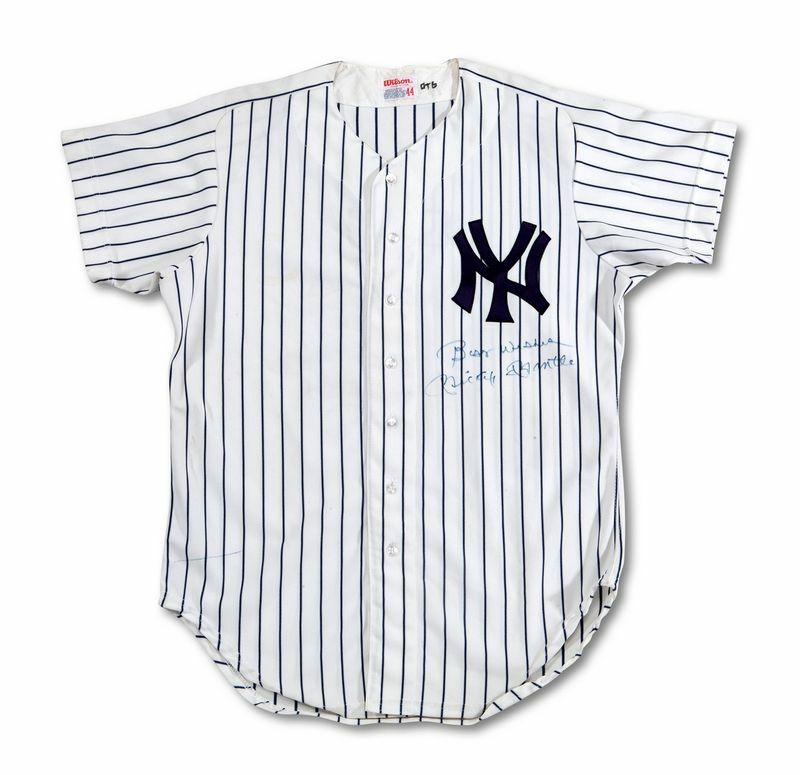 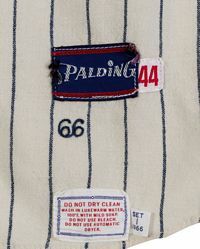 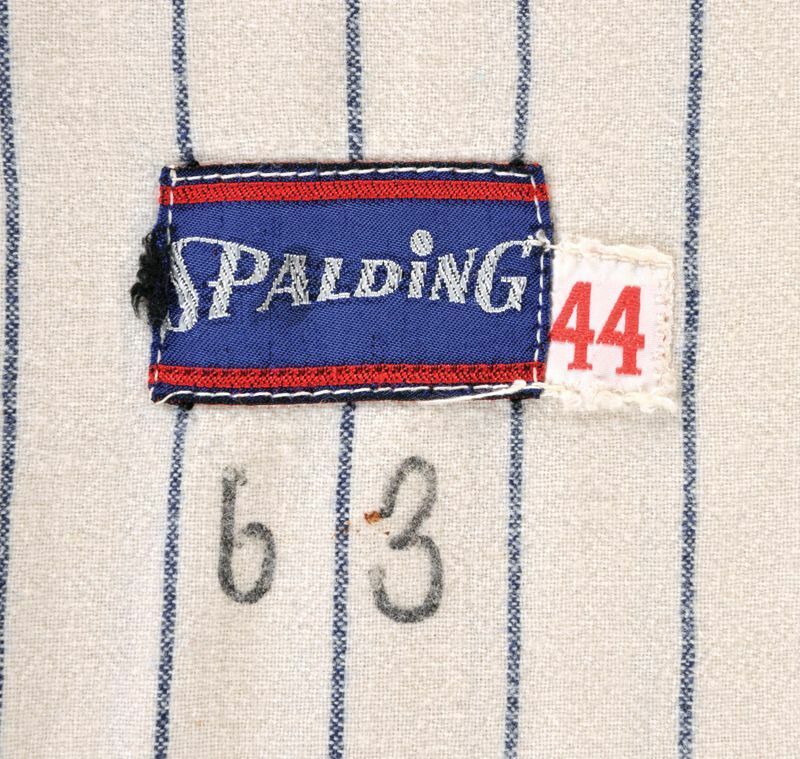 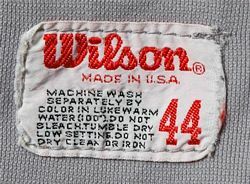 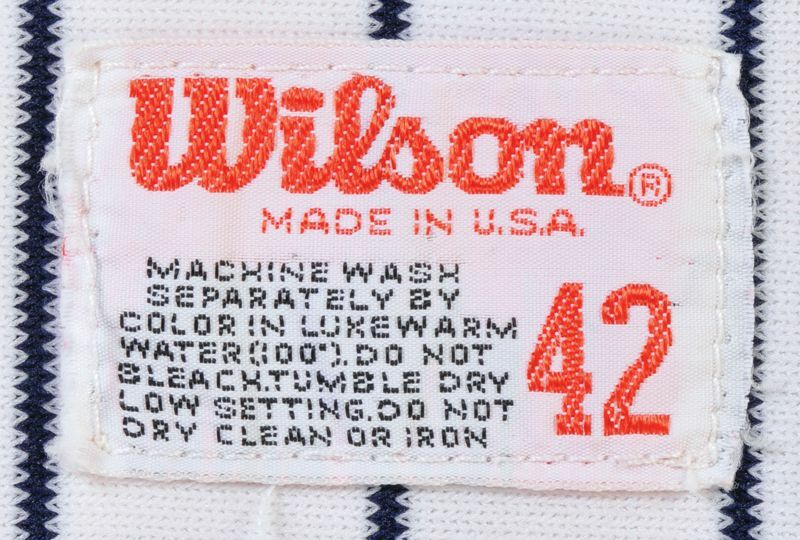 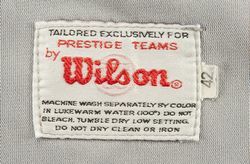 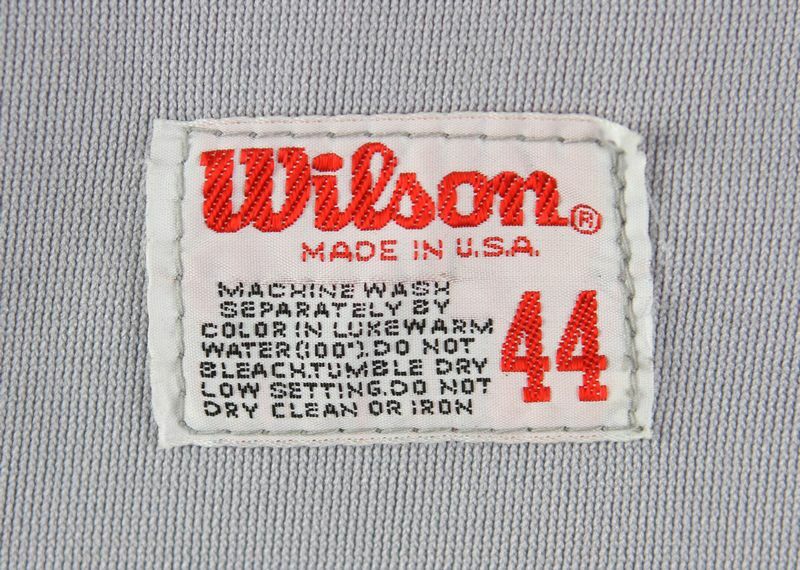 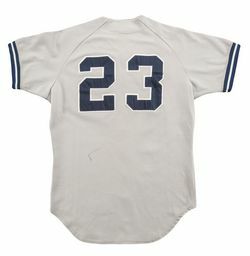 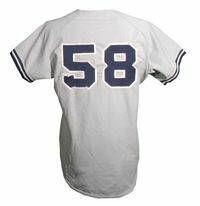 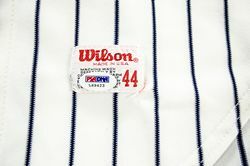 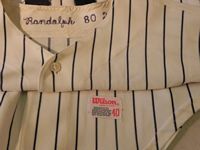 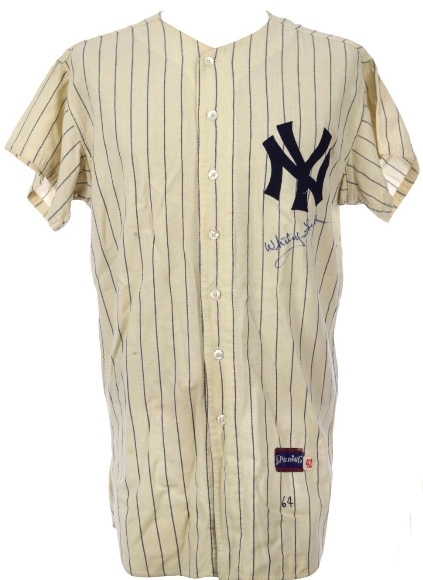 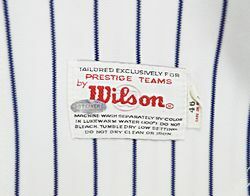 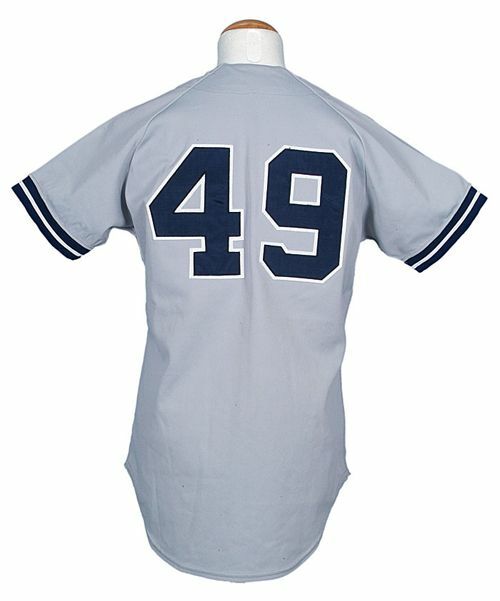 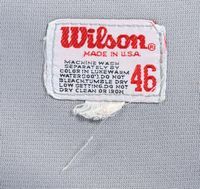 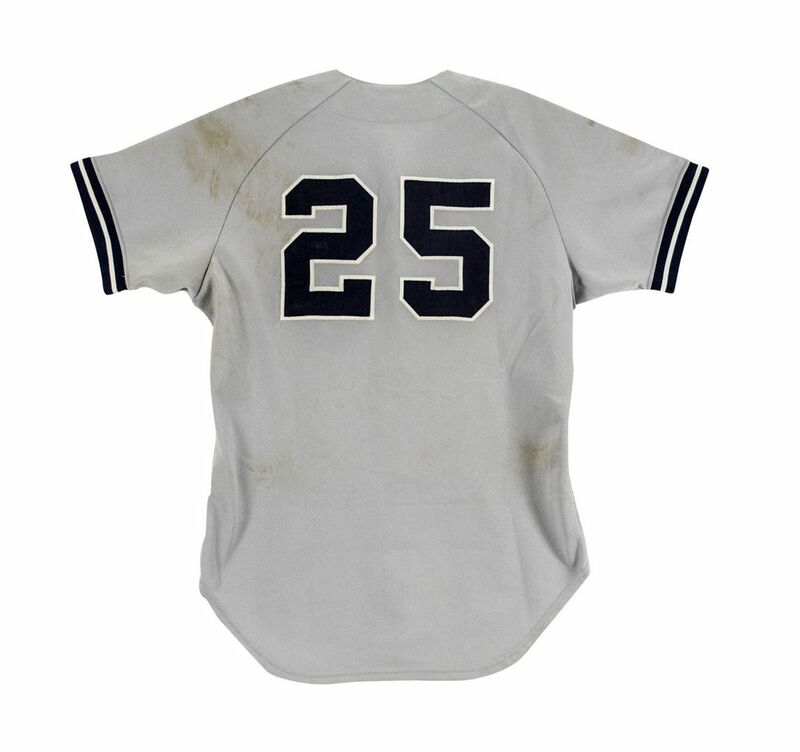 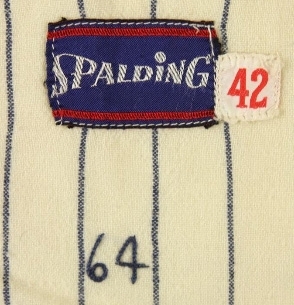 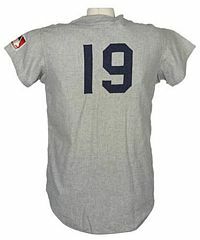 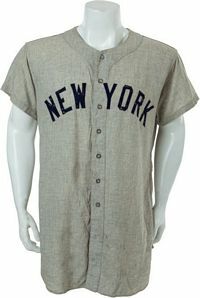 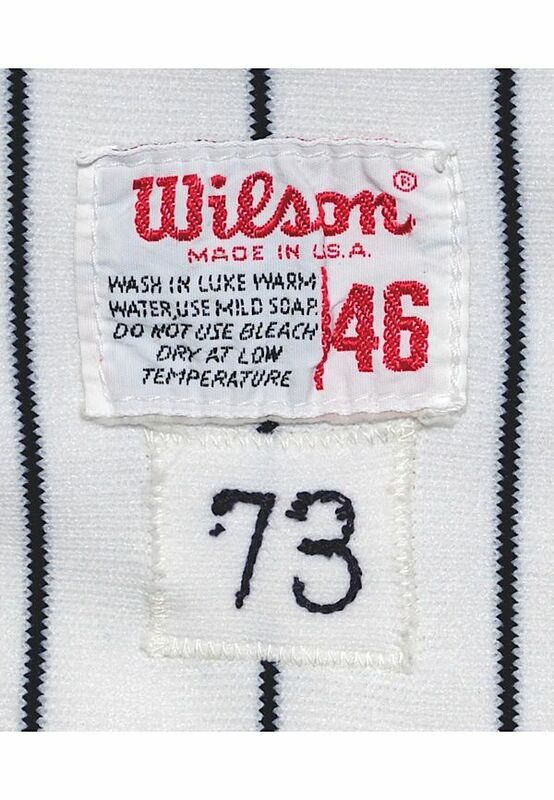 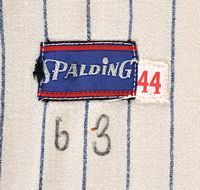 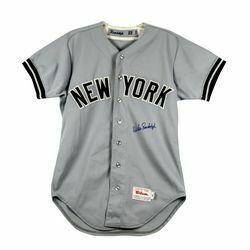 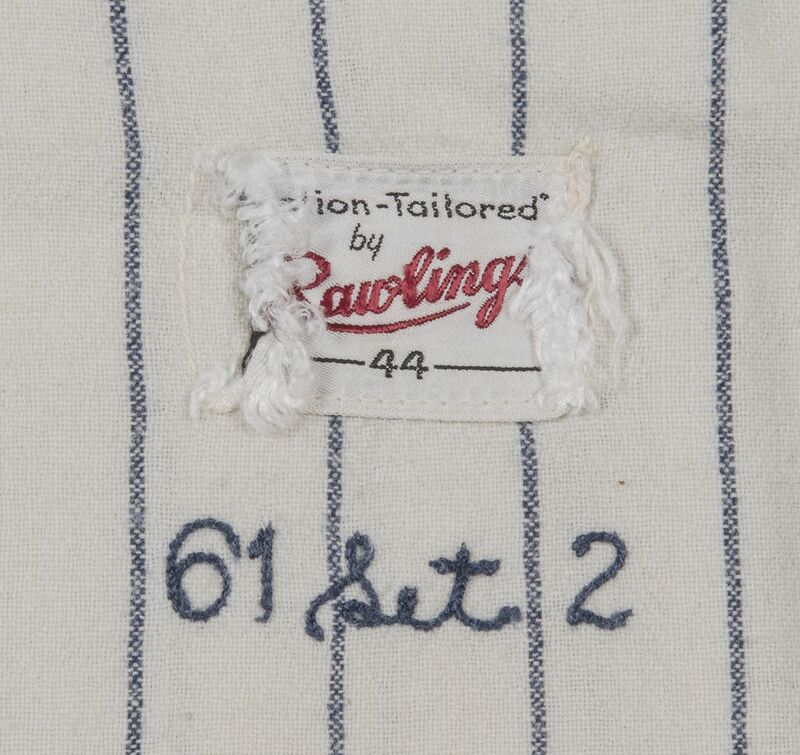 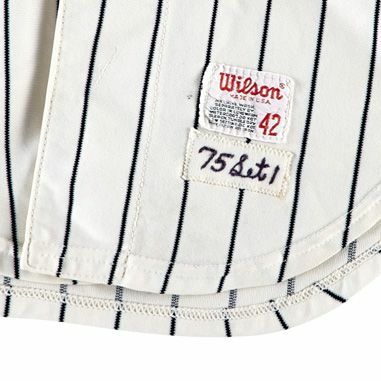 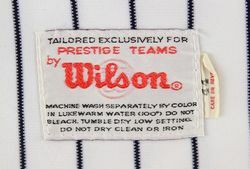 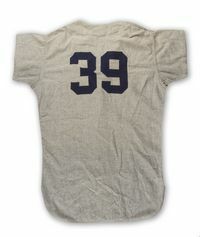 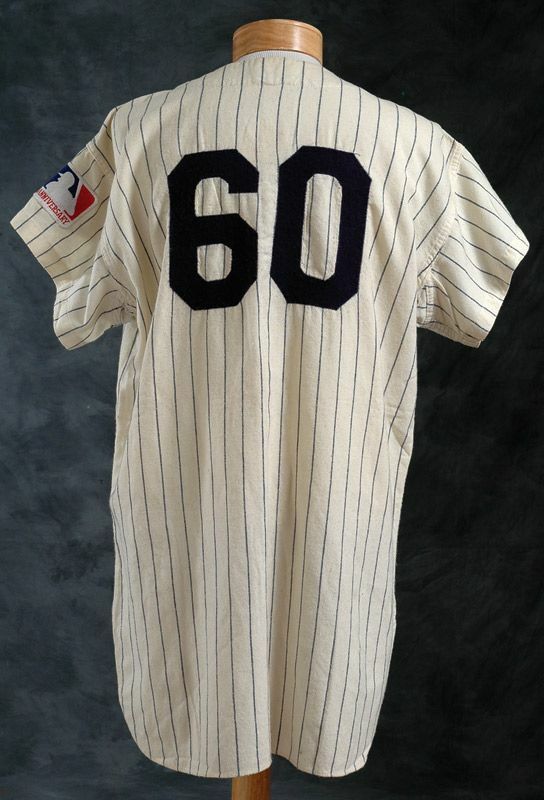 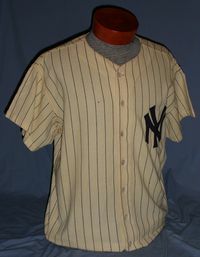 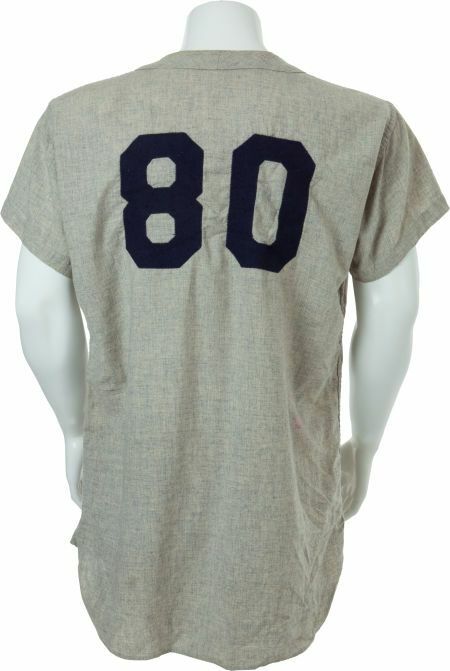 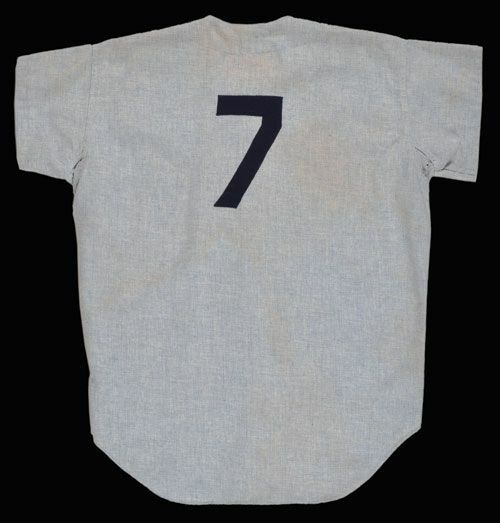 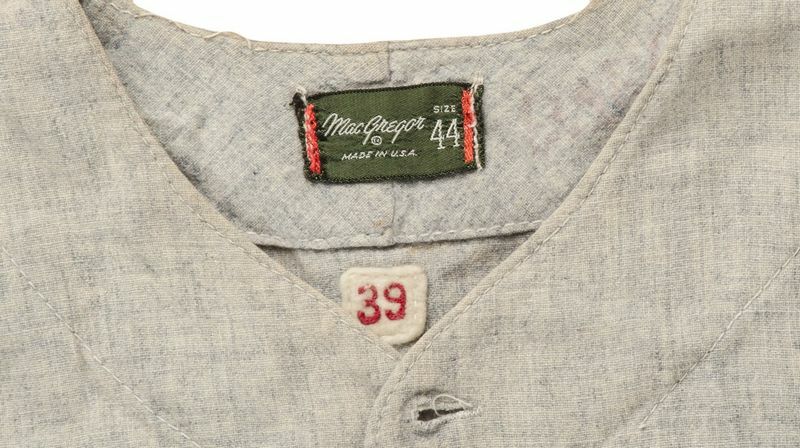 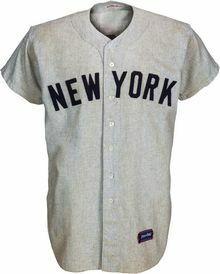 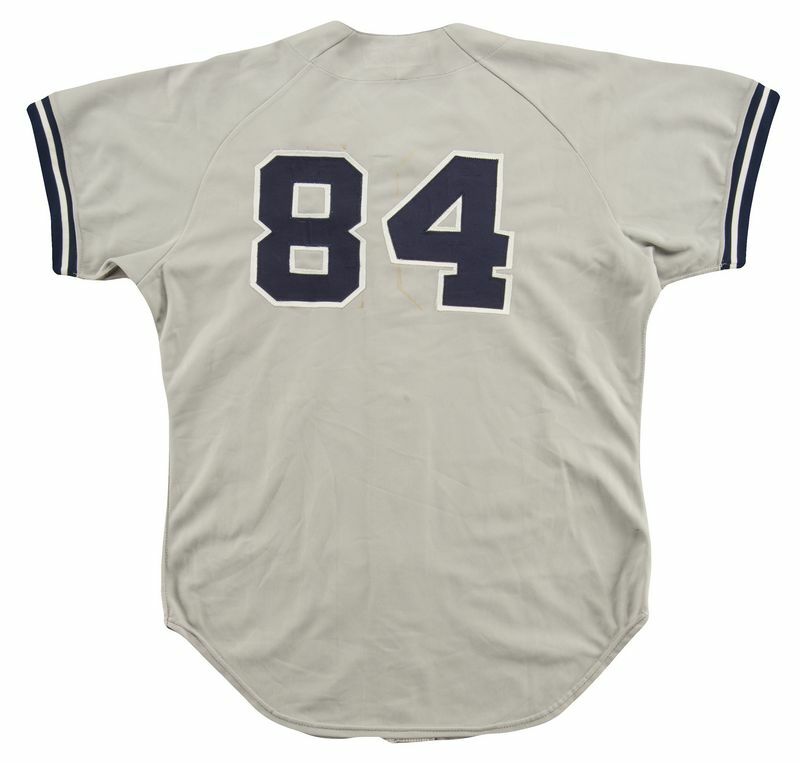 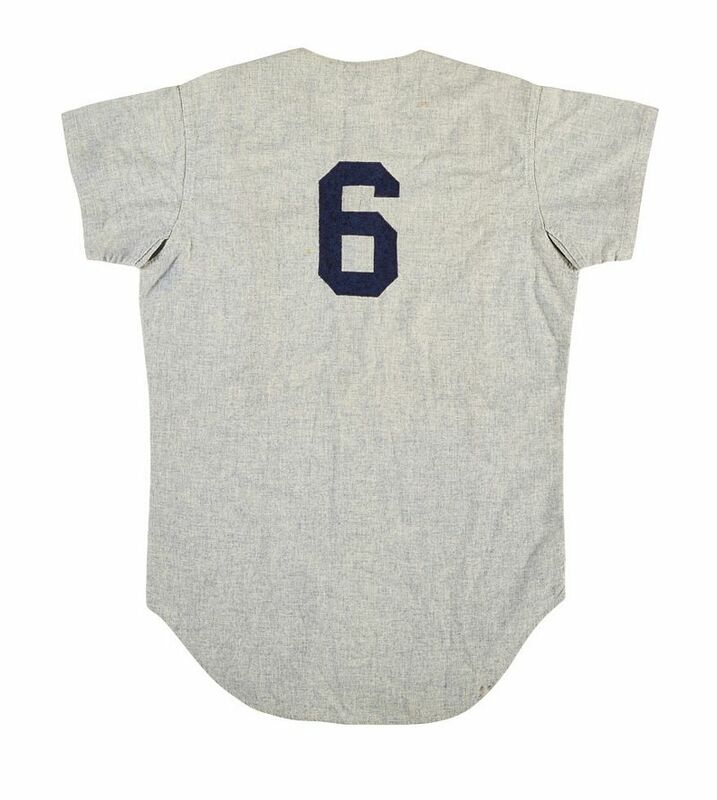 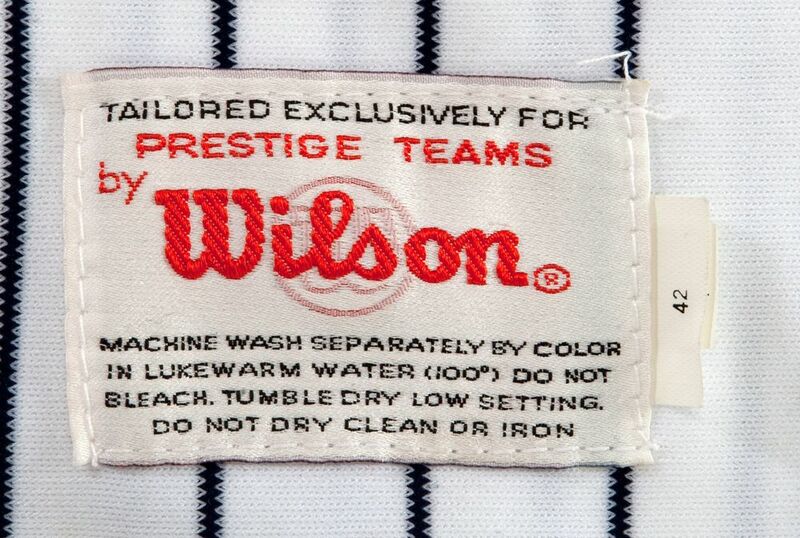 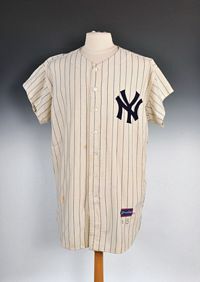 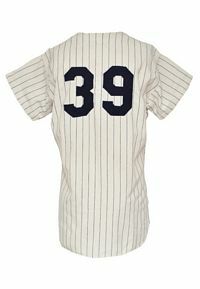 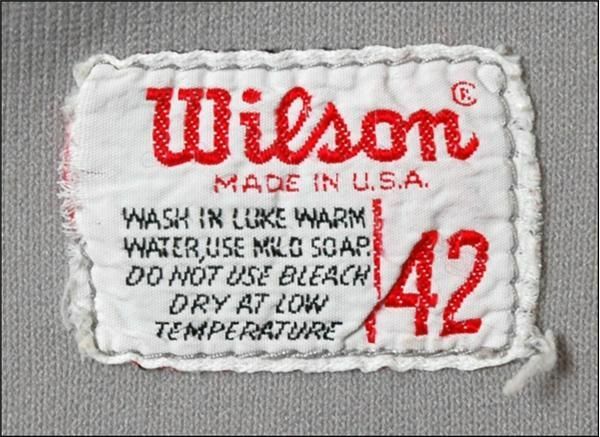 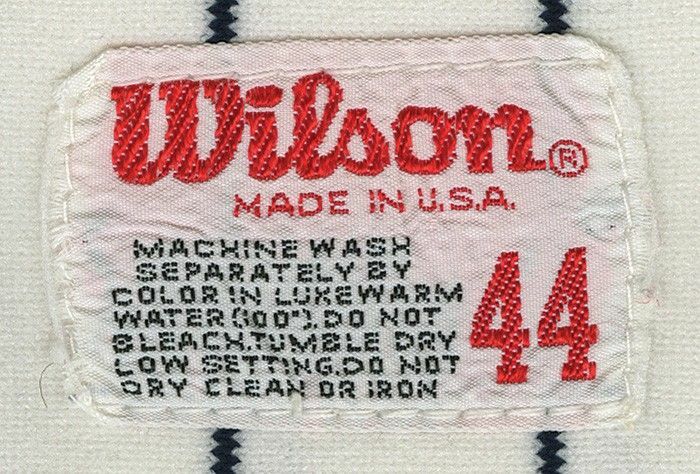 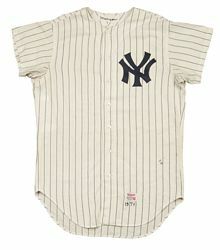 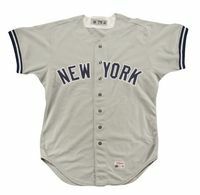 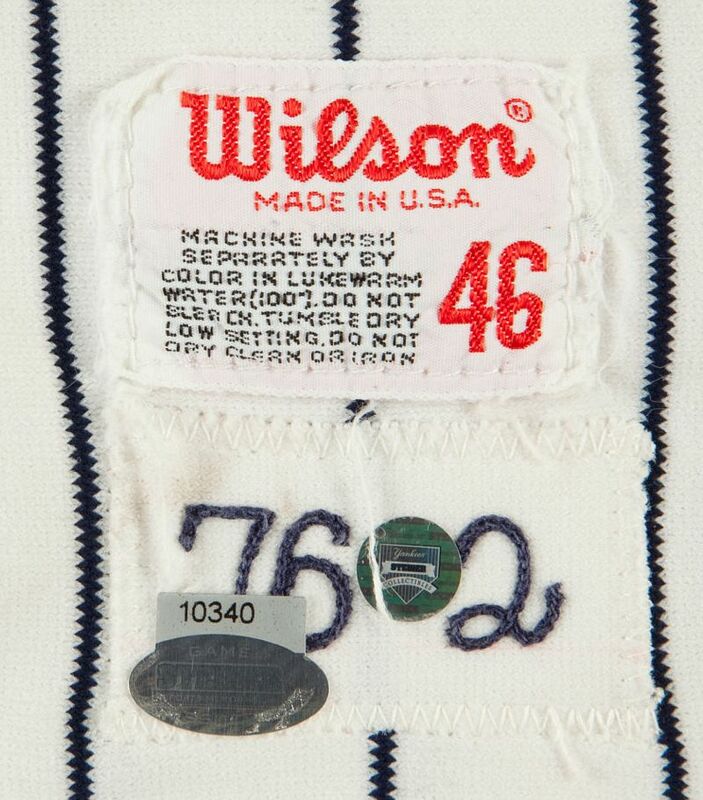 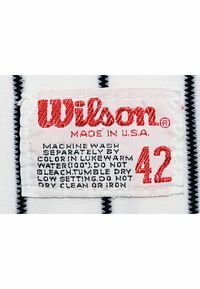 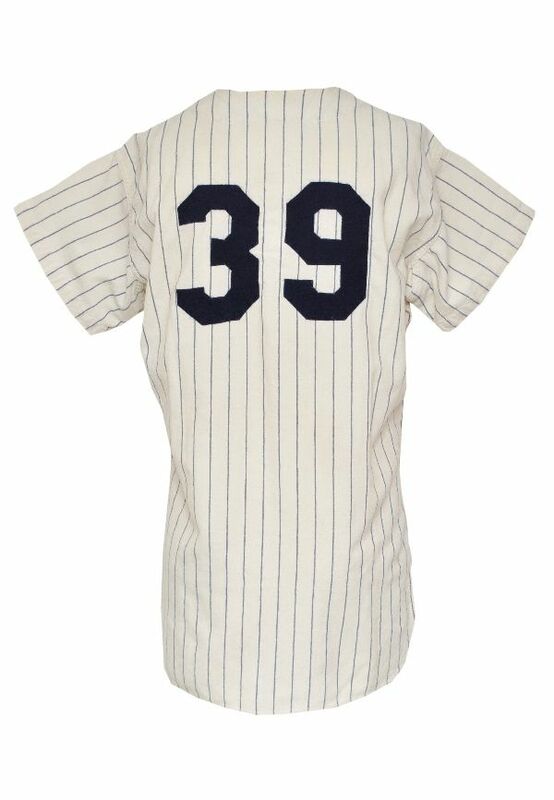 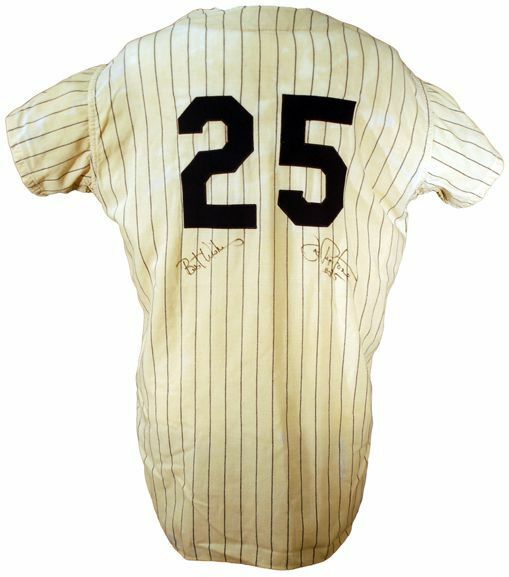 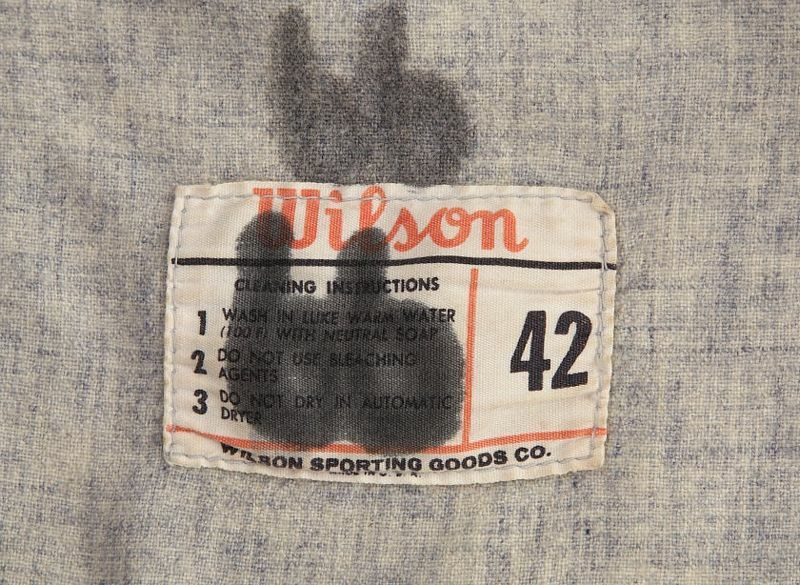 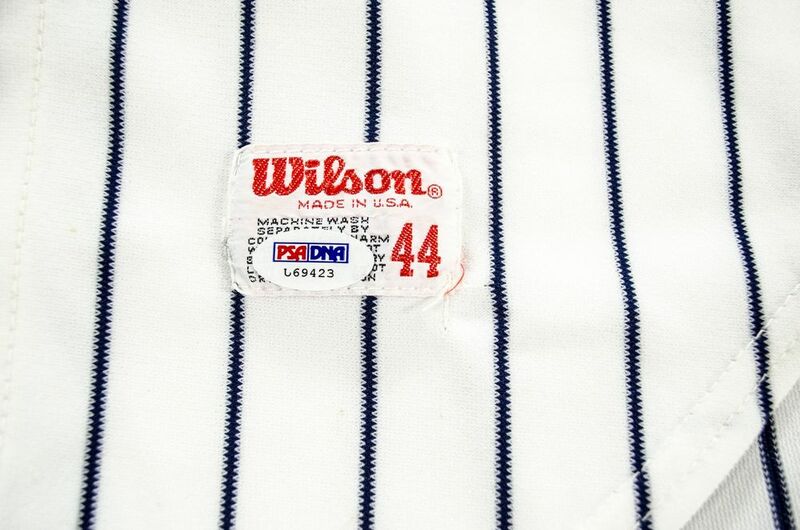 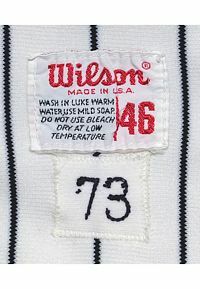 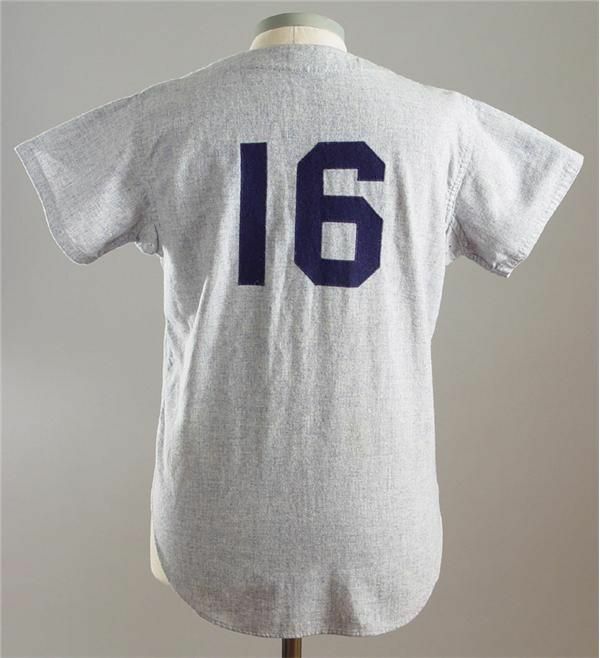 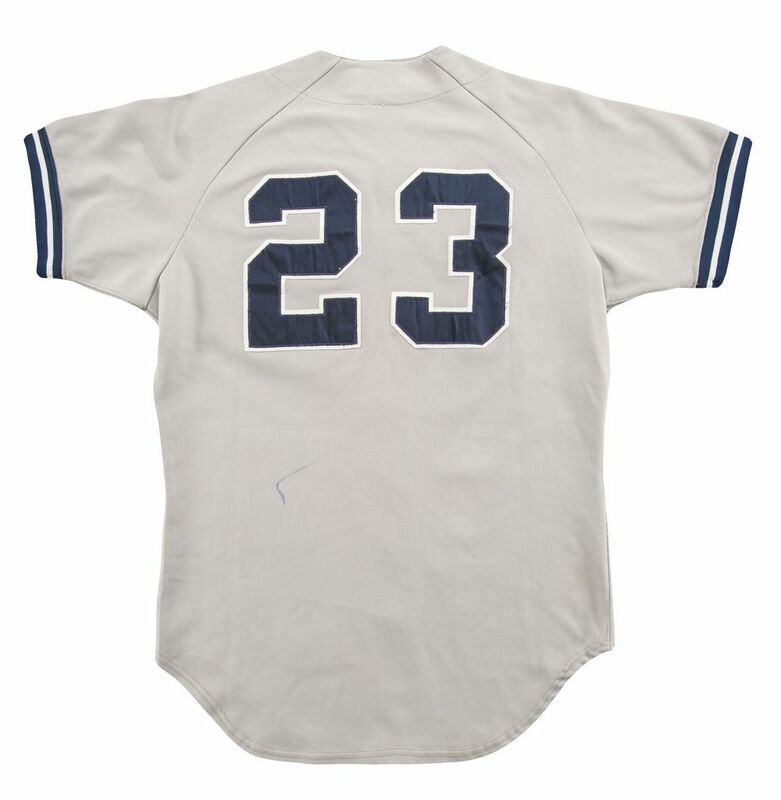 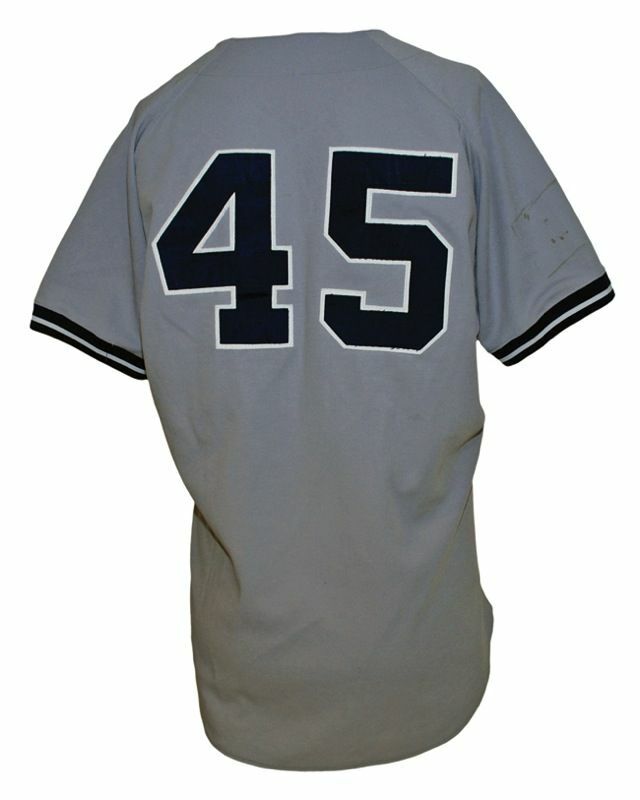 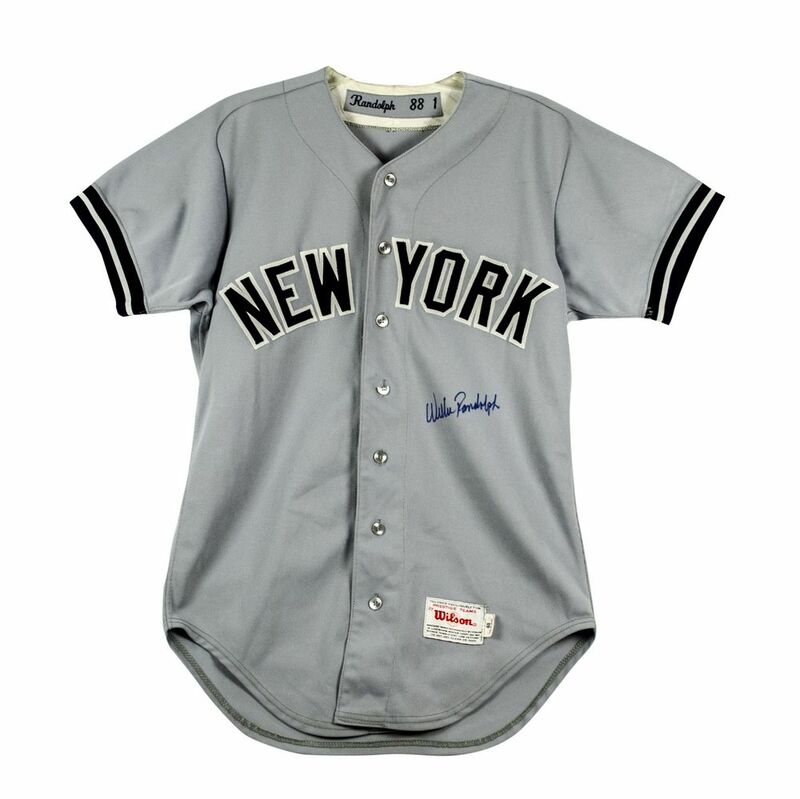 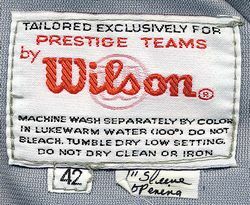 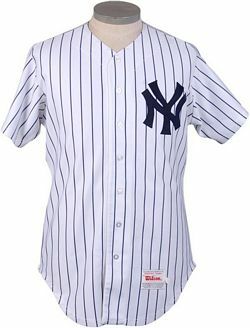 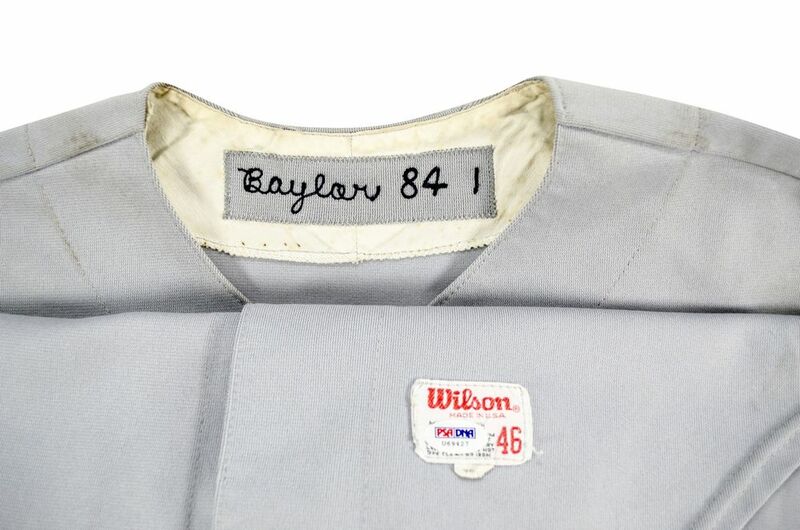 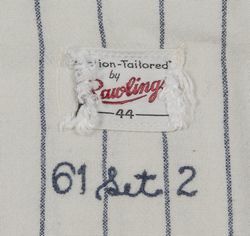 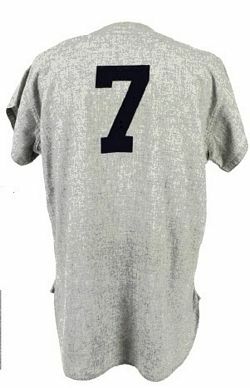 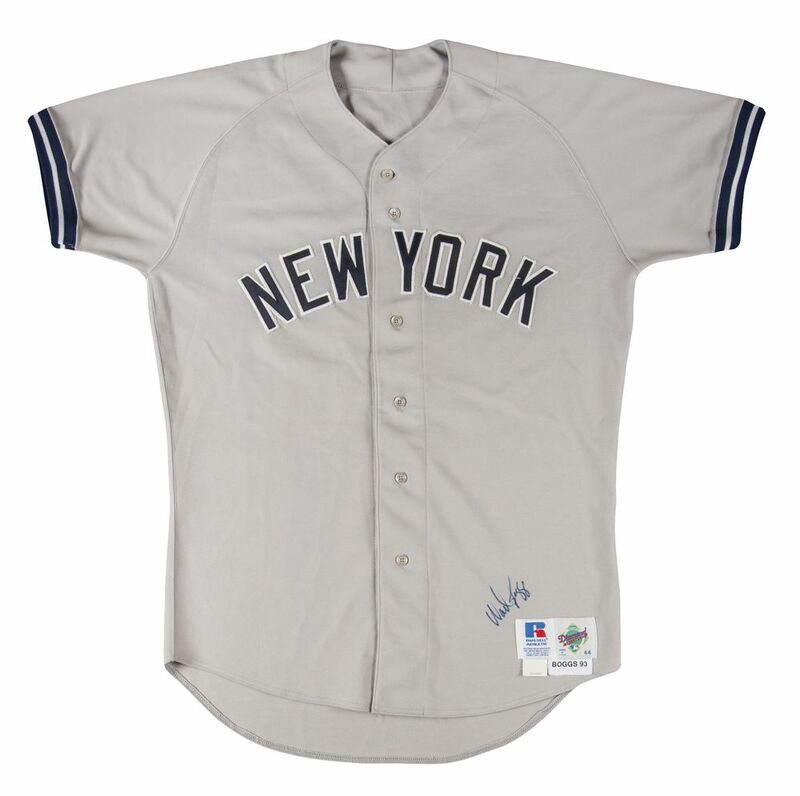 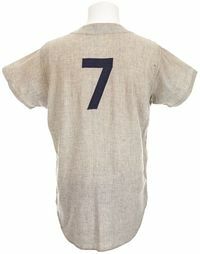 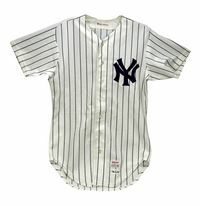 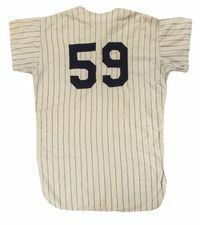 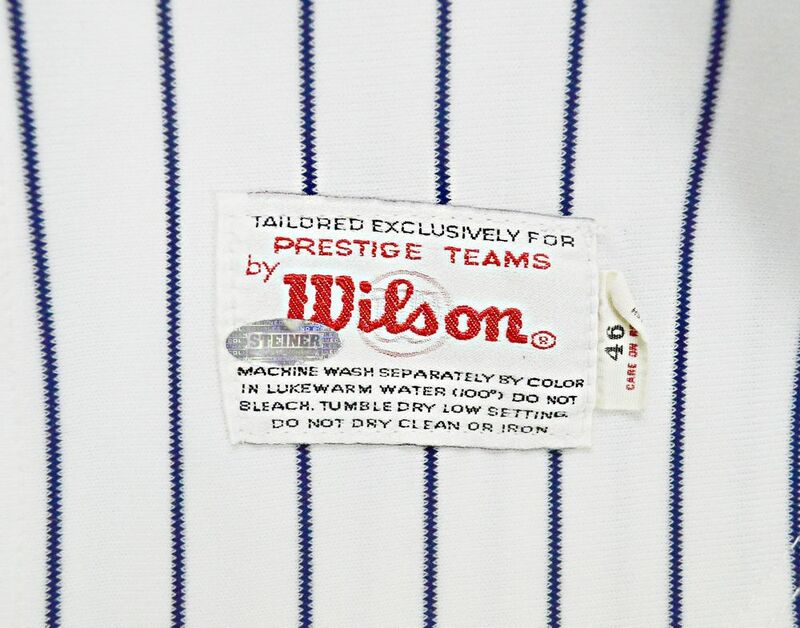 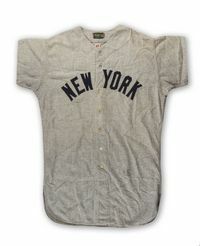 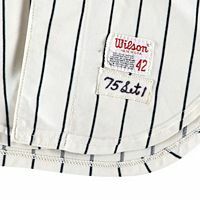 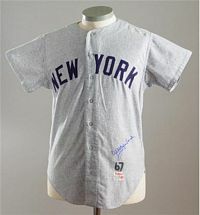 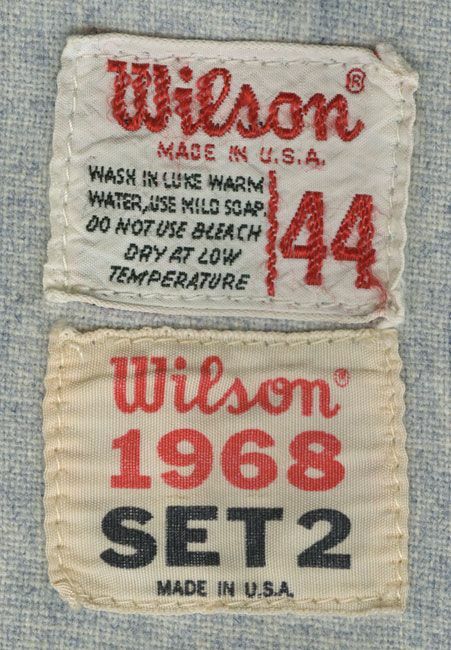 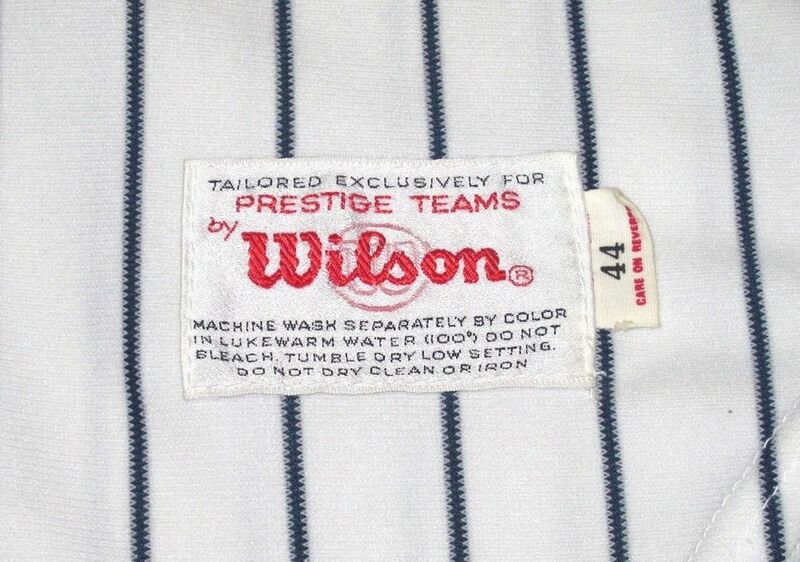 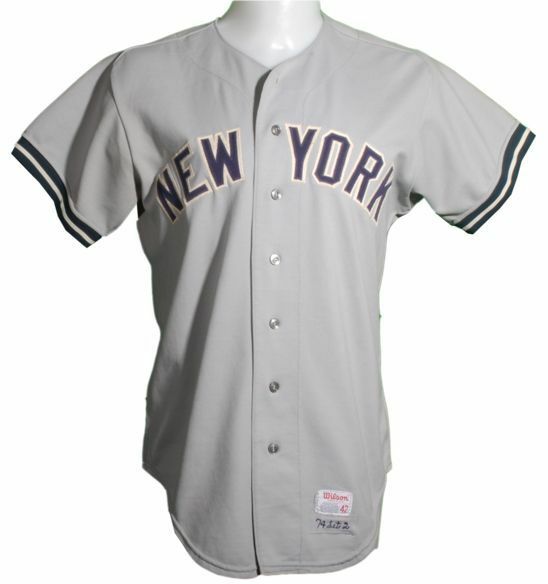 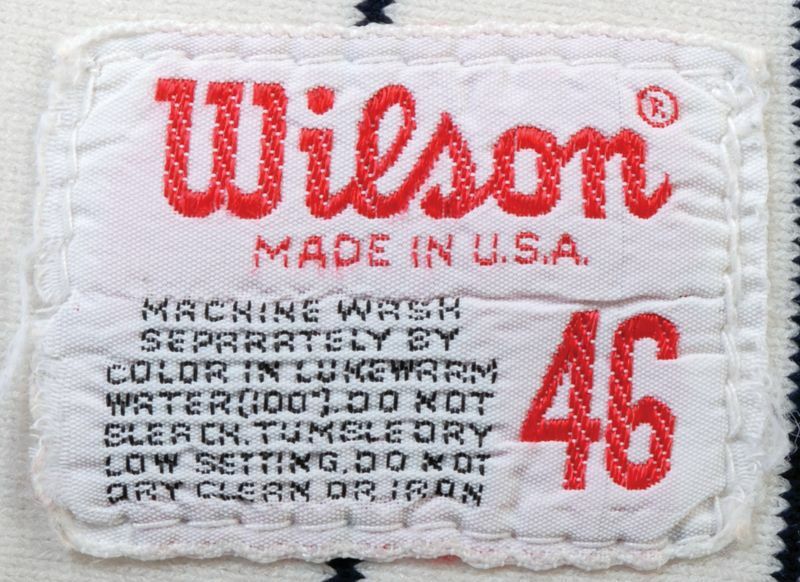 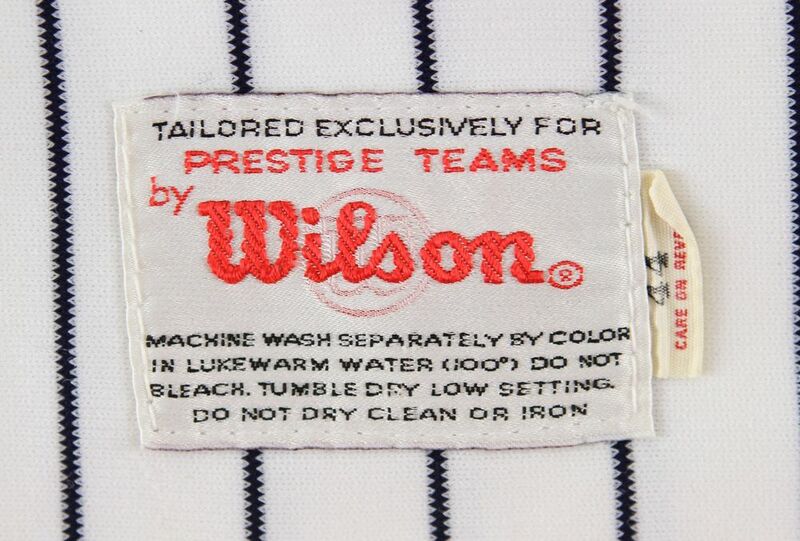 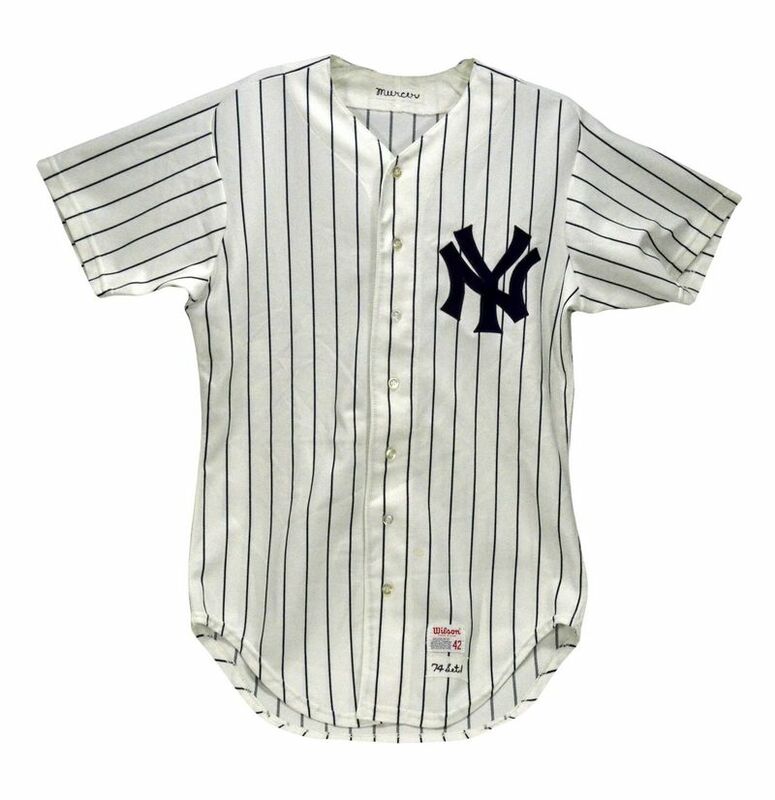 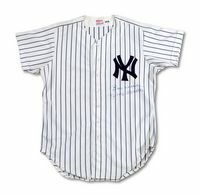 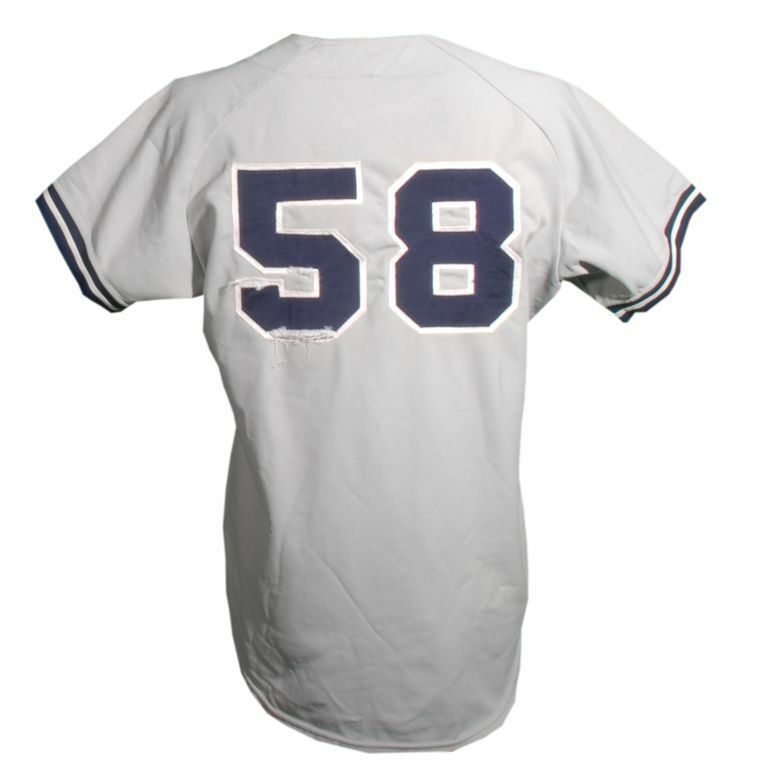 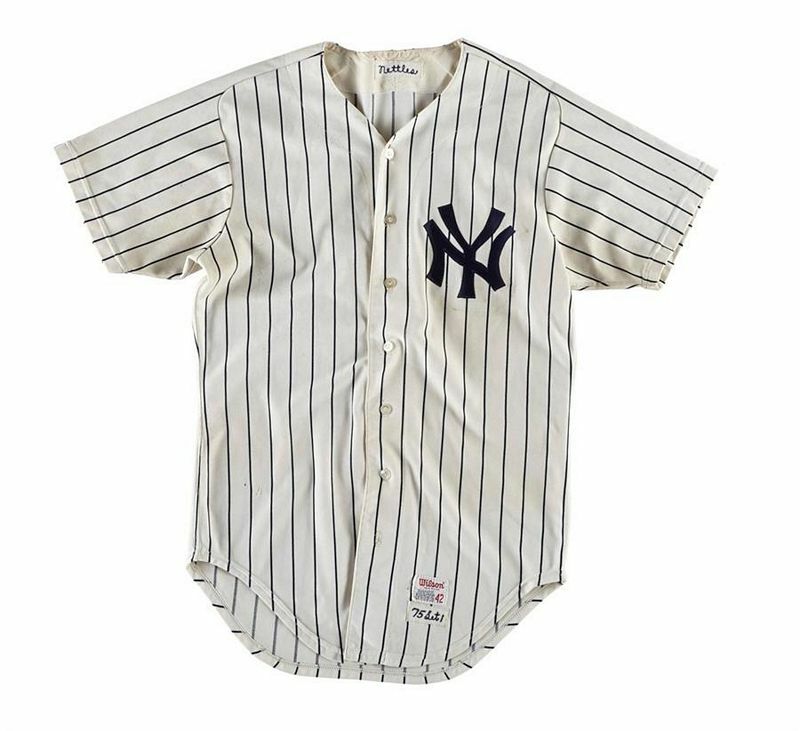 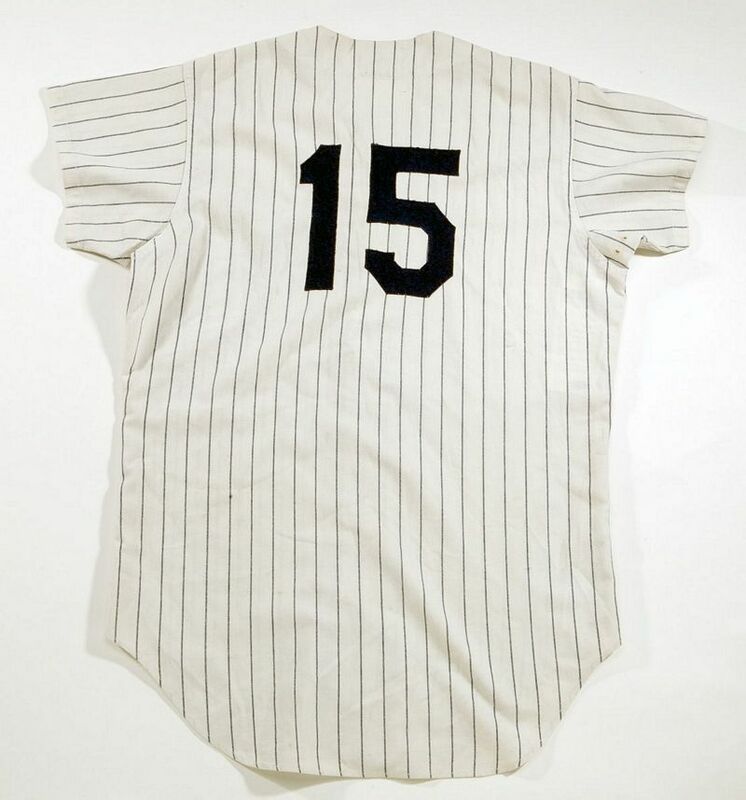 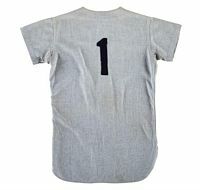 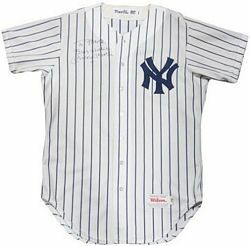 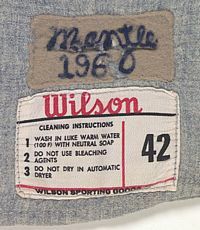 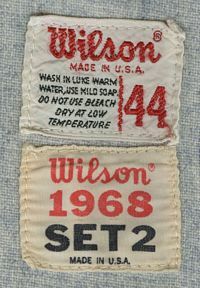 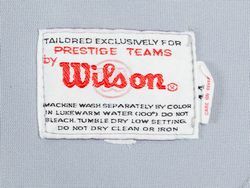 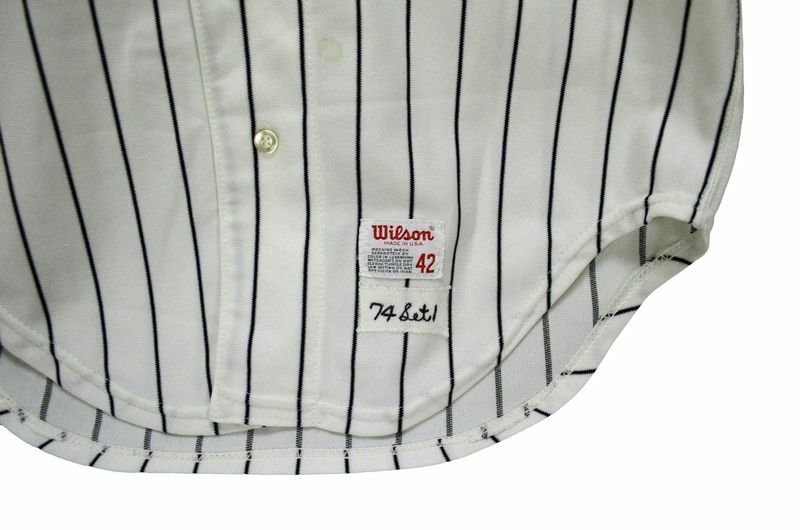 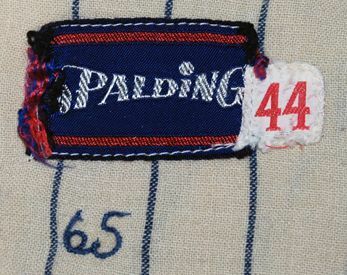 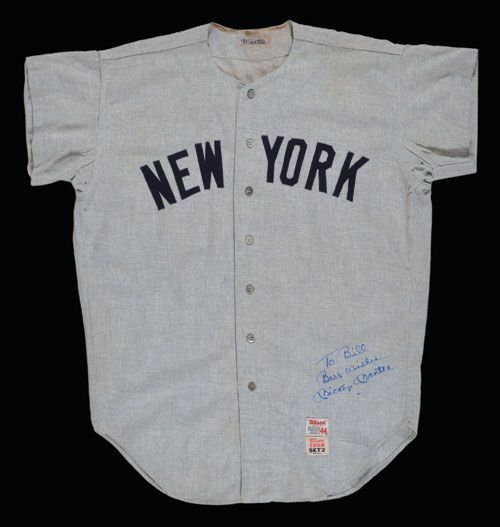 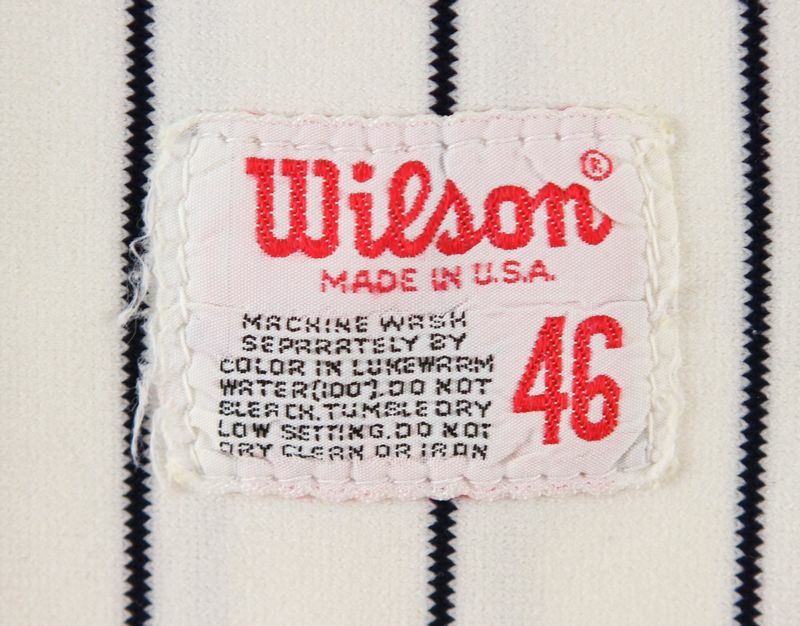 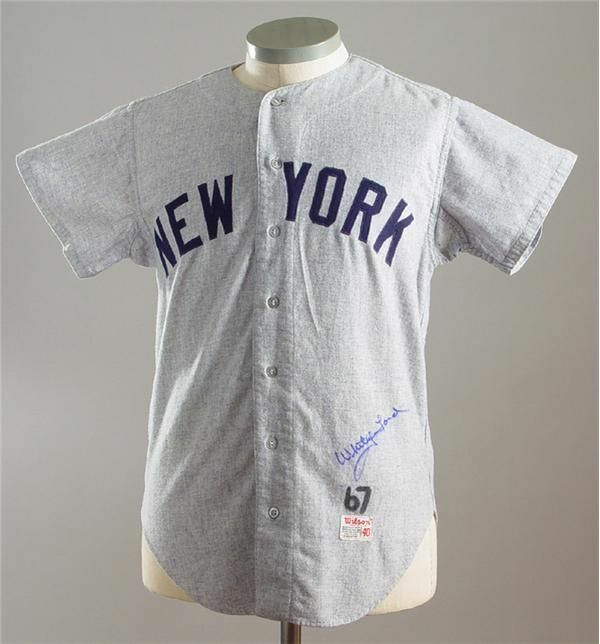 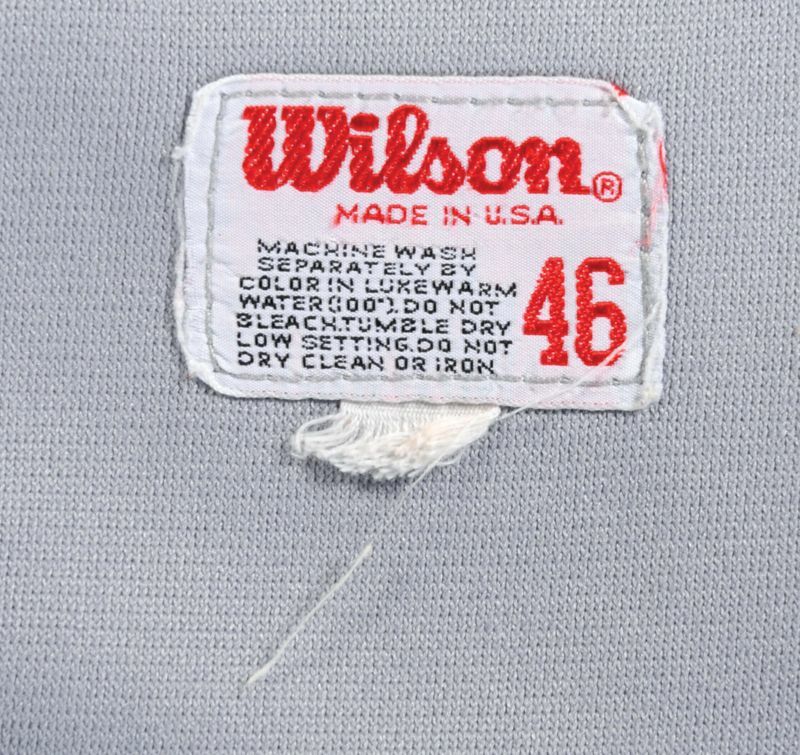 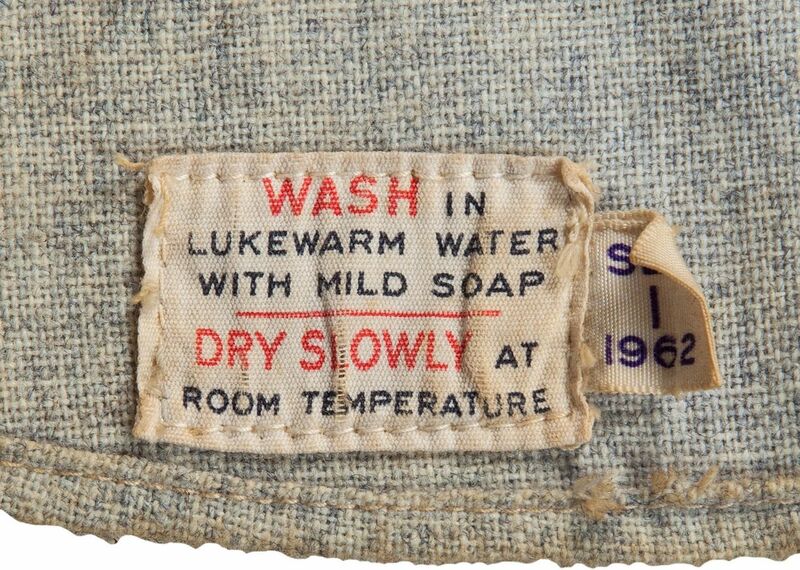 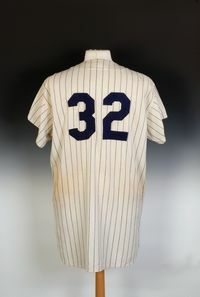 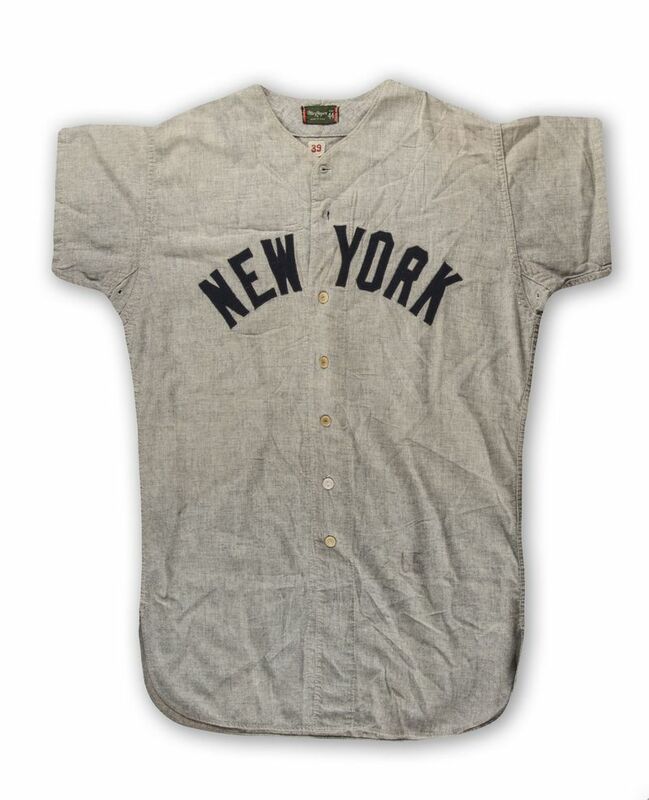 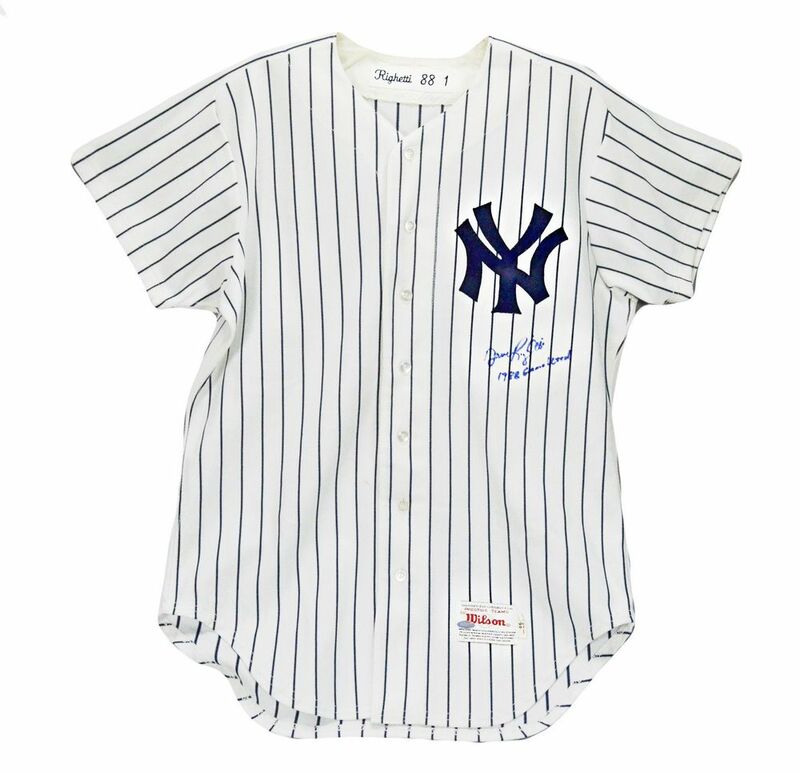 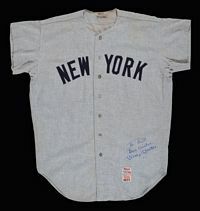 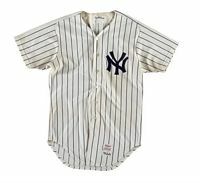 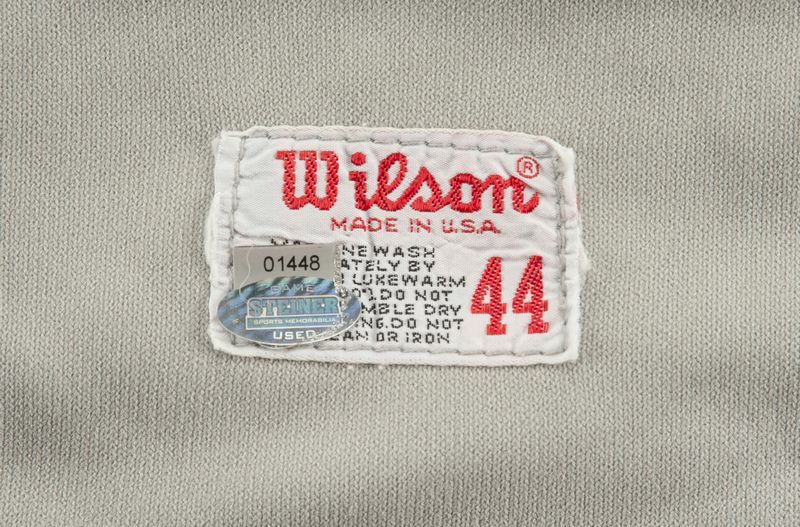 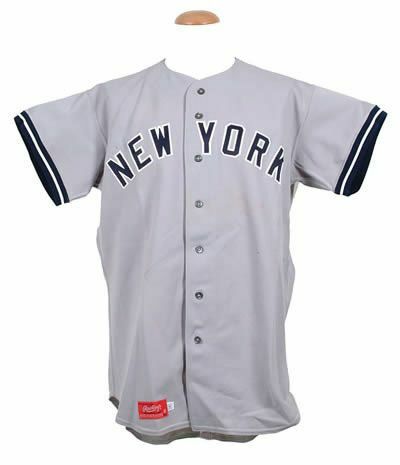 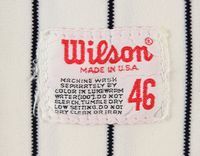 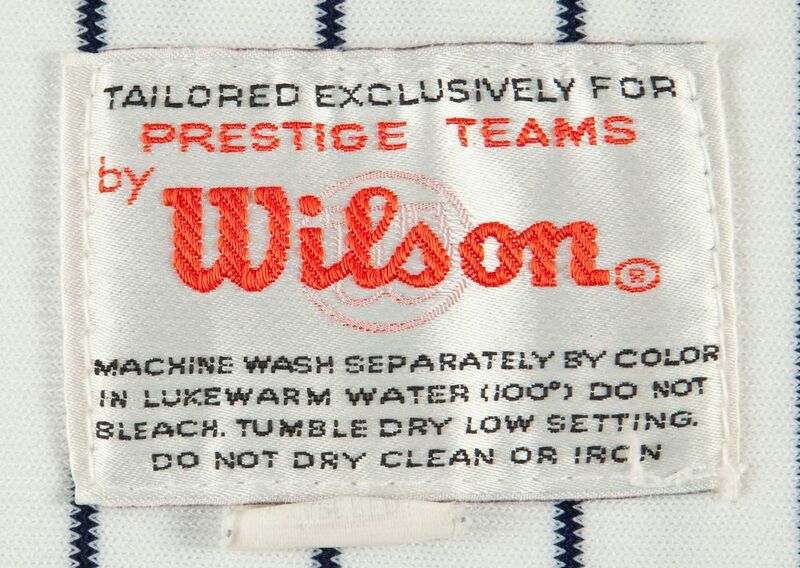 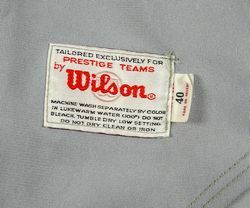 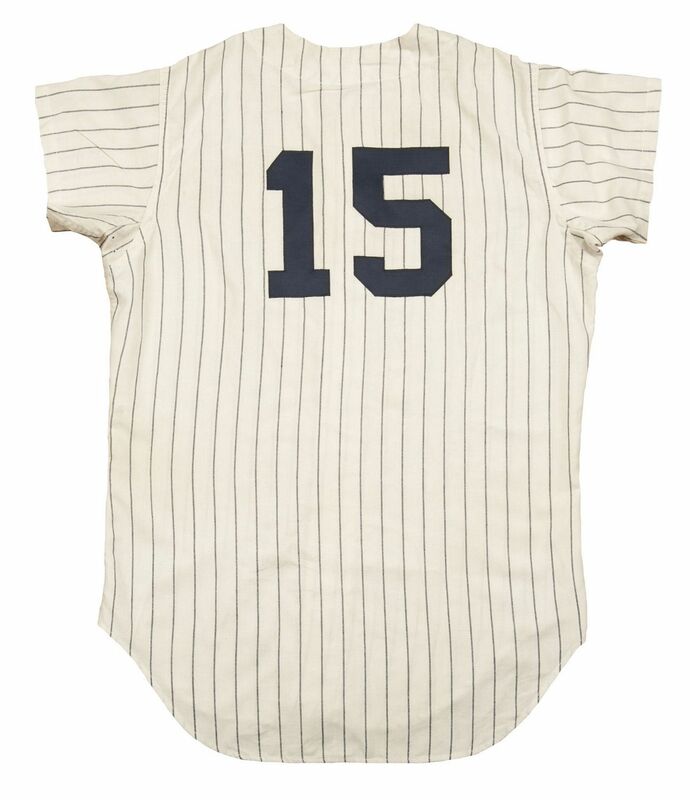 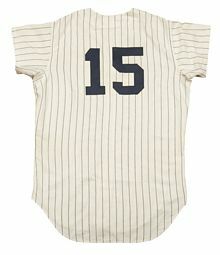 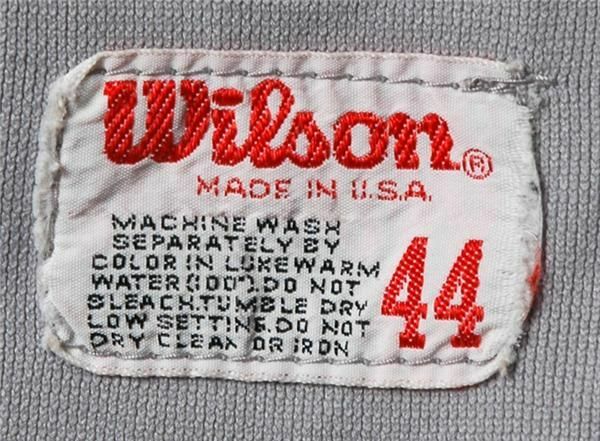 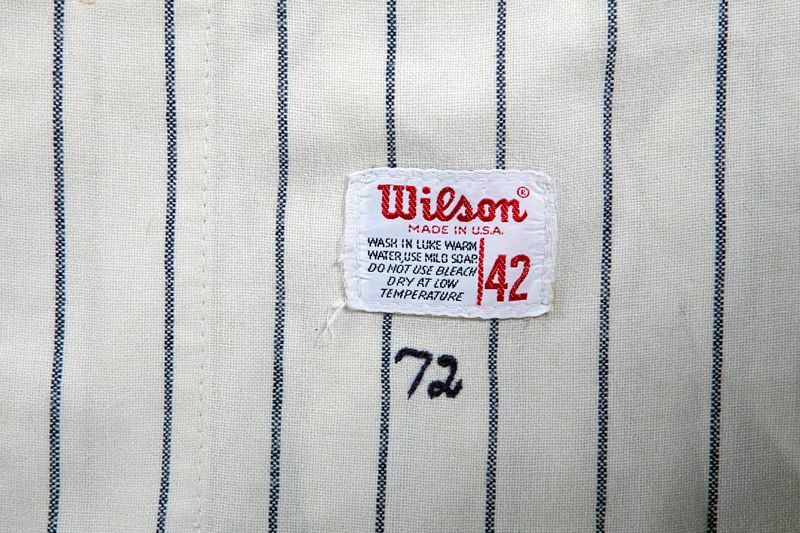 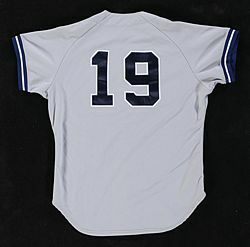 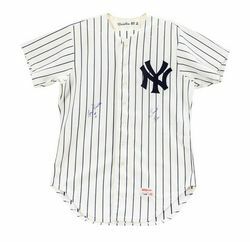 1965 Wilson jerseys were used in the 1964 World Series. 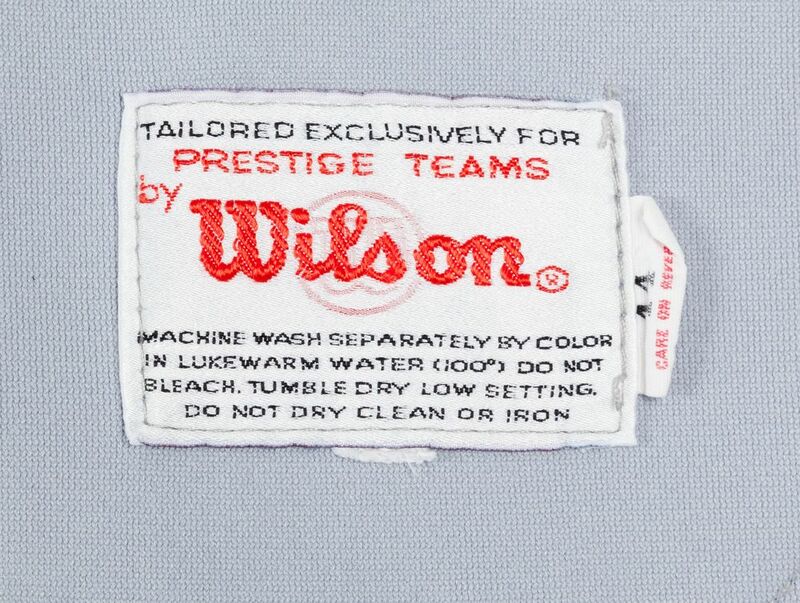 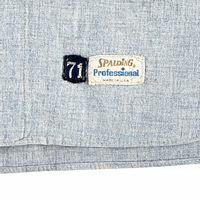 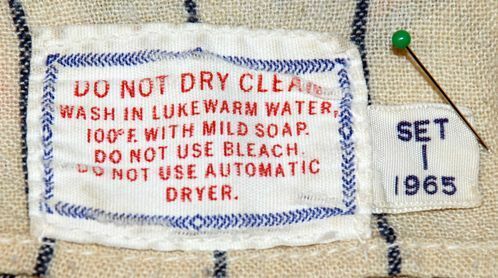 Switch to double knit. 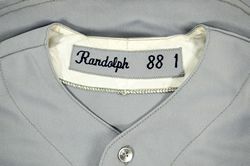 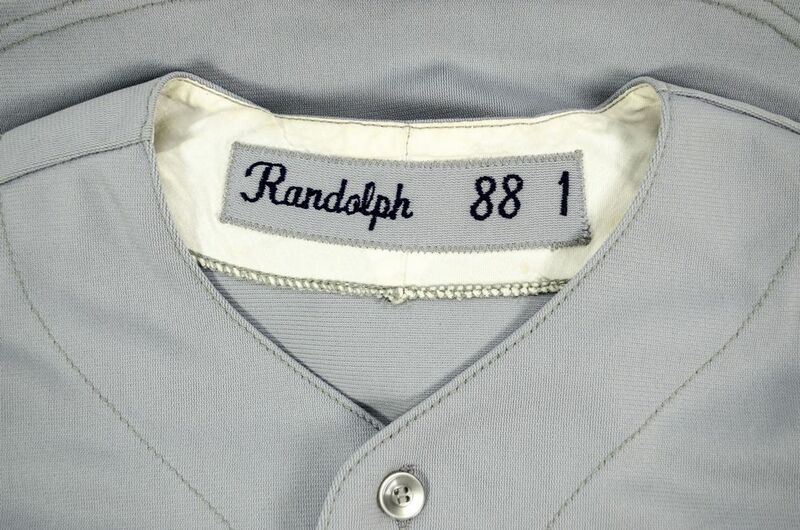 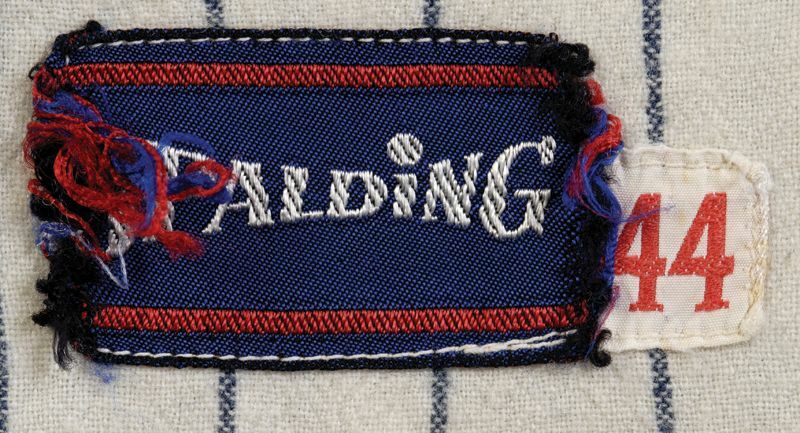 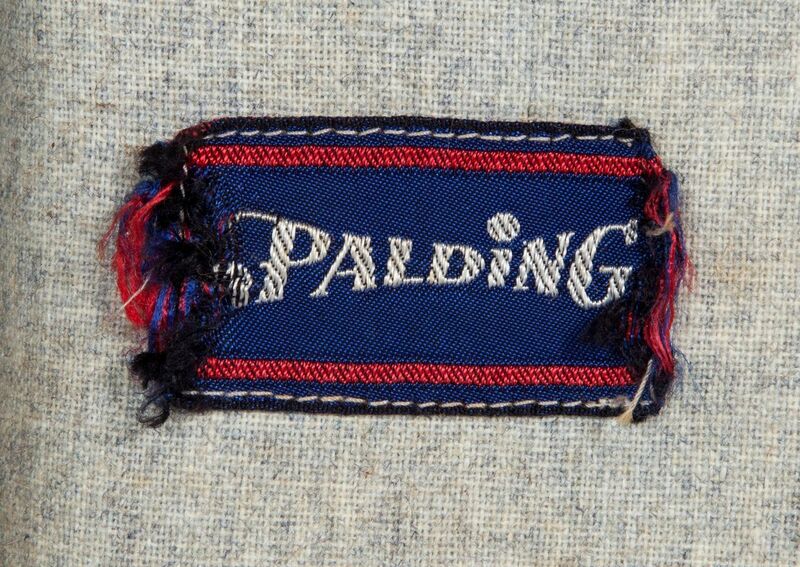 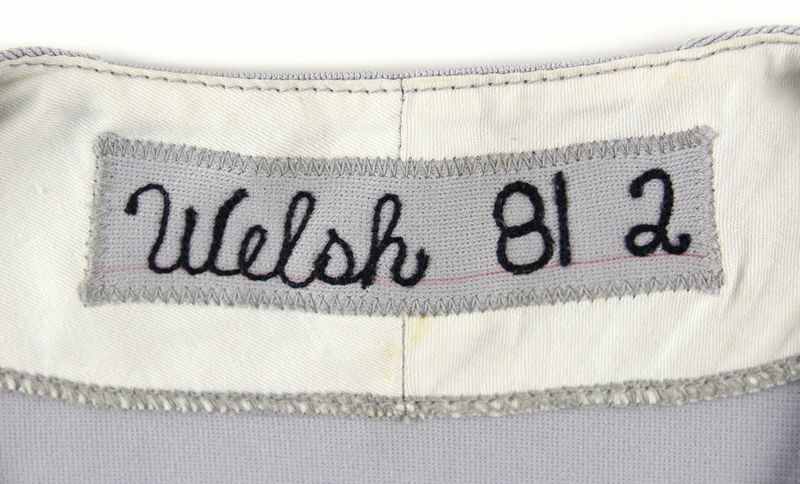 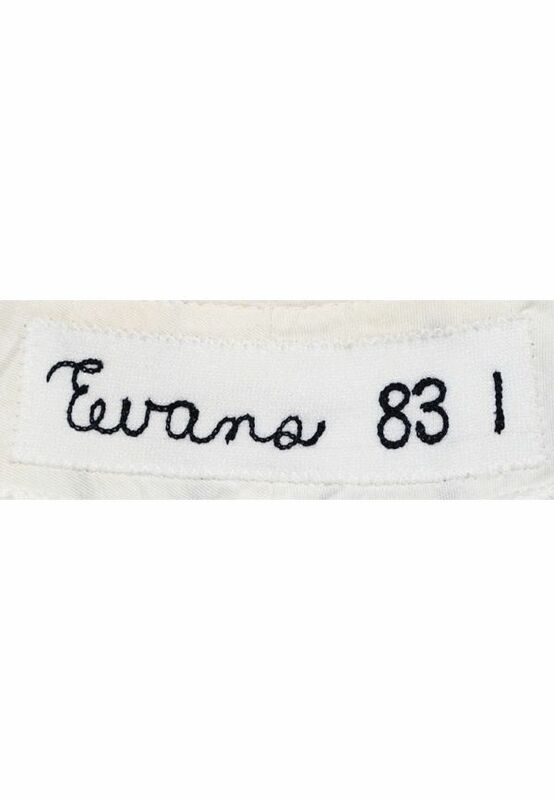 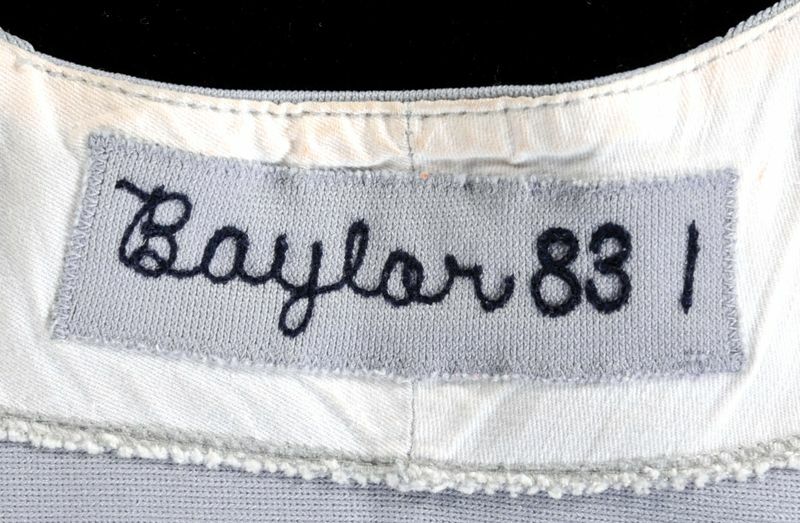 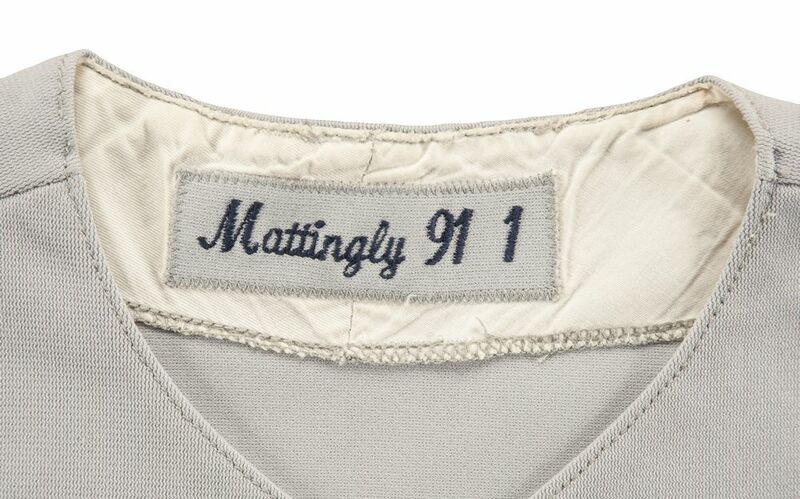 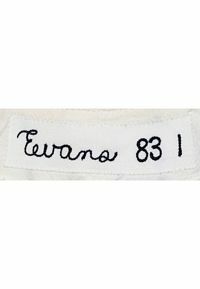 Road jersey gets sleeve trim and a white outline around lettering. 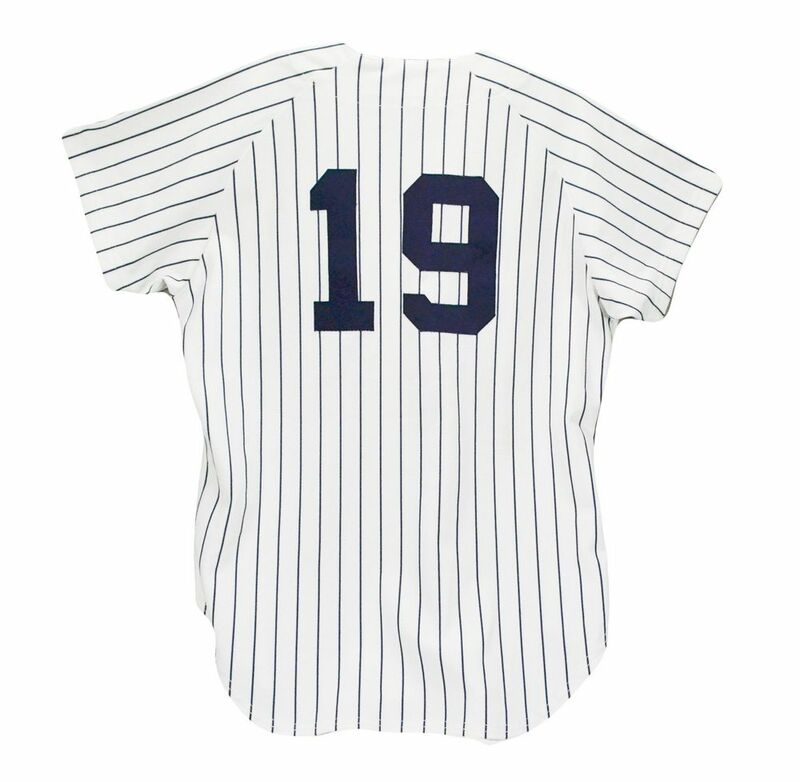 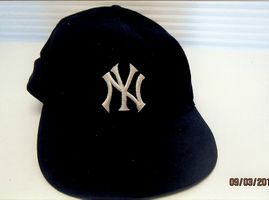 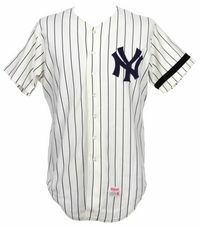 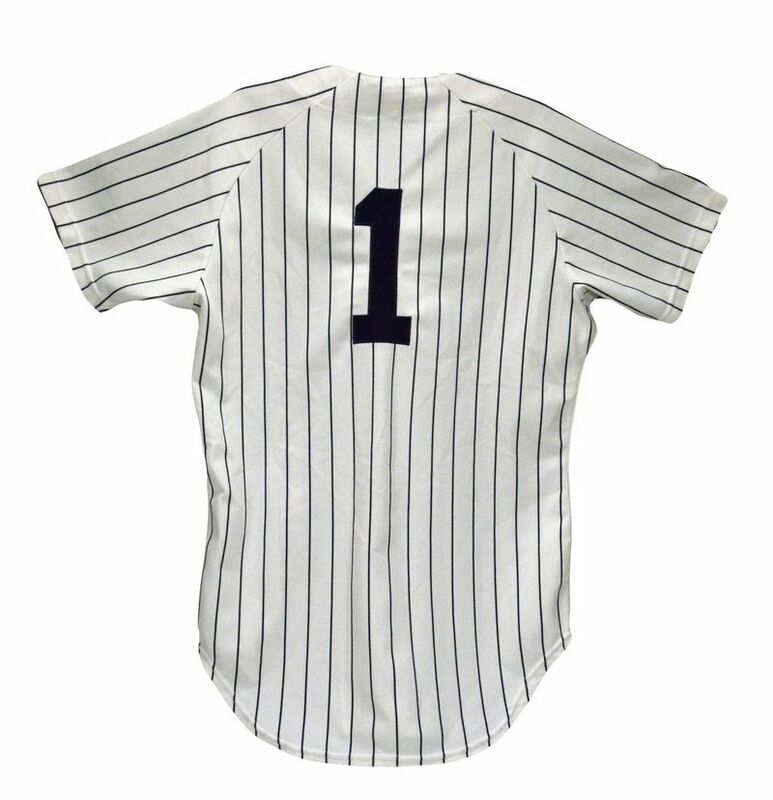 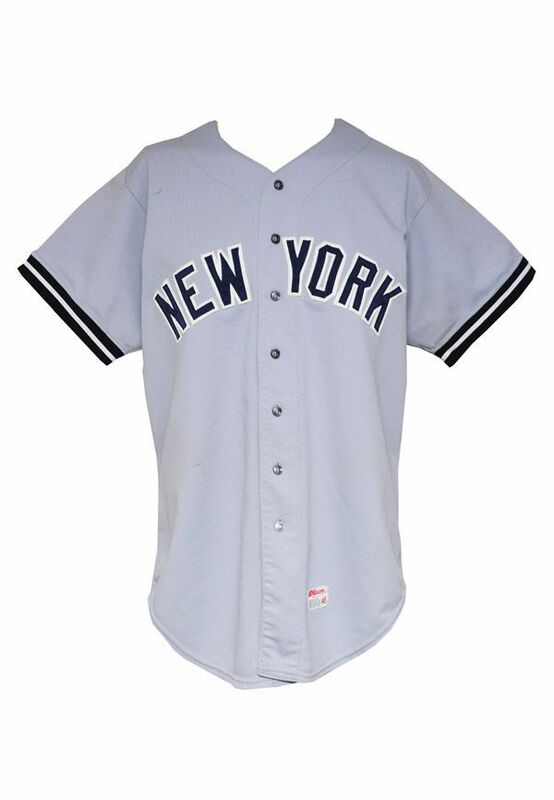 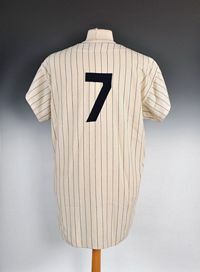 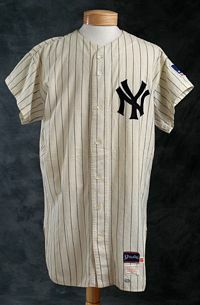 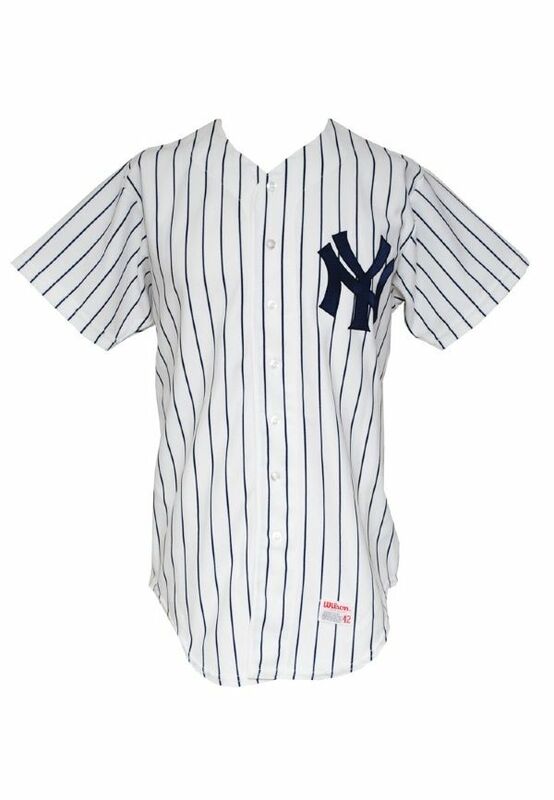 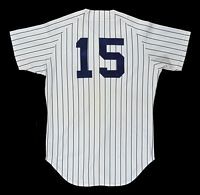 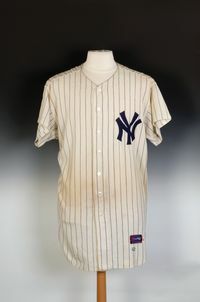 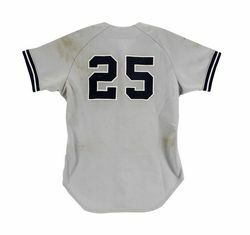 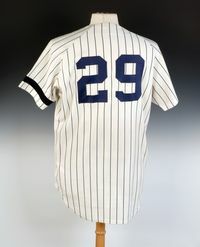 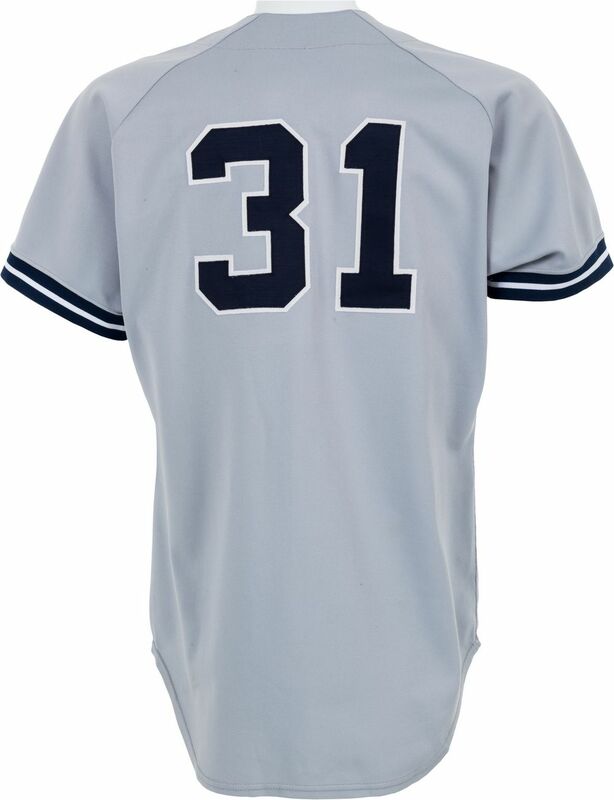 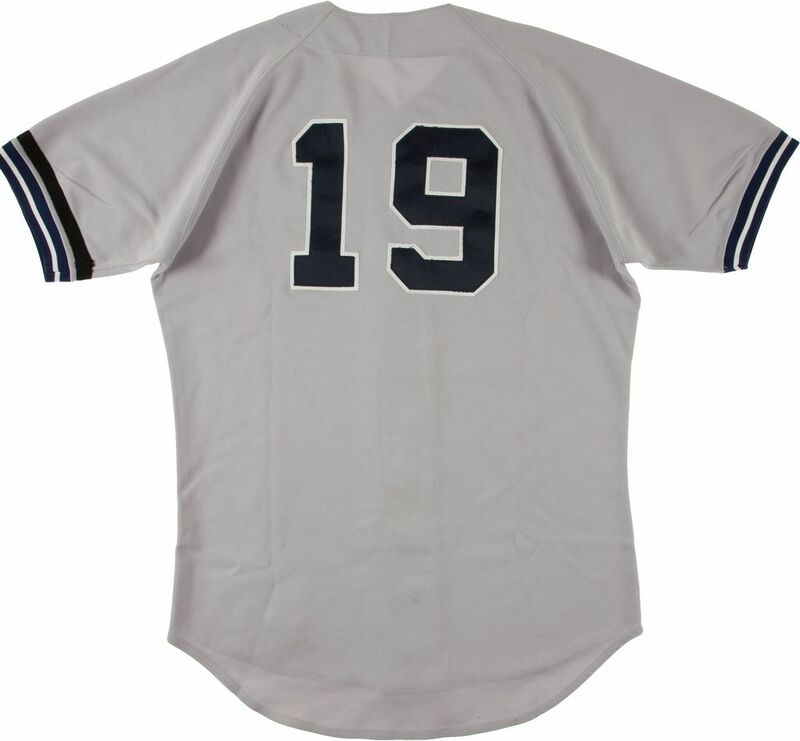 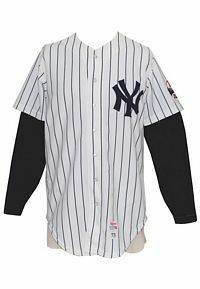 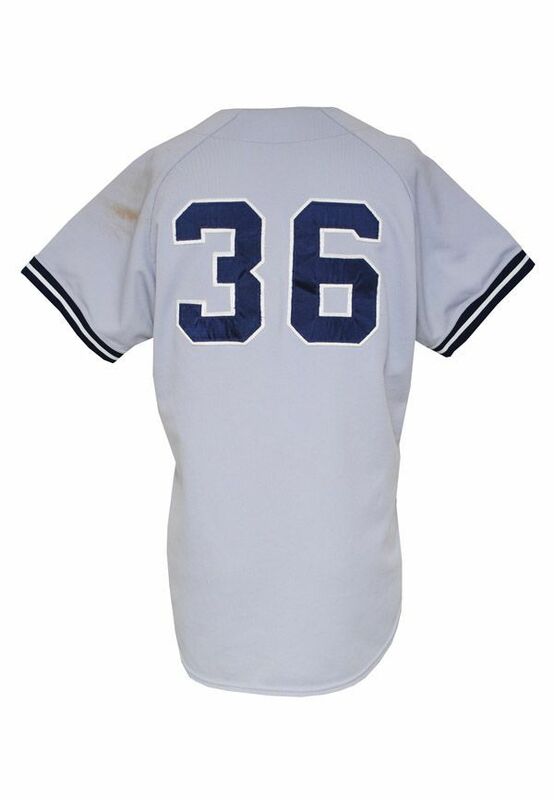 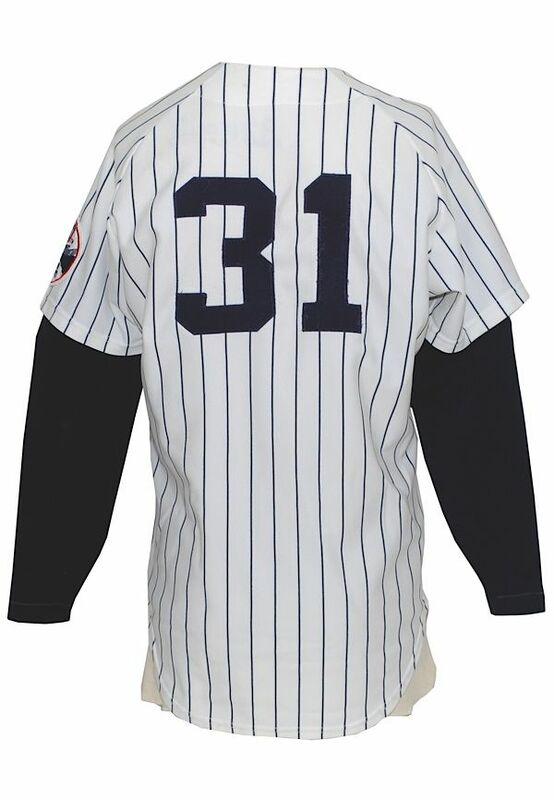 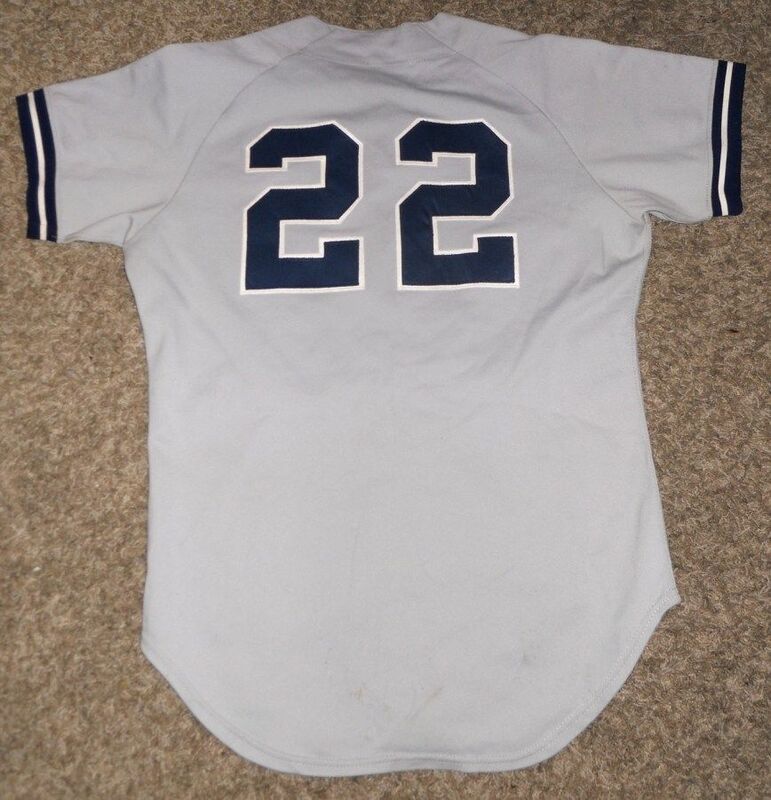 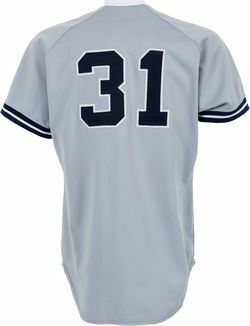 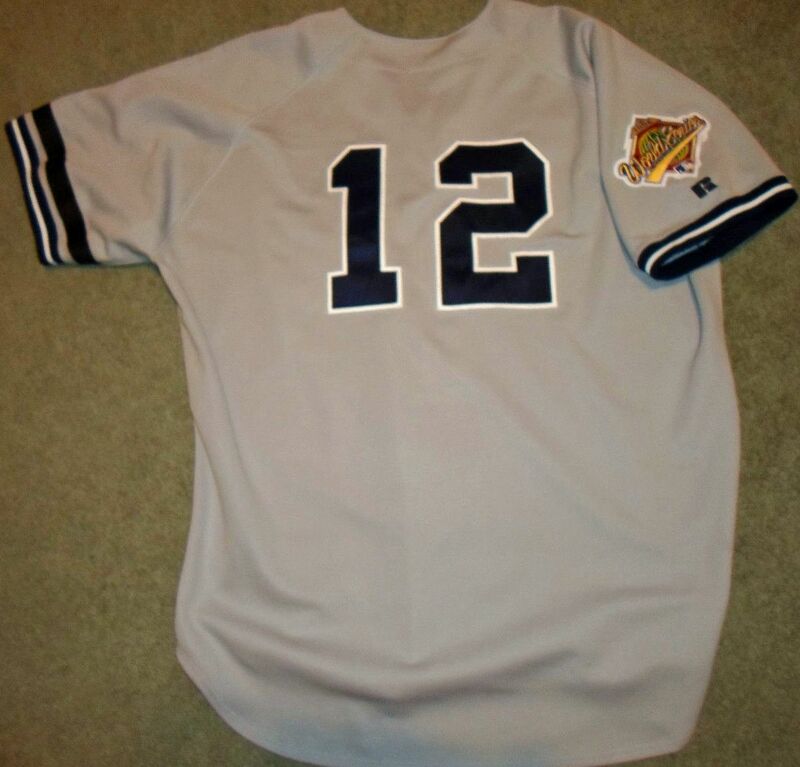 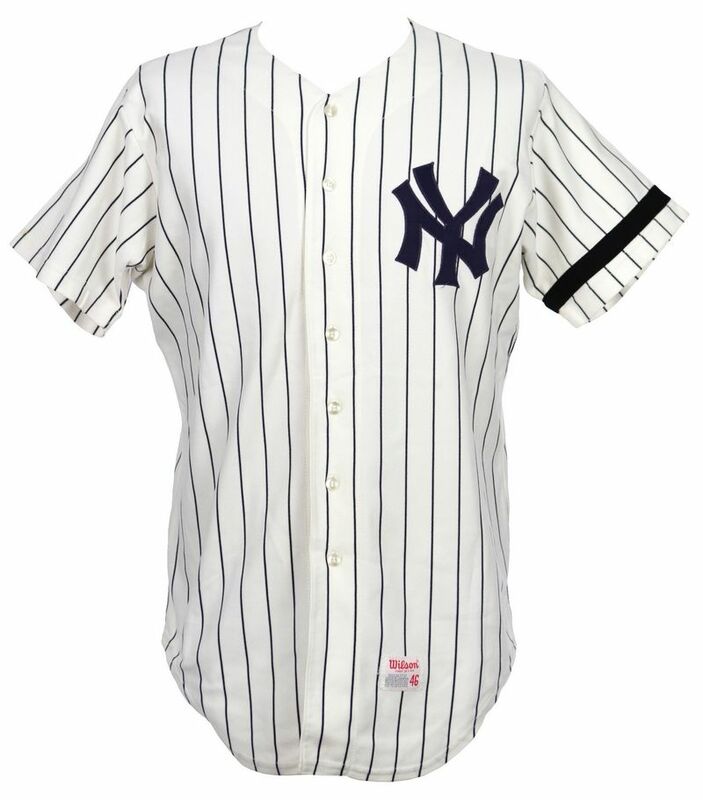 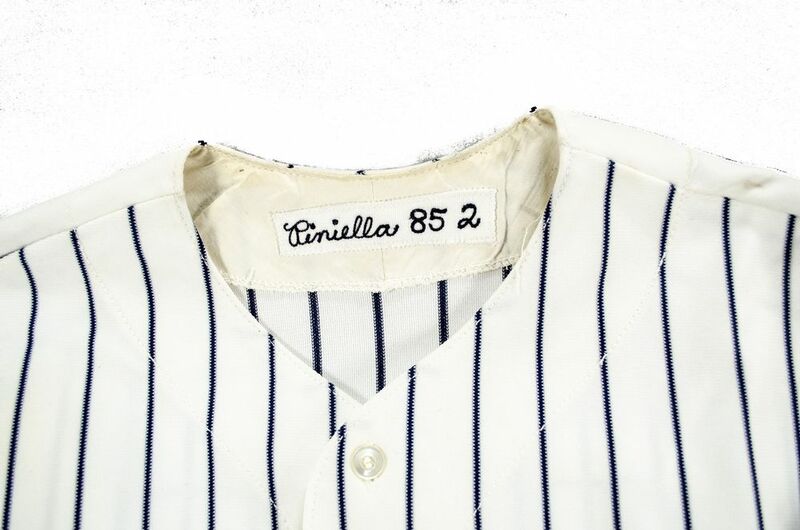 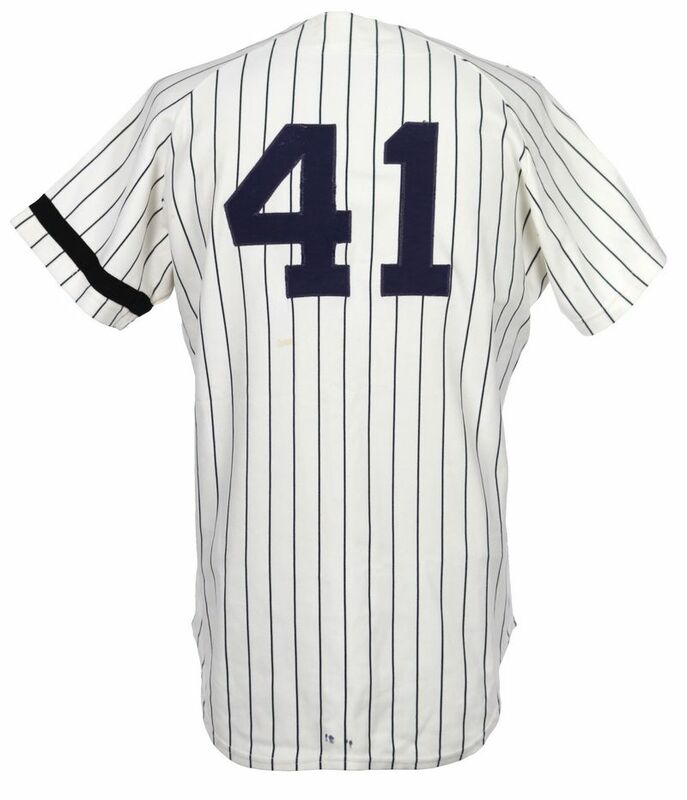 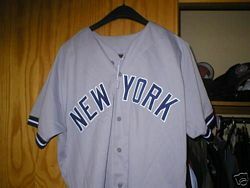 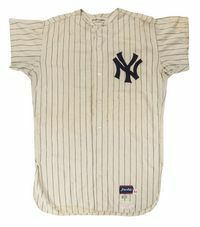 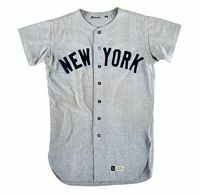 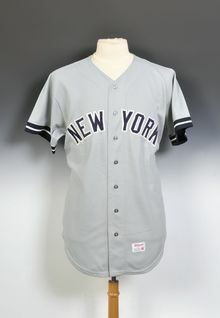 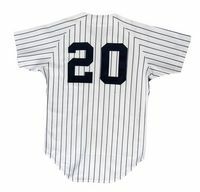 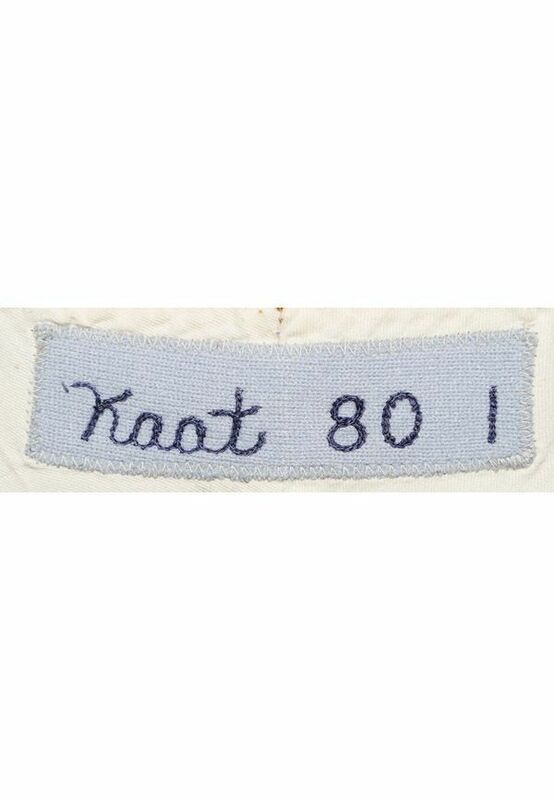 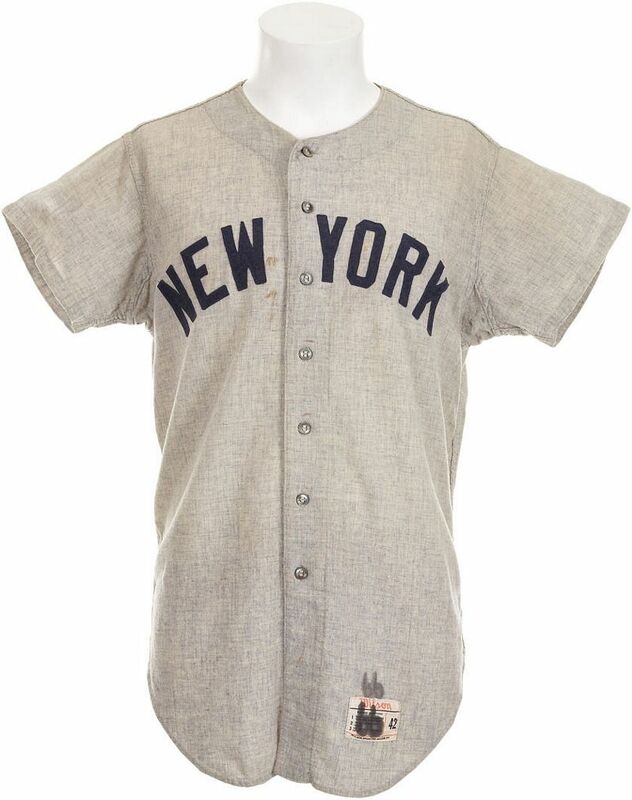 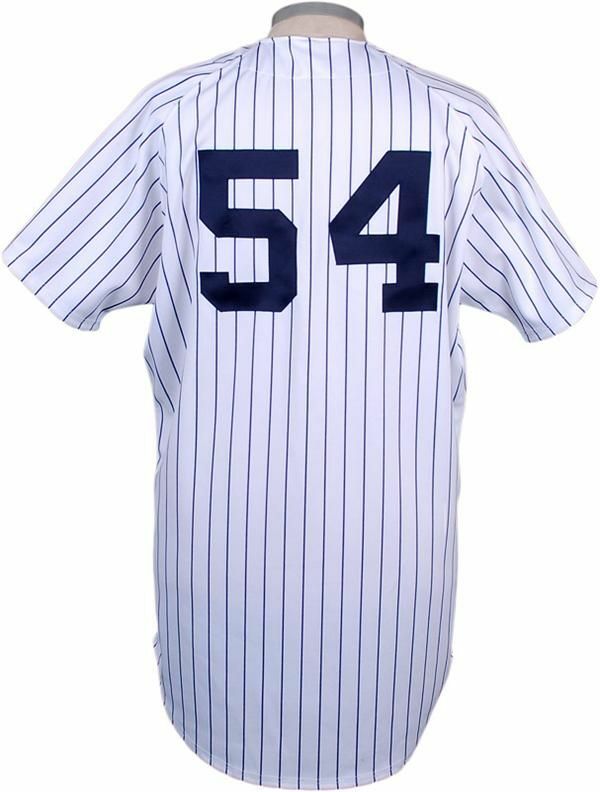 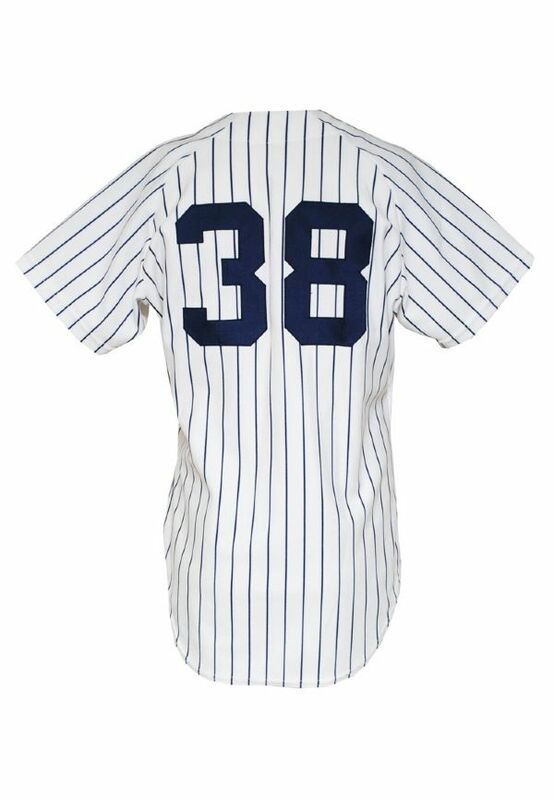 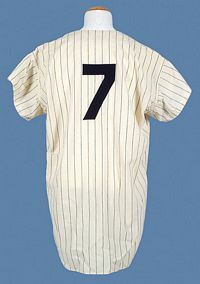 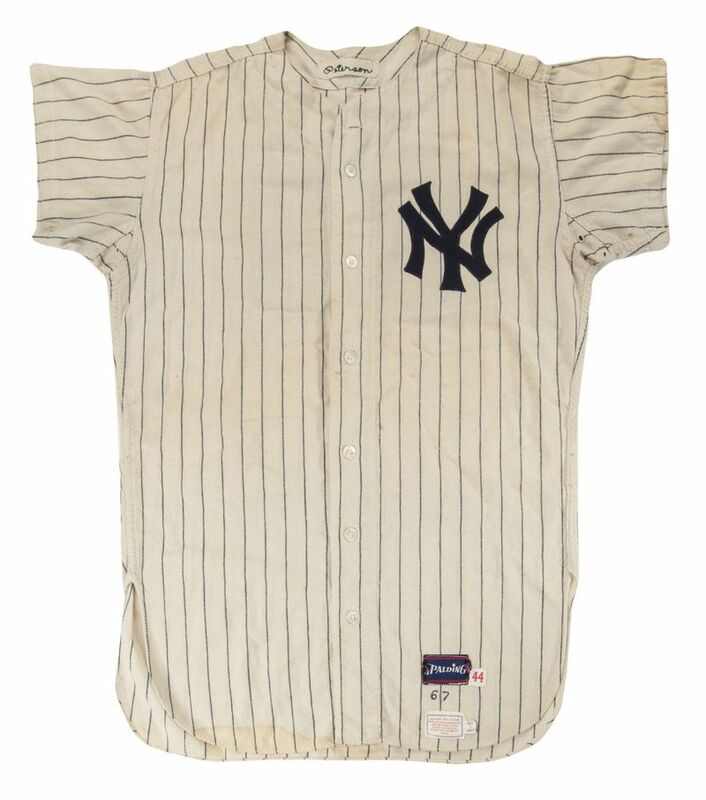 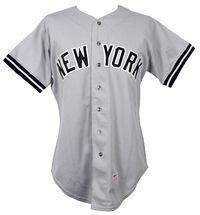 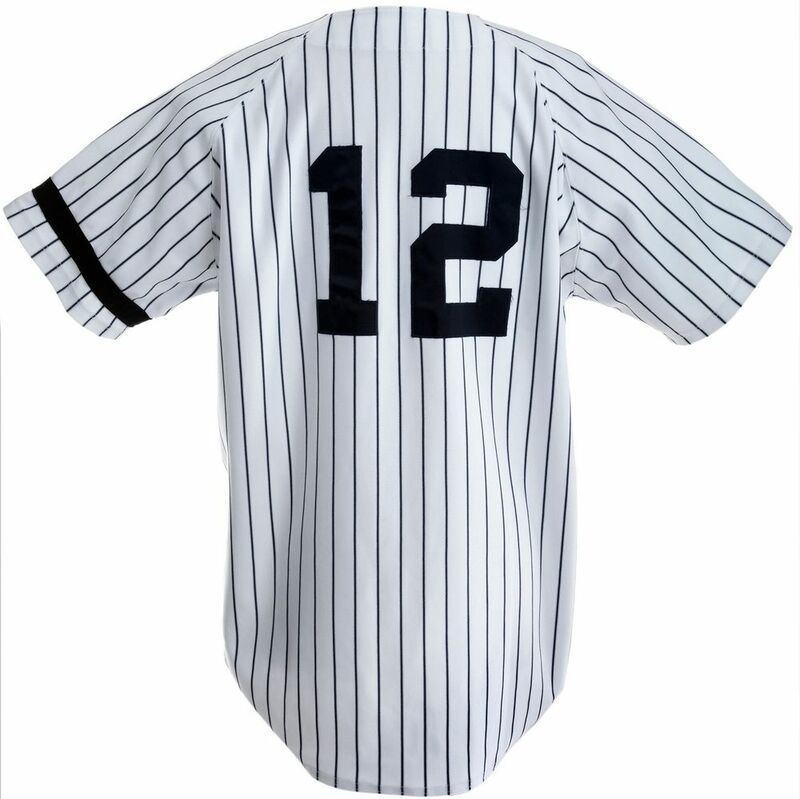 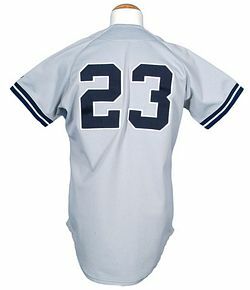 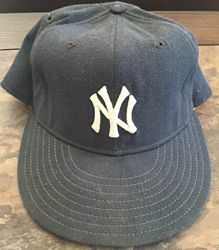 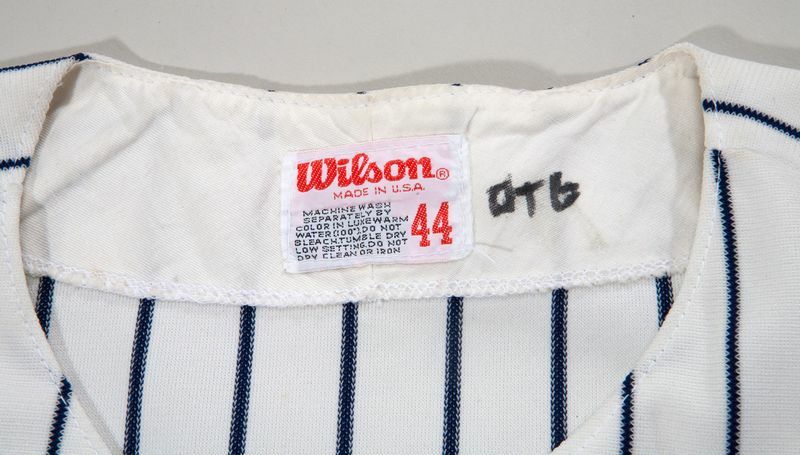 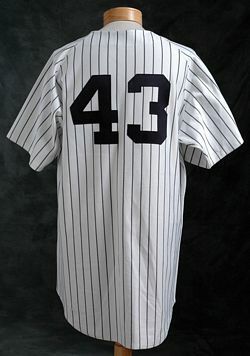 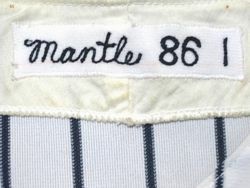 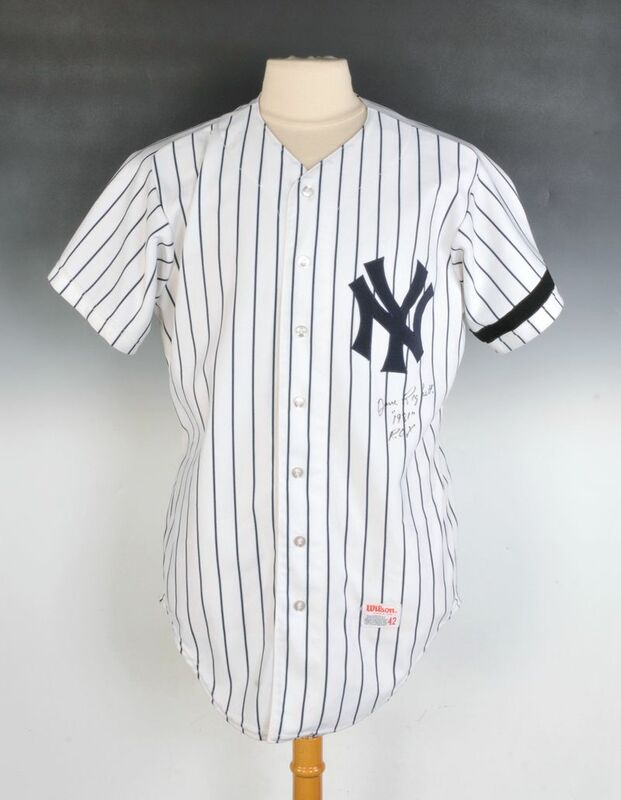 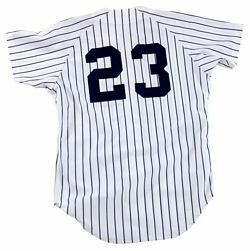 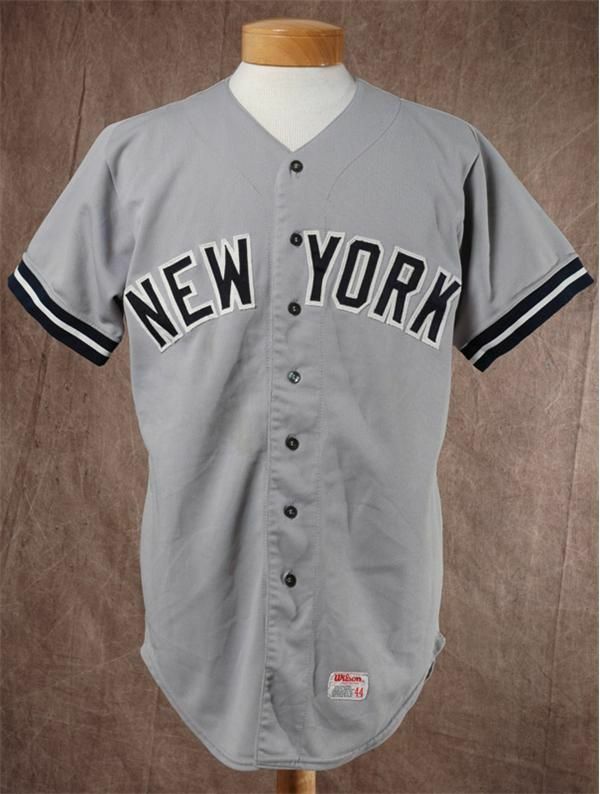 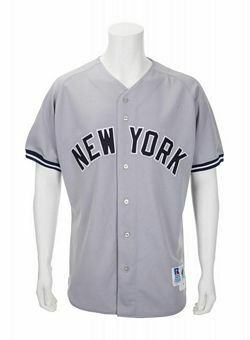 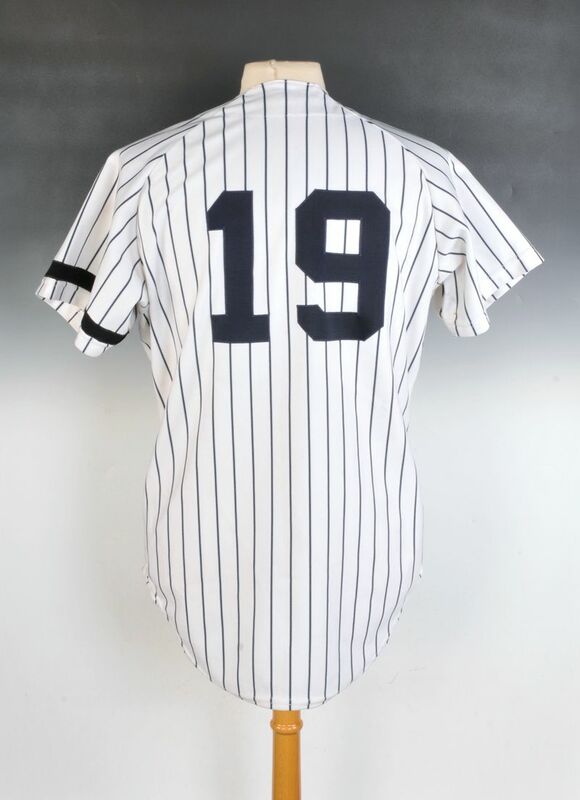 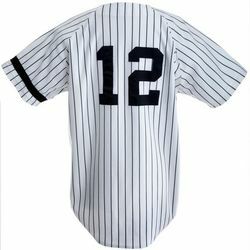 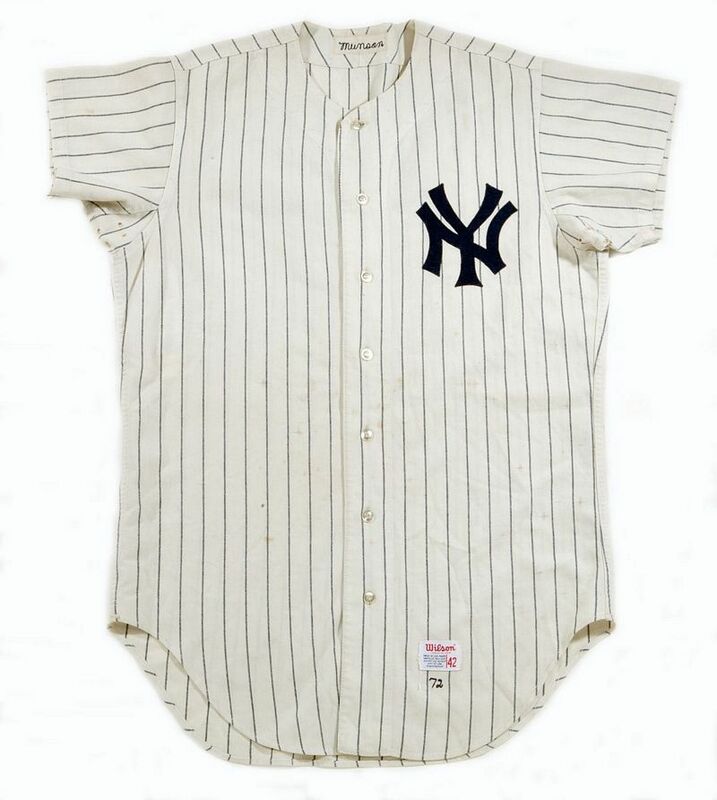 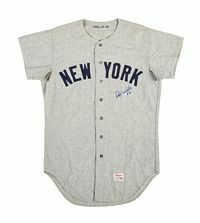 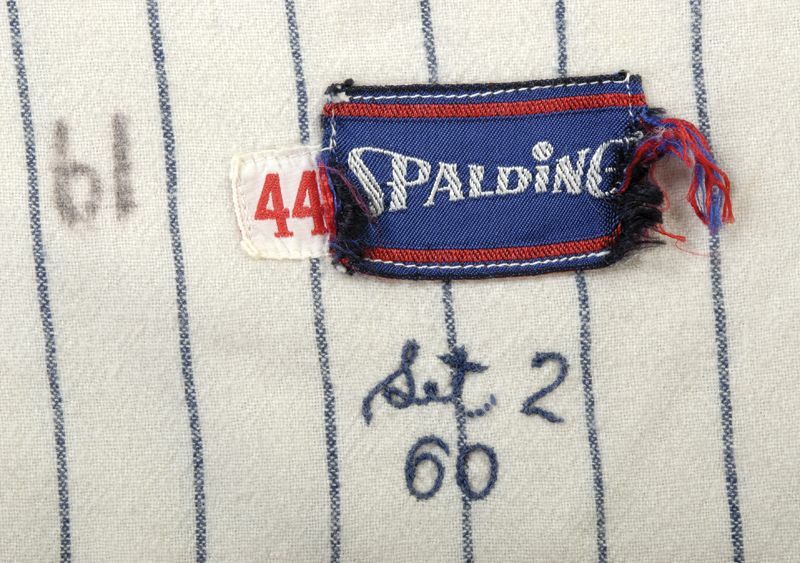 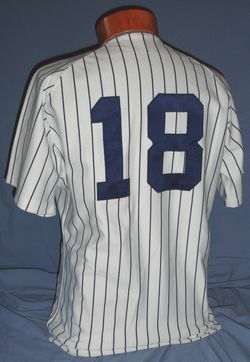 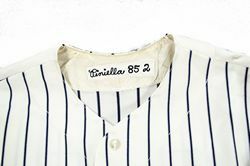 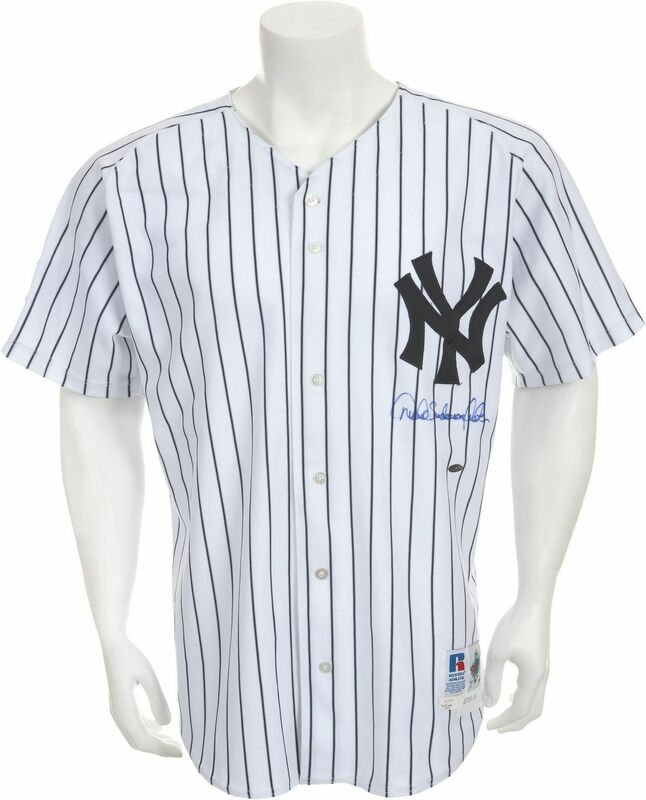 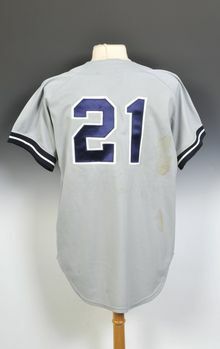 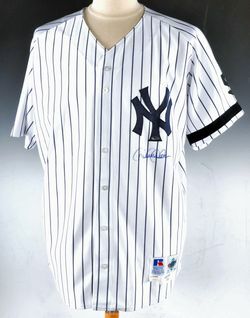 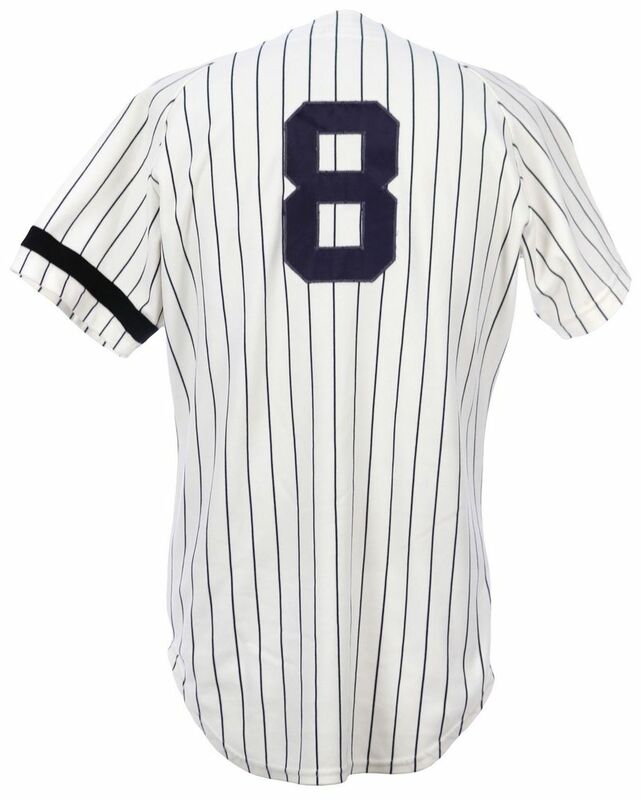 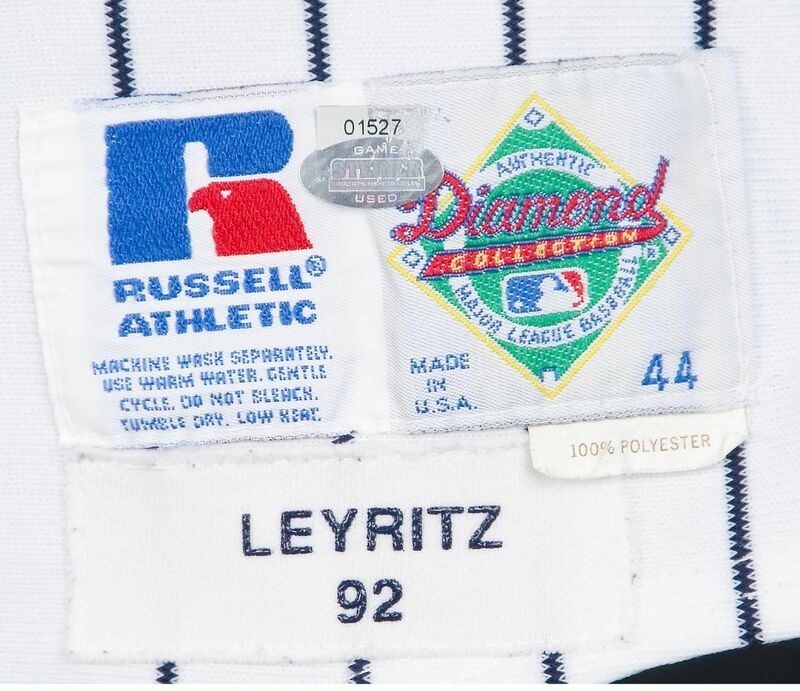 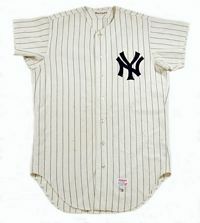 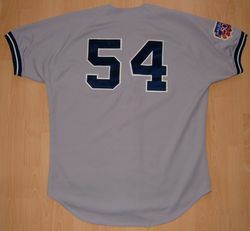 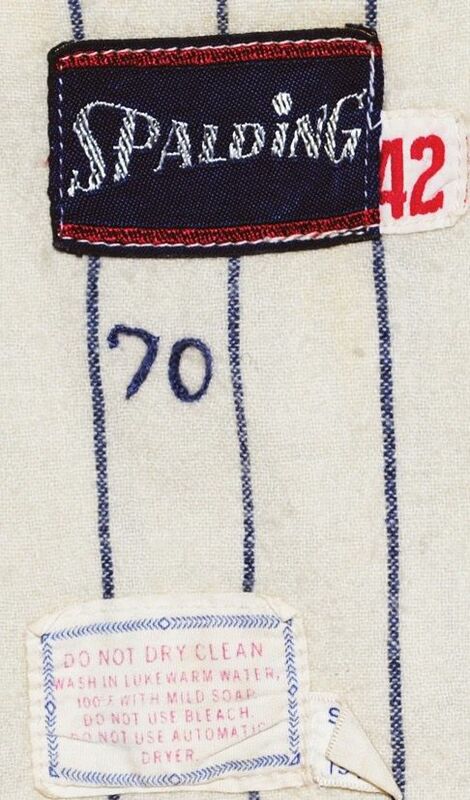 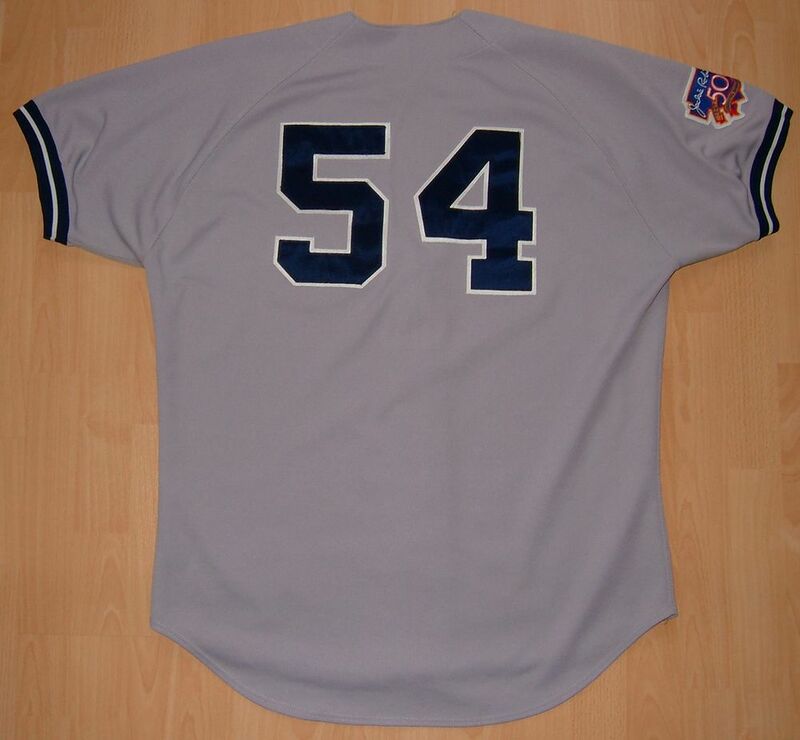 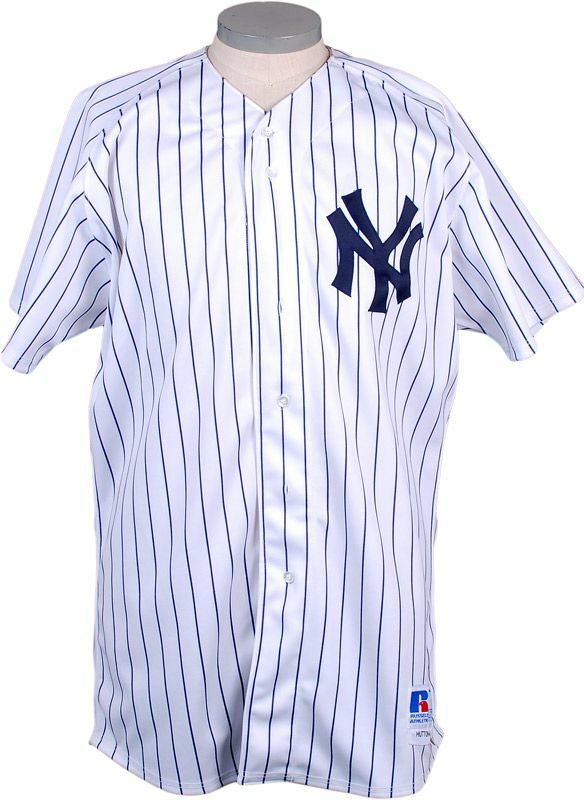 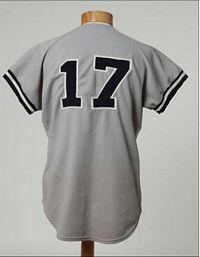 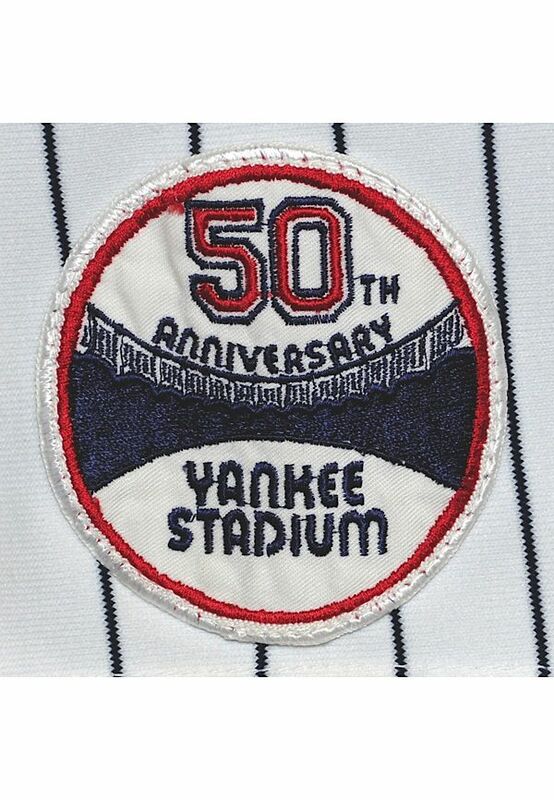 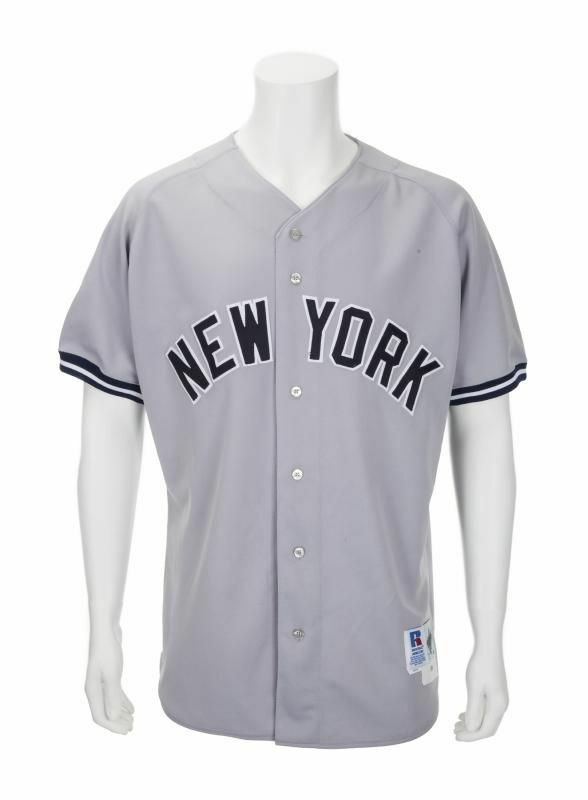 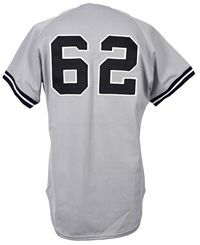 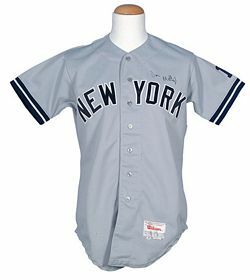 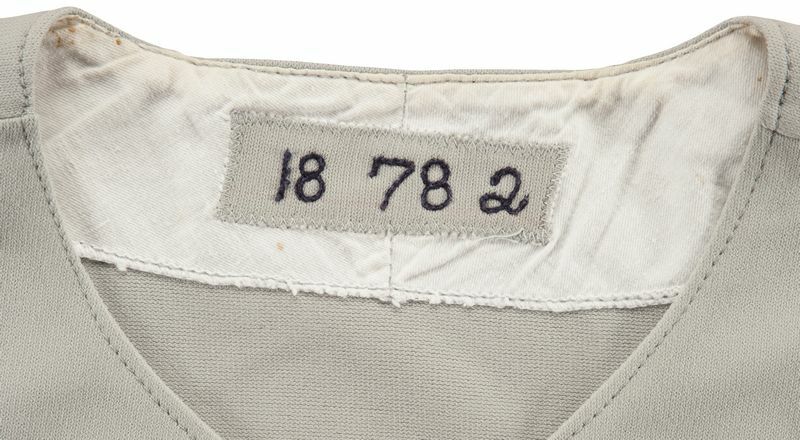 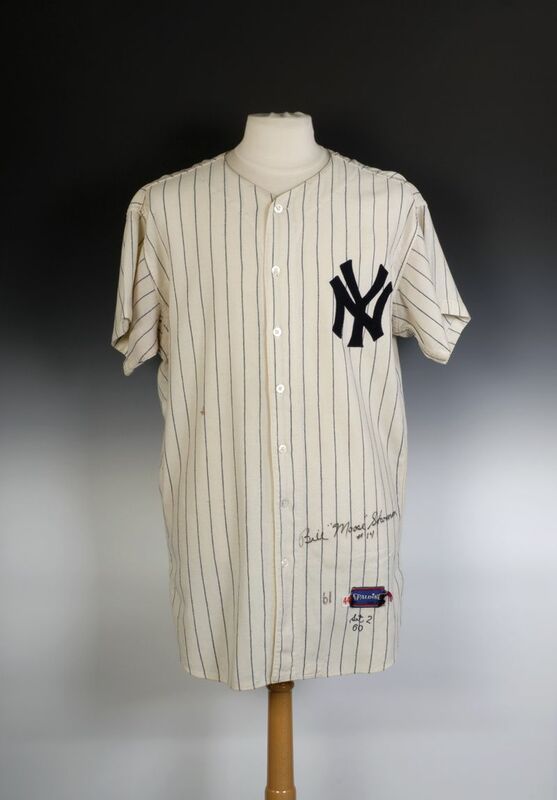 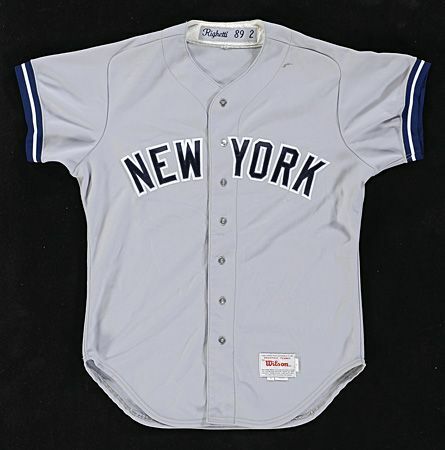 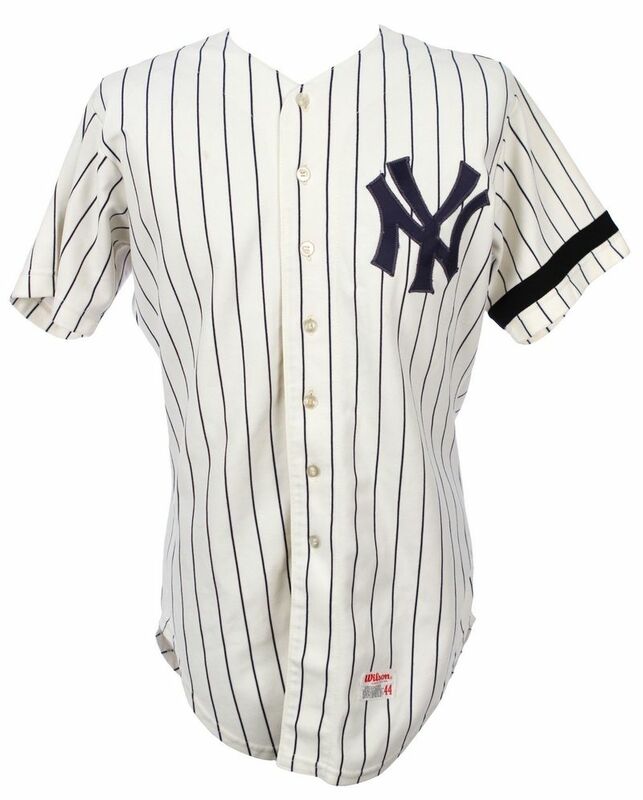 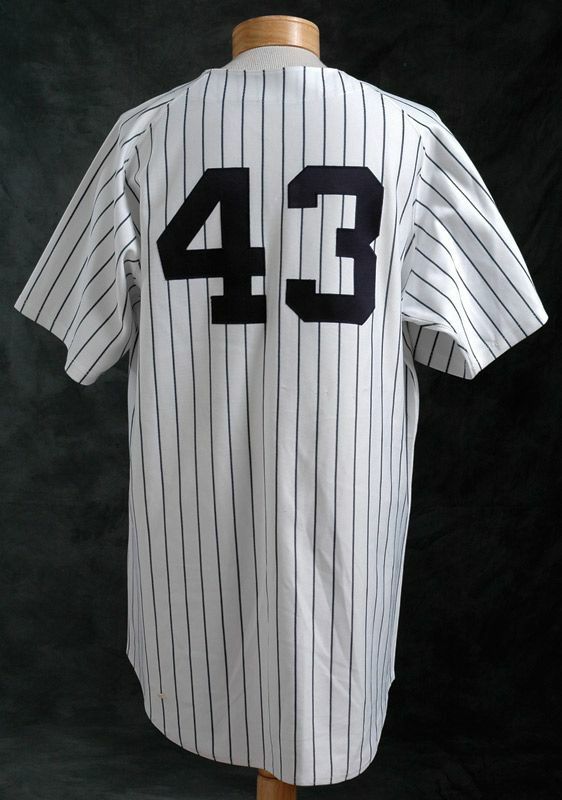 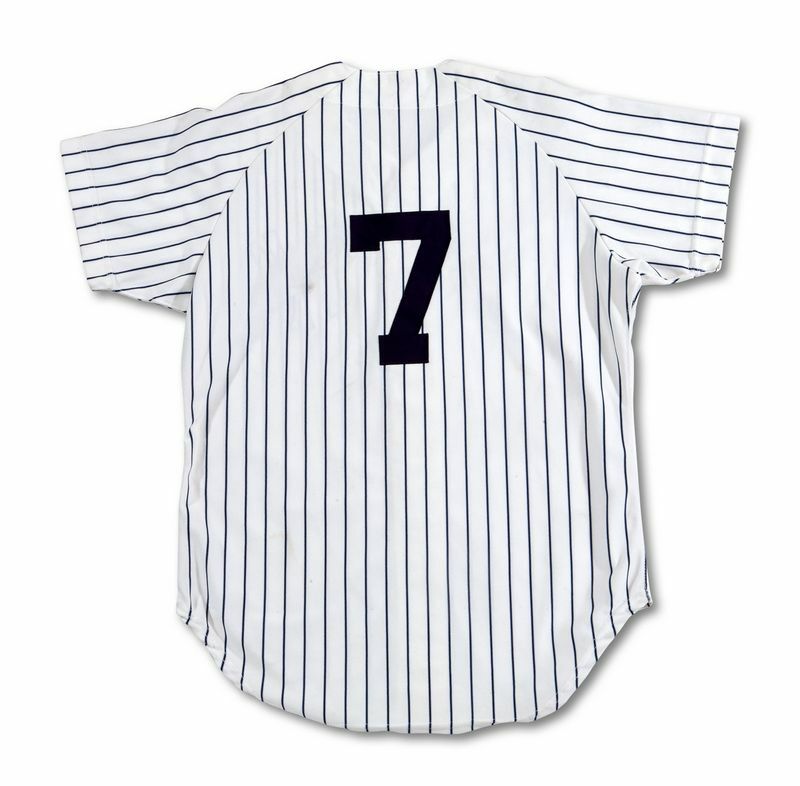 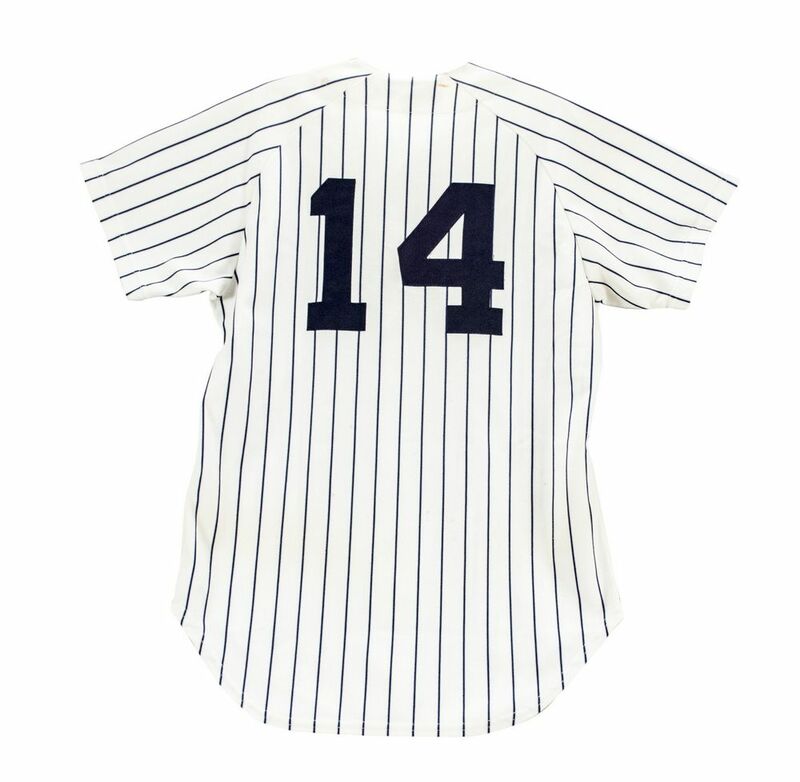 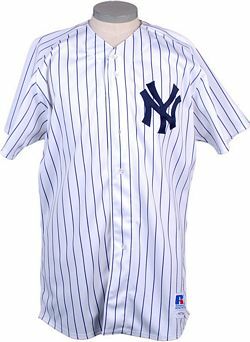 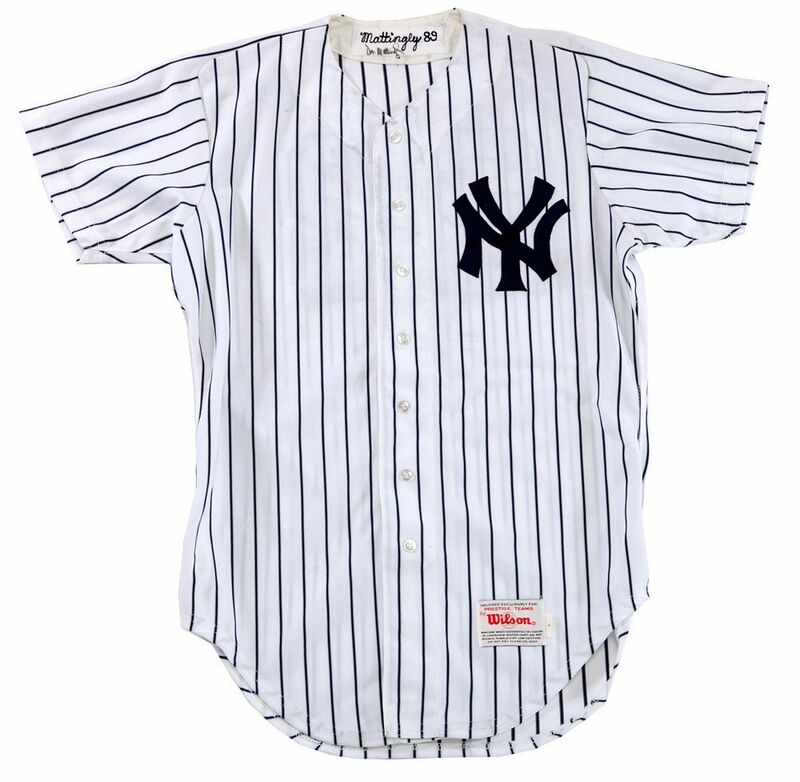 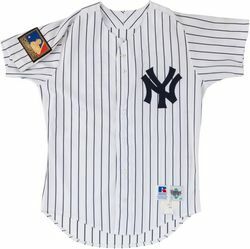 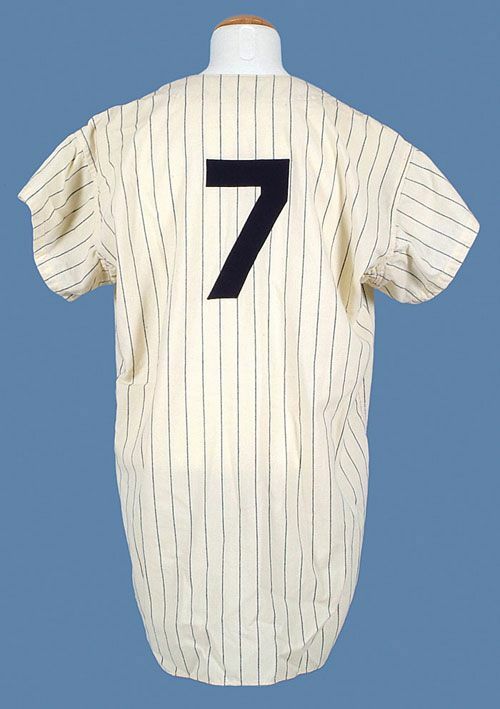 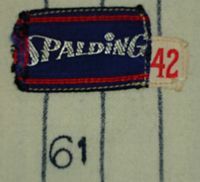 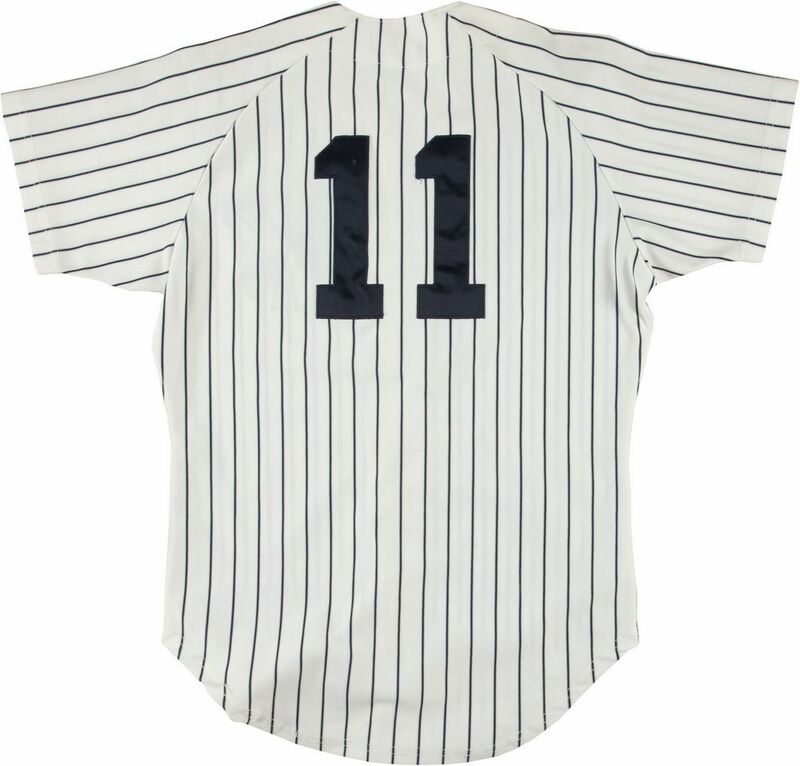 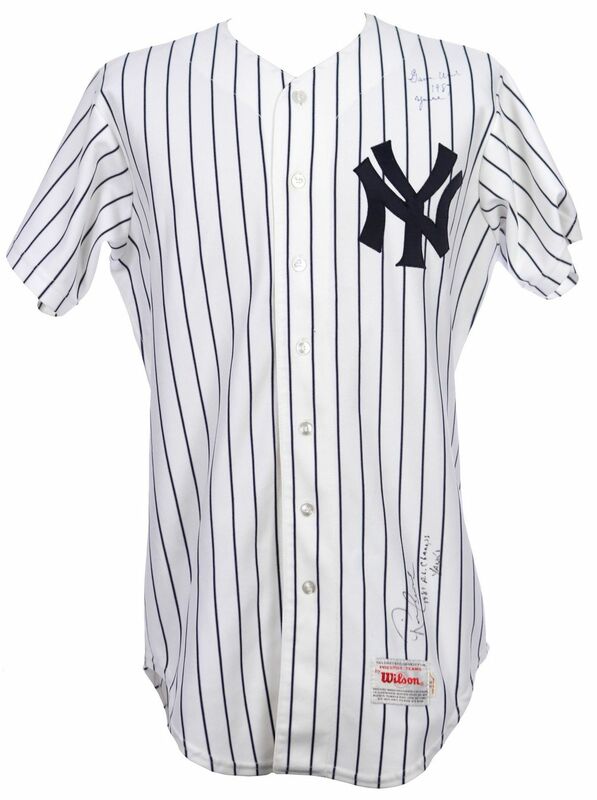 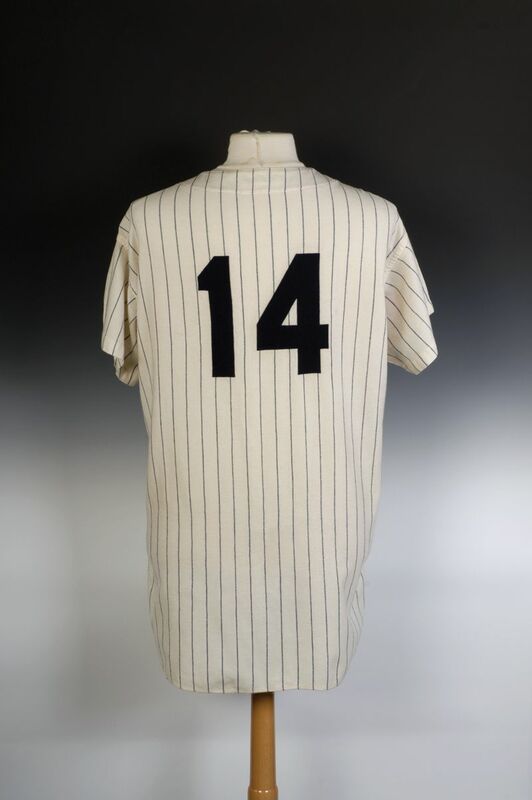 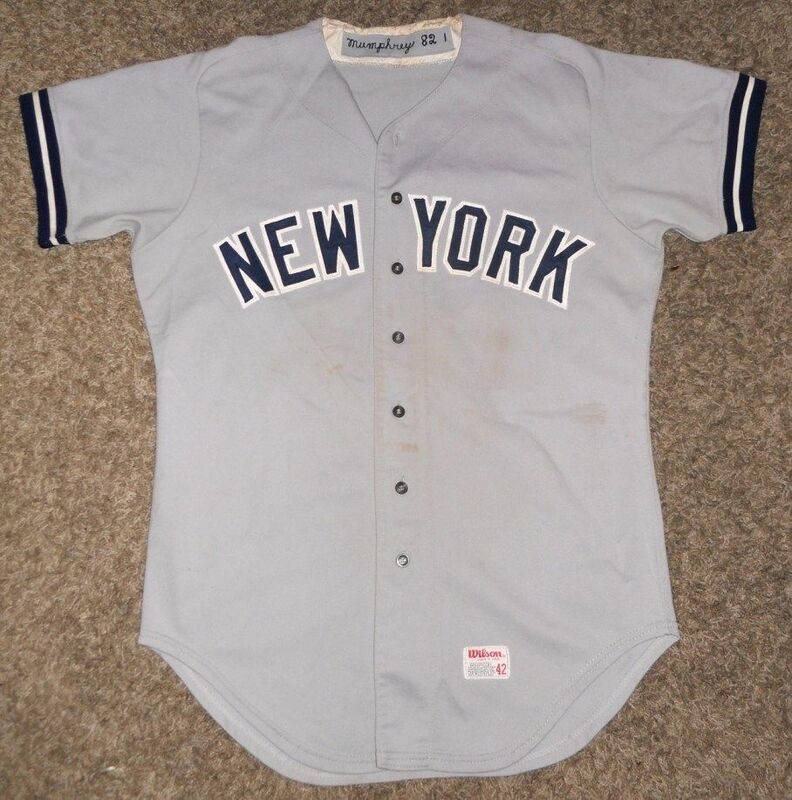 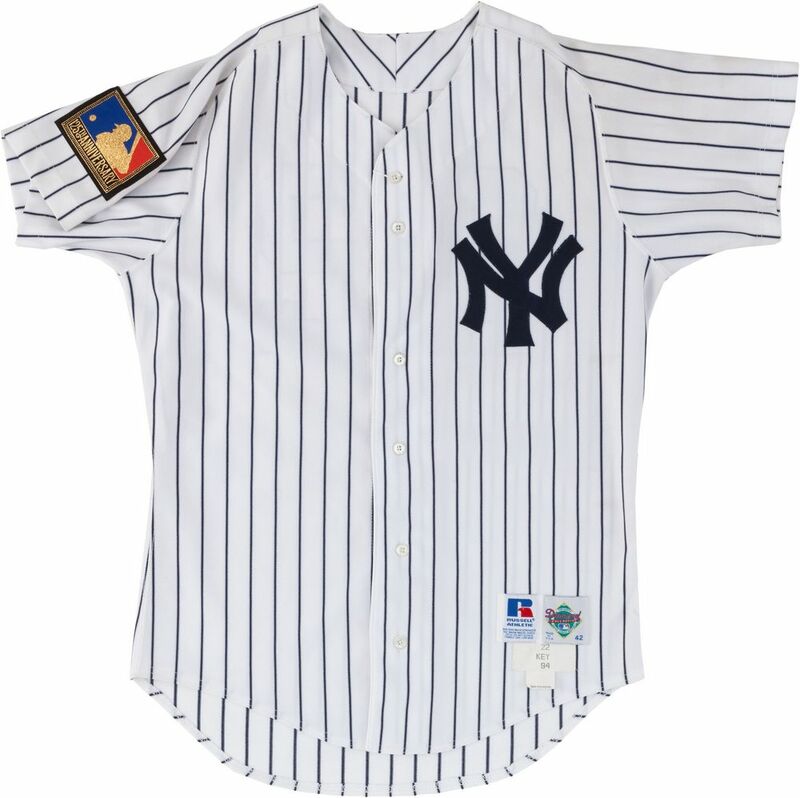 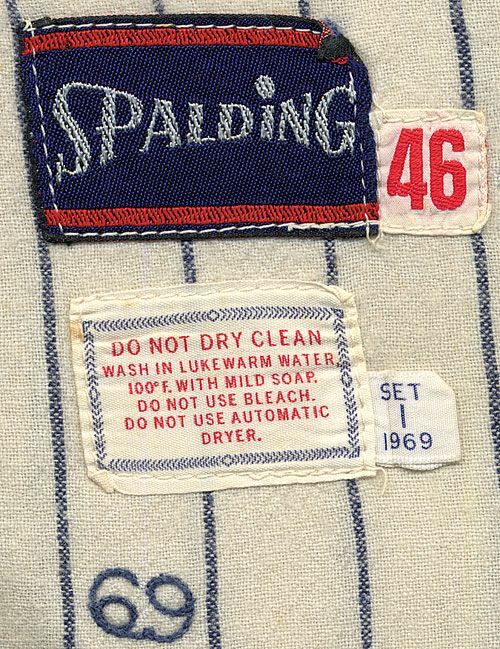 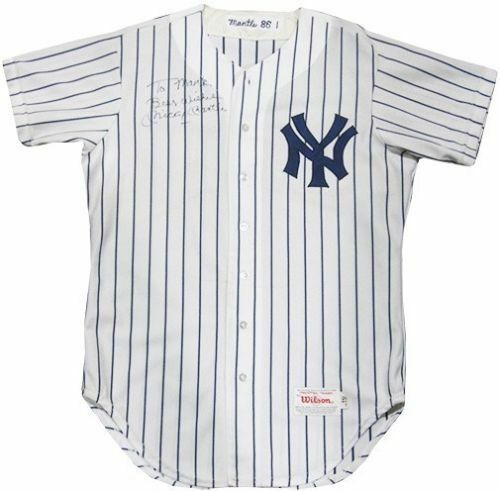 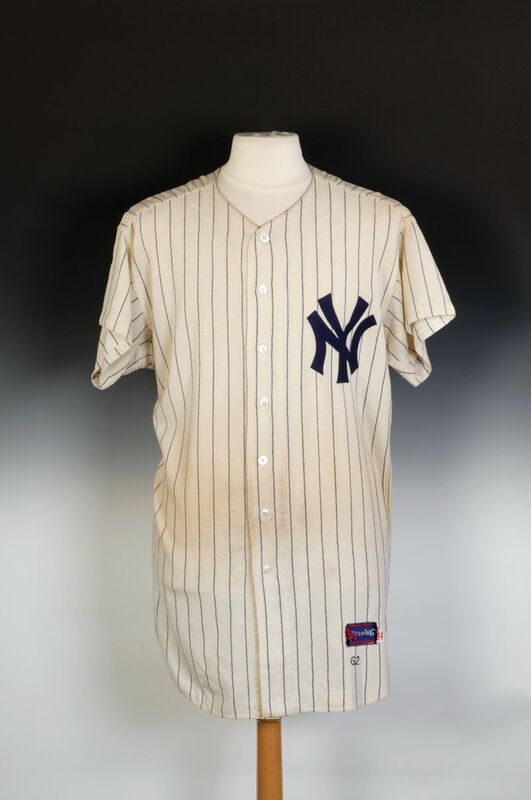 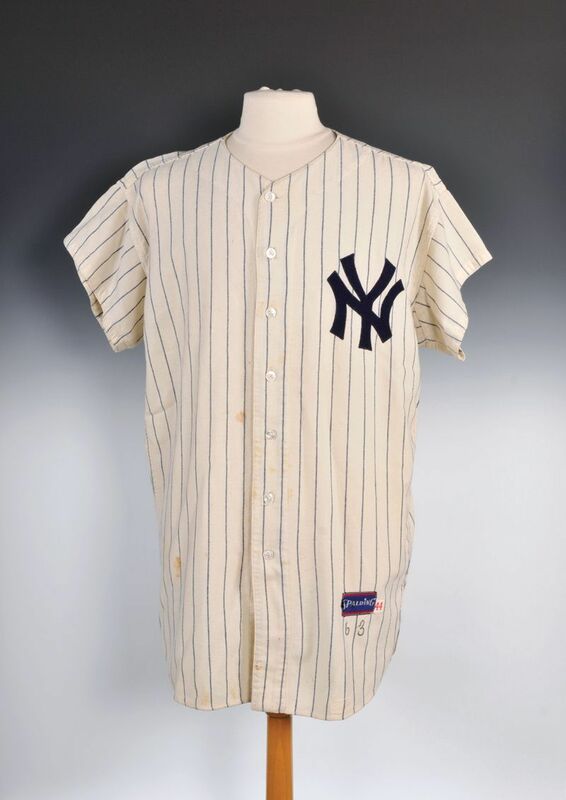 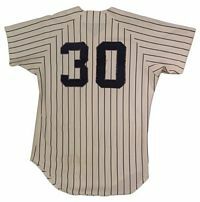 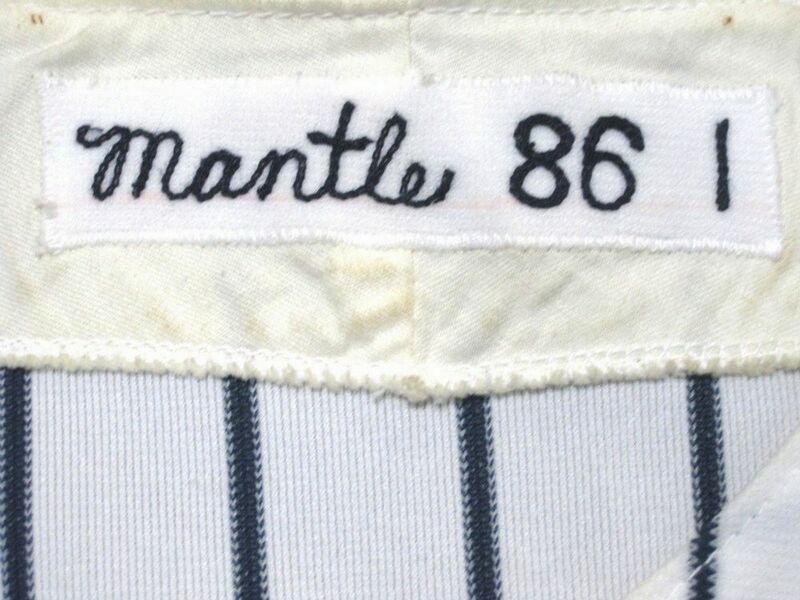 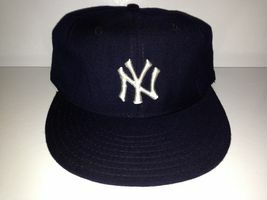 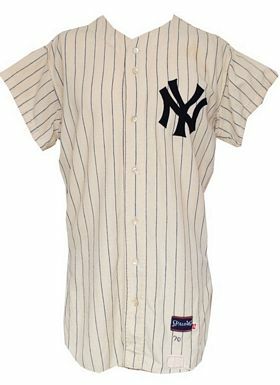 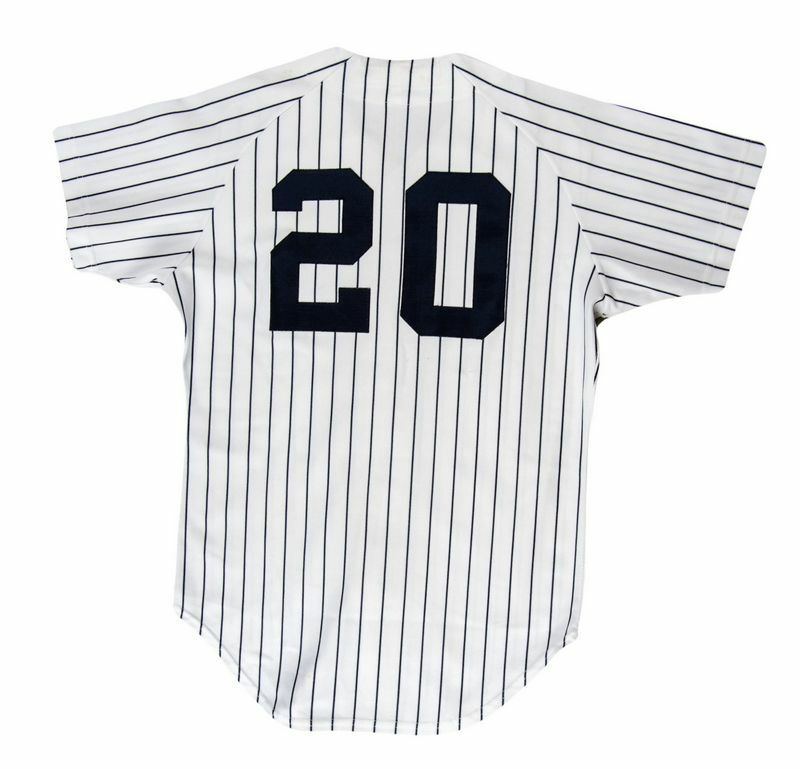 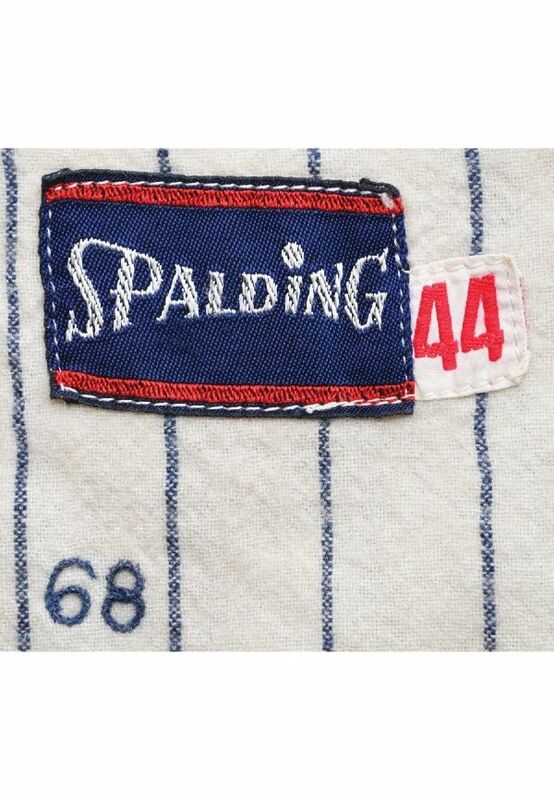 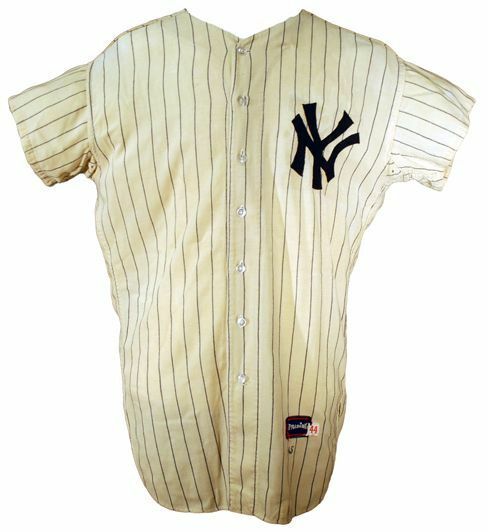 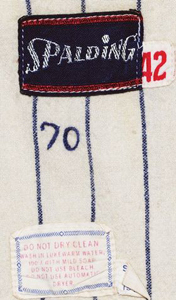 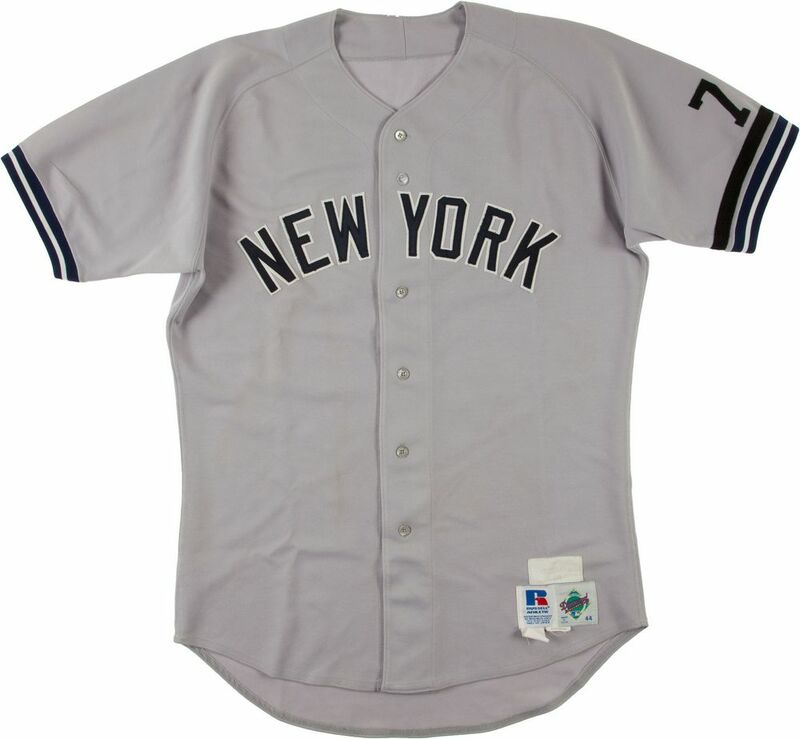 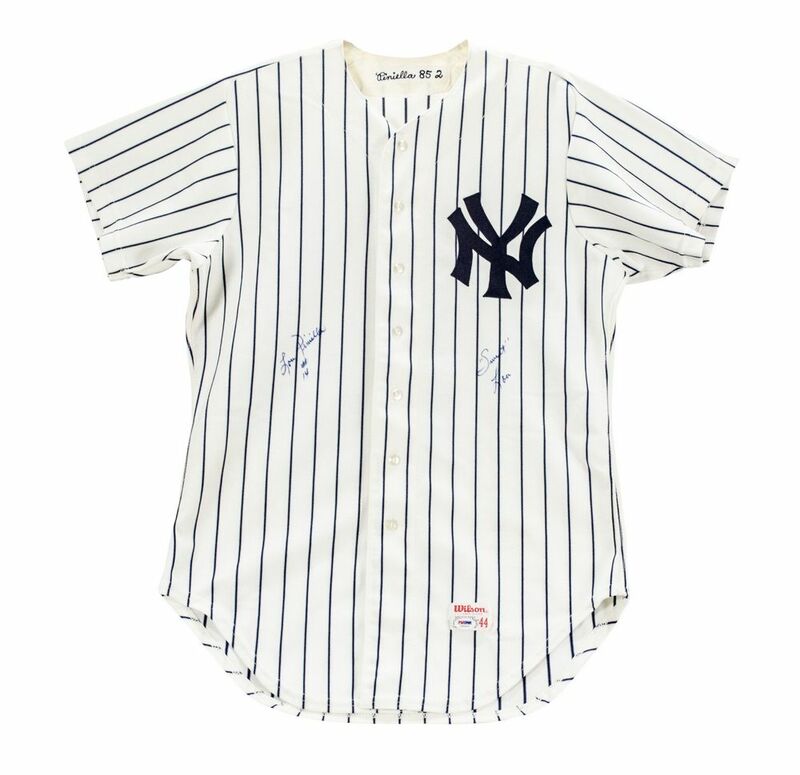 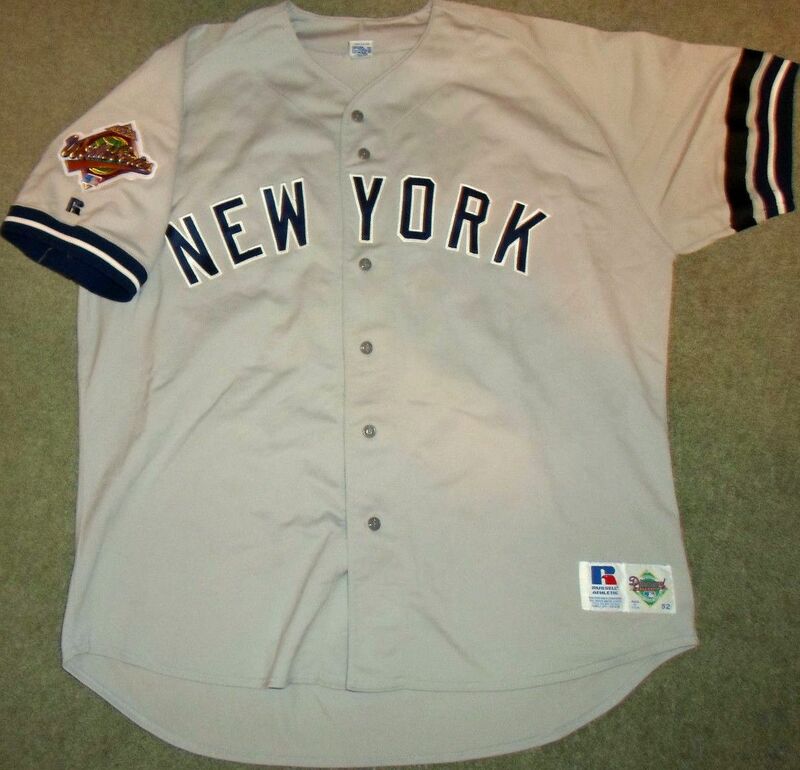 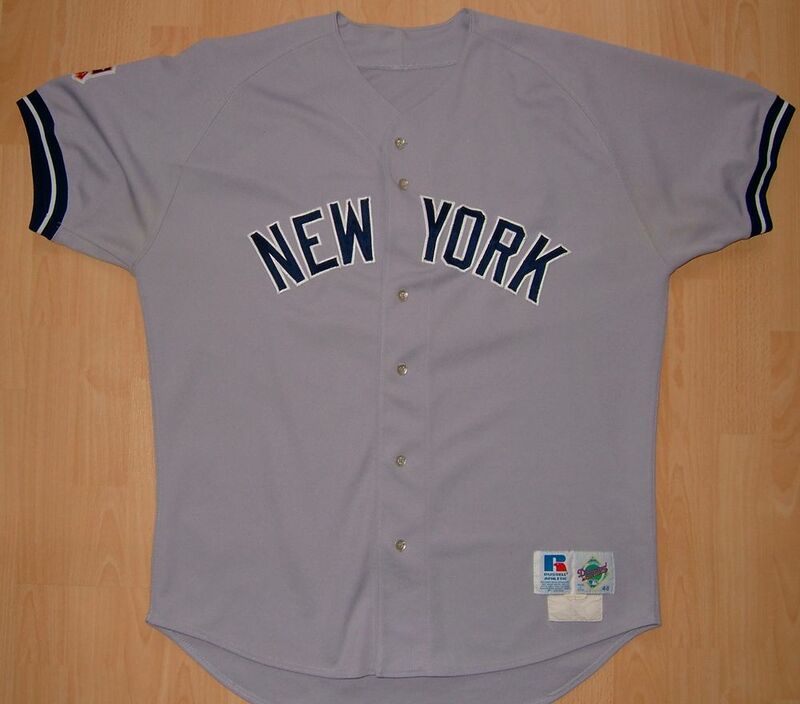 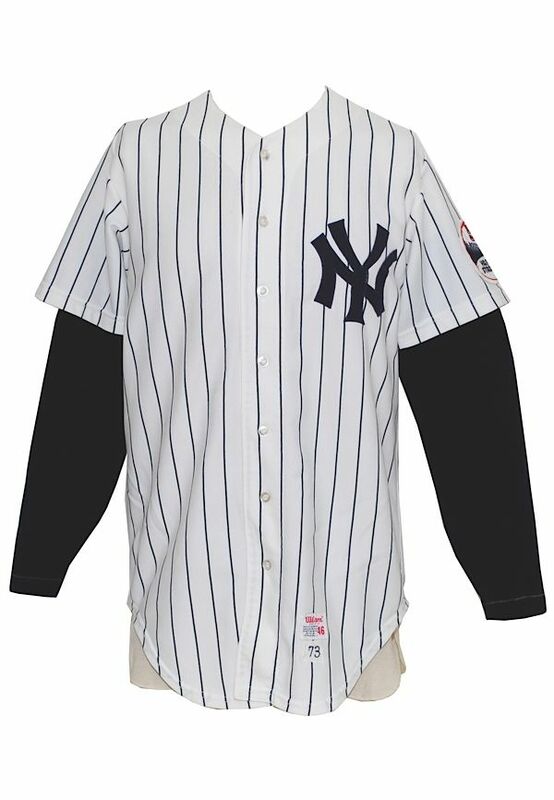 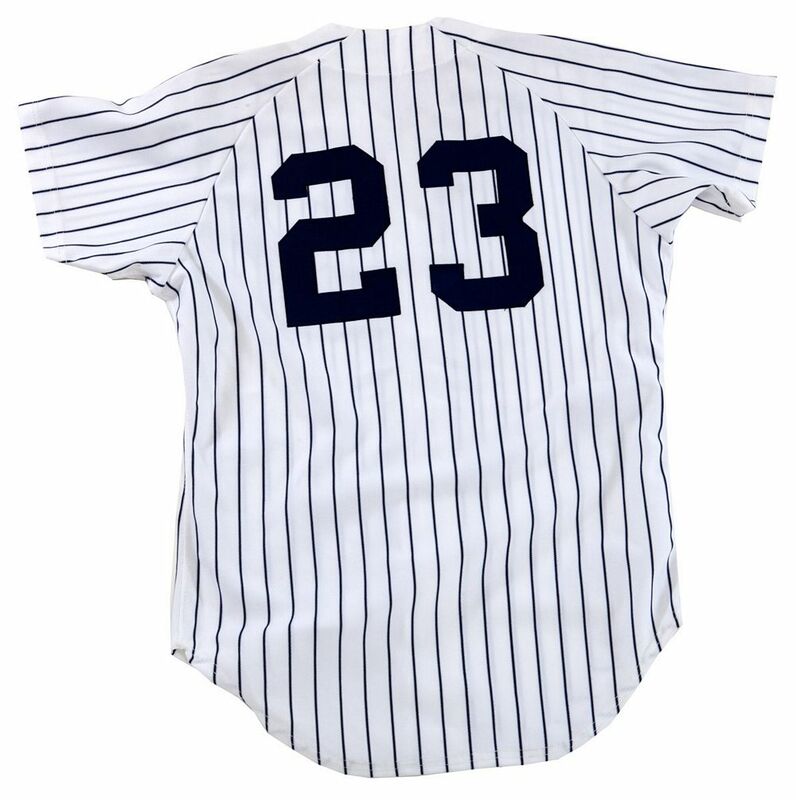 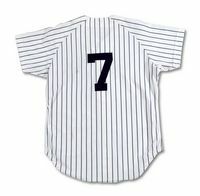 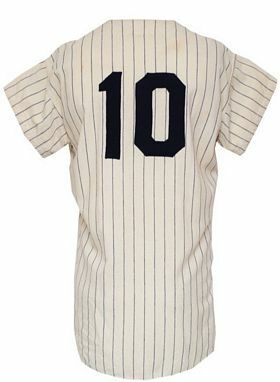 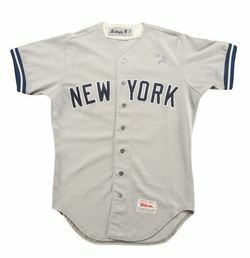 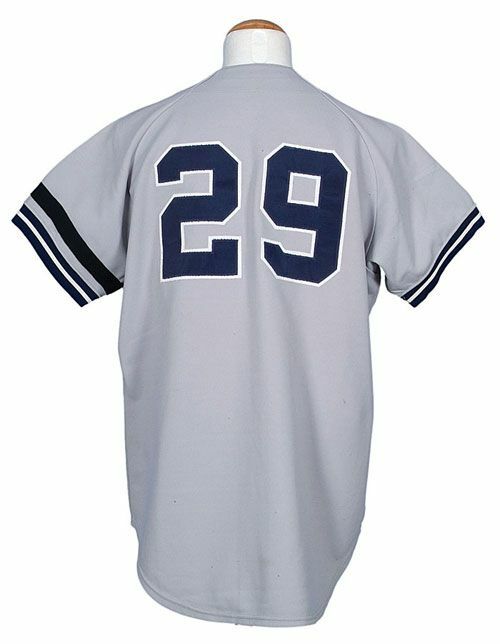 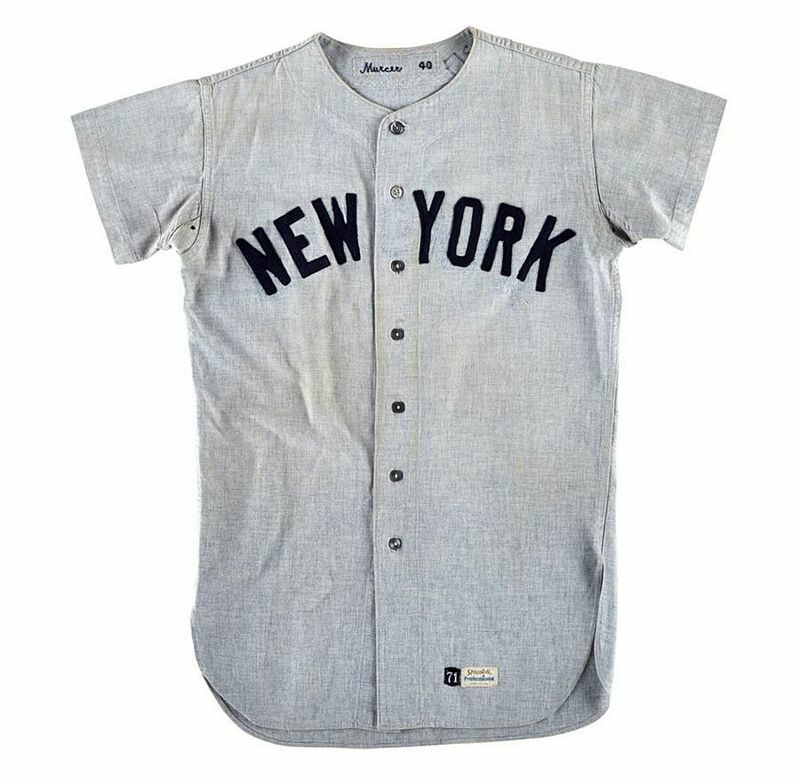 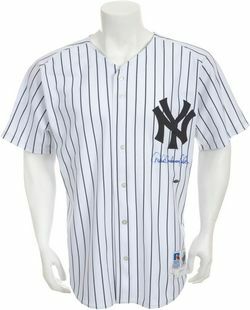 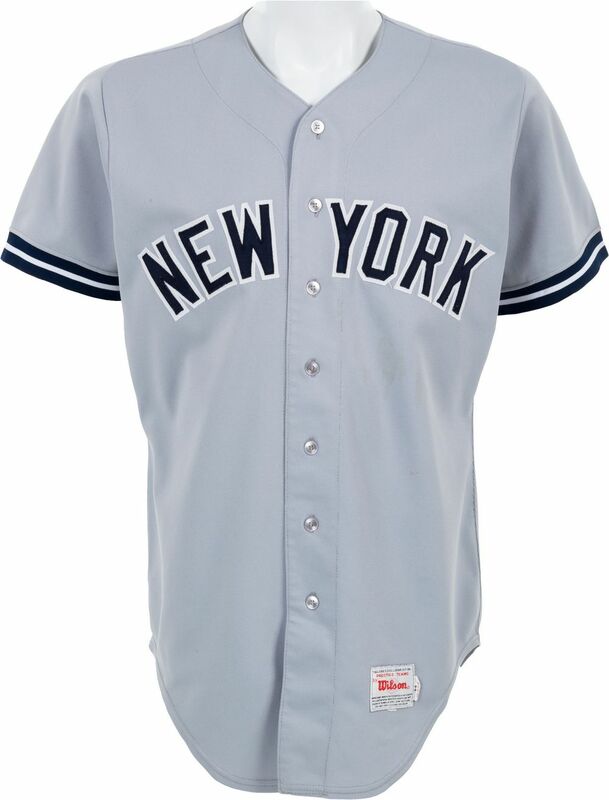 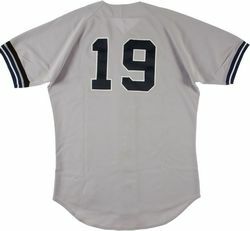 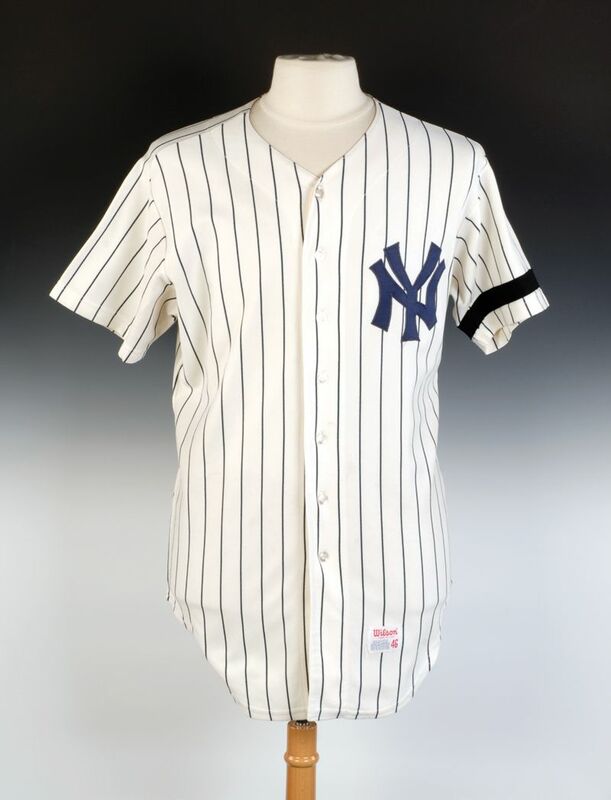 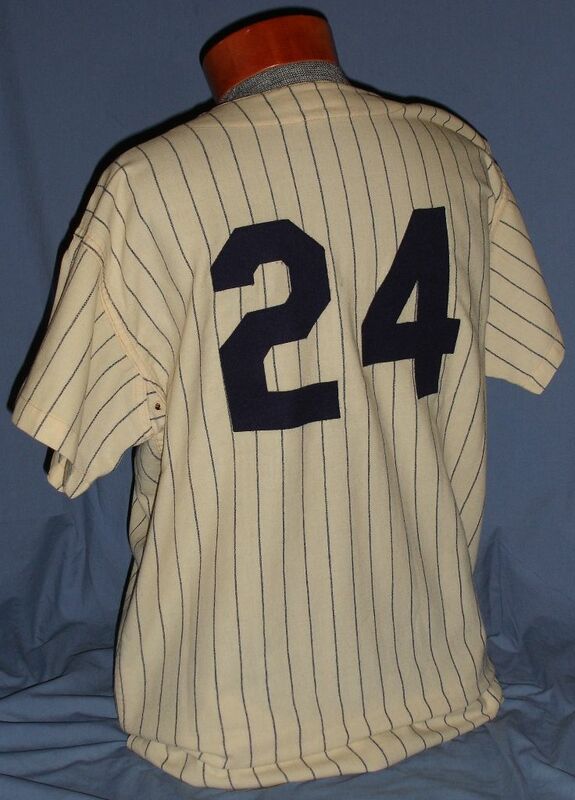 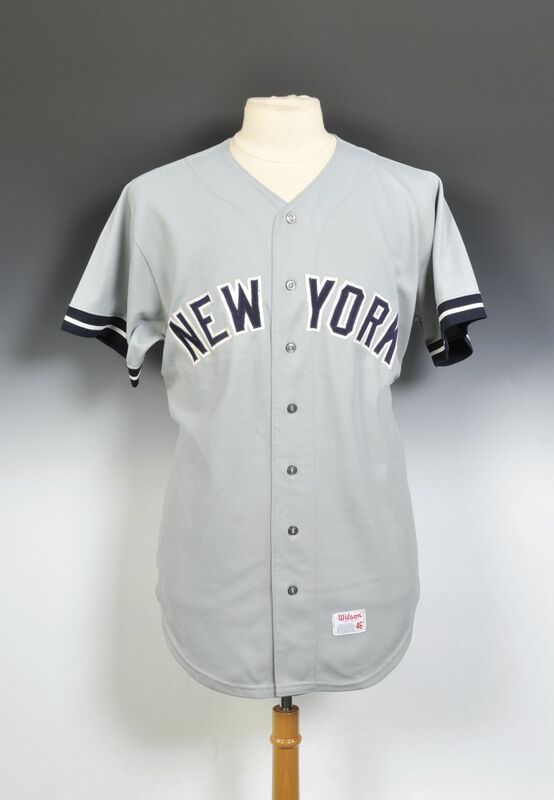 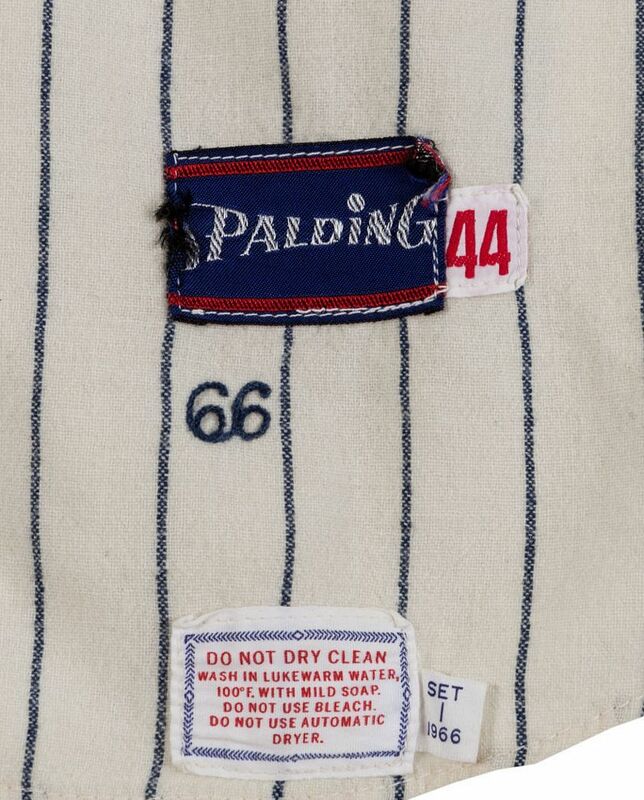 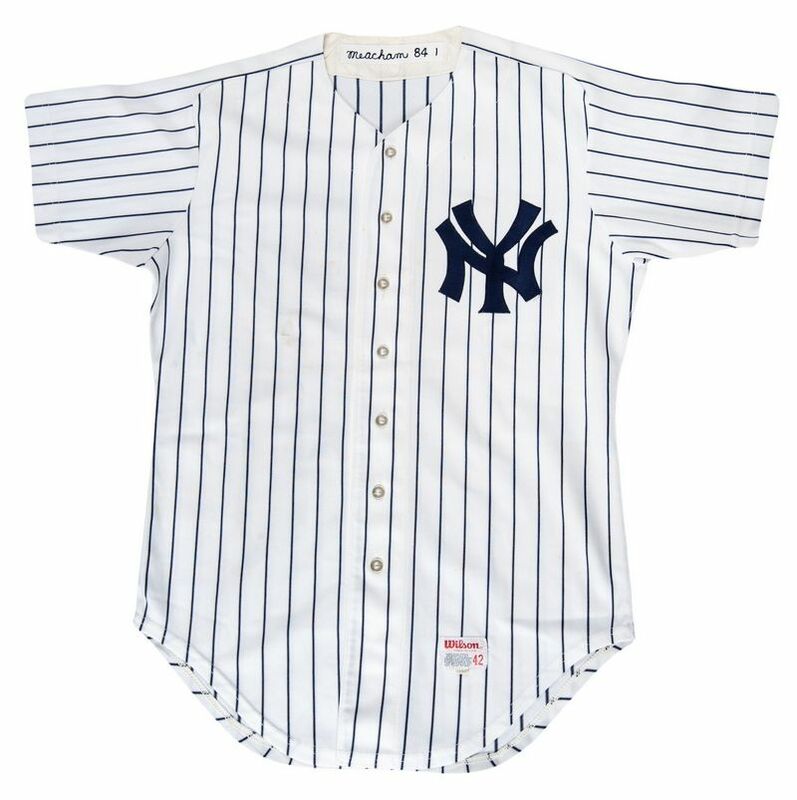 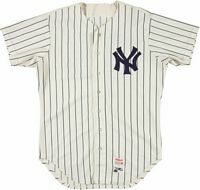 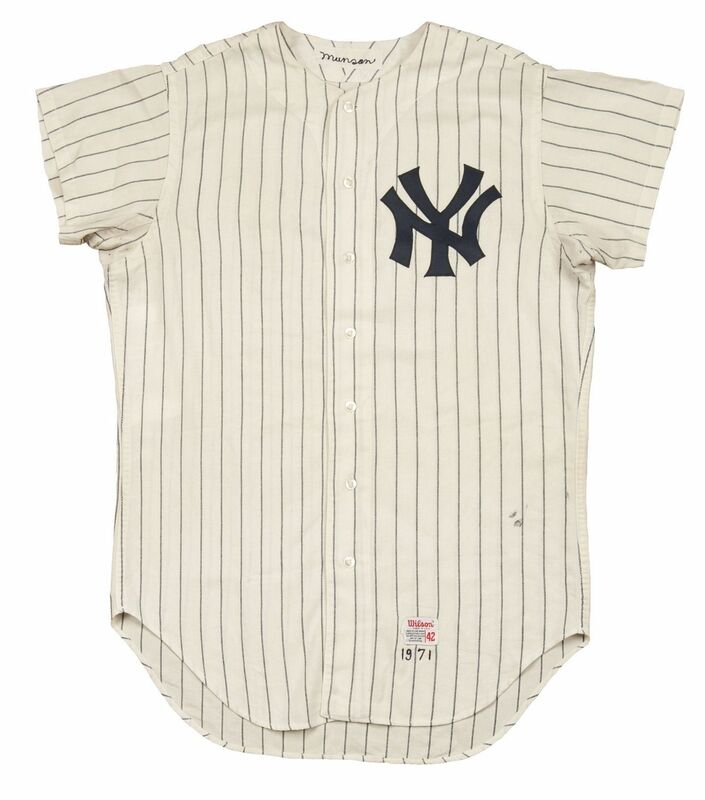 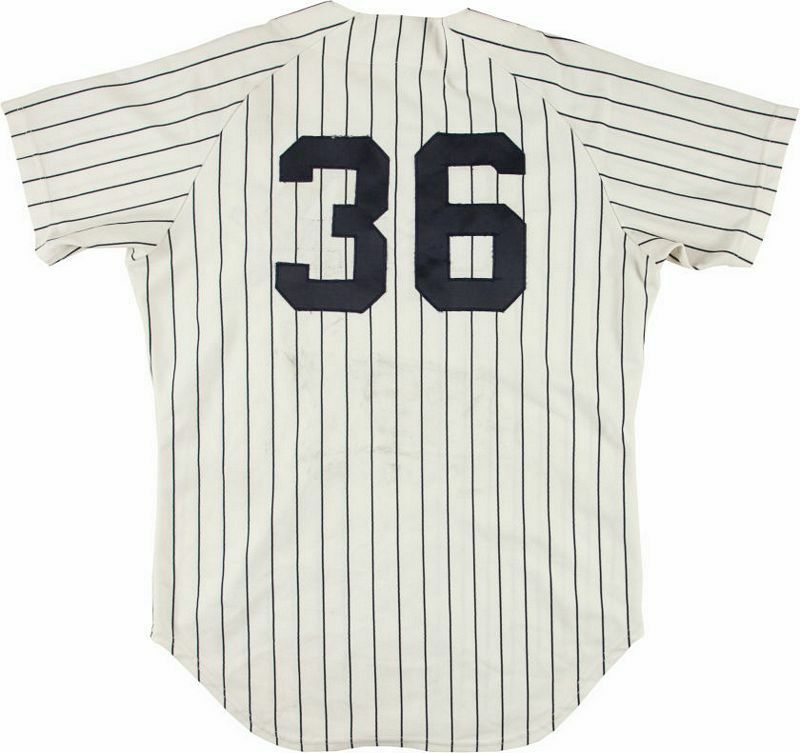 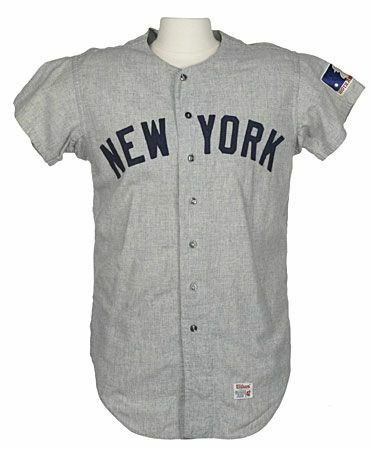 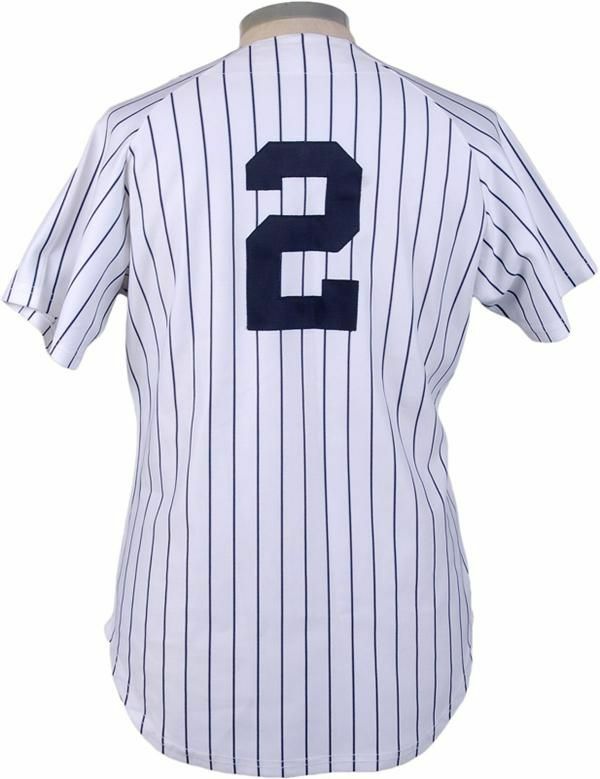 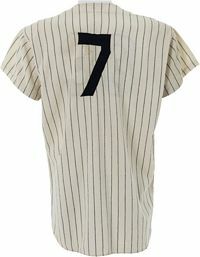 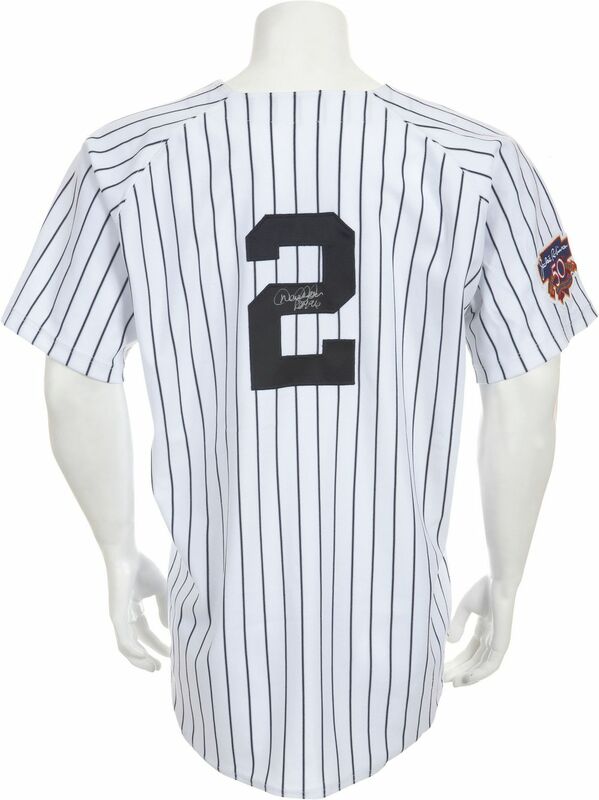 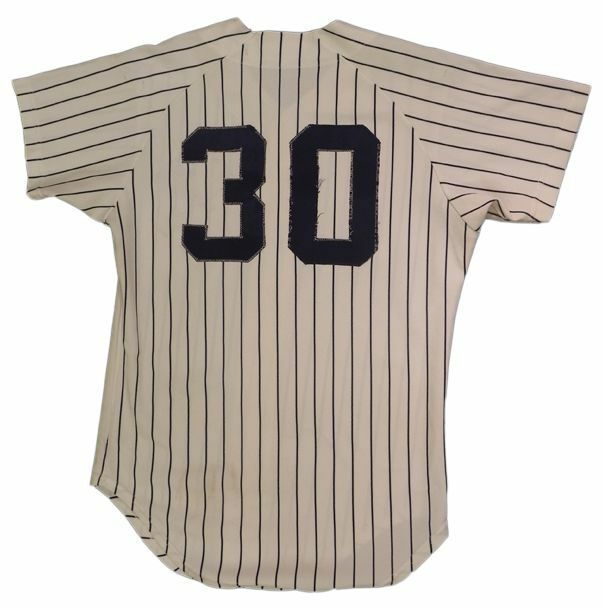 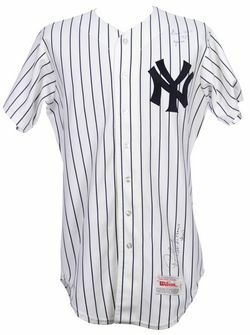 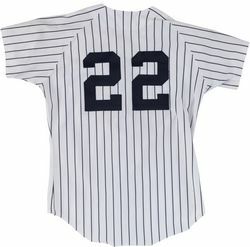 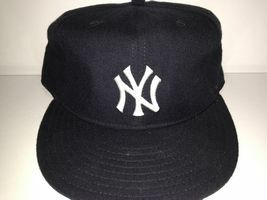 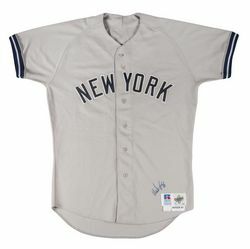 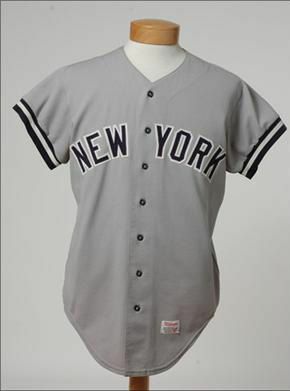 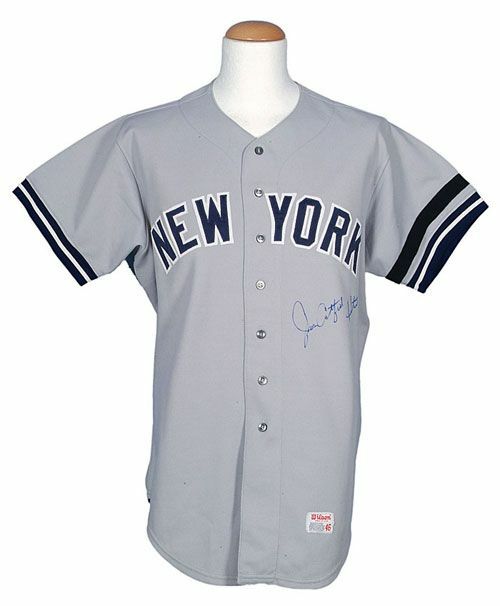 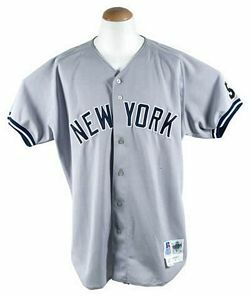 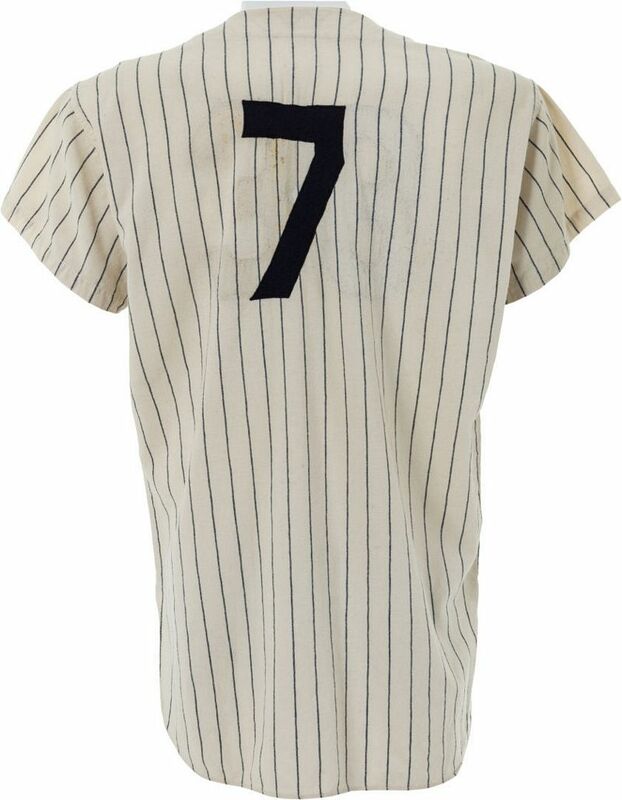 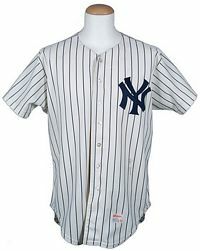 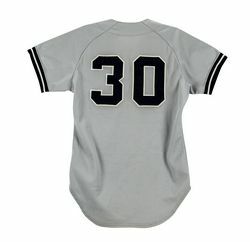 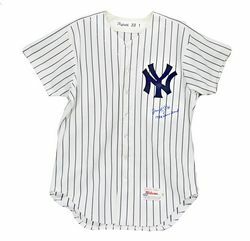 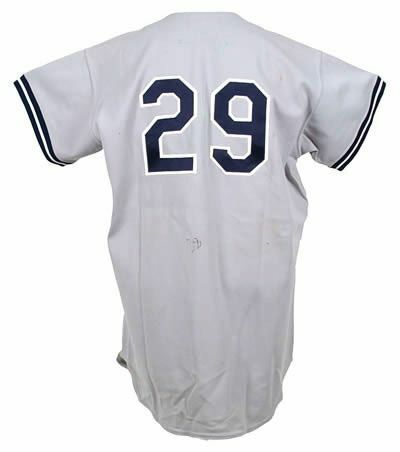 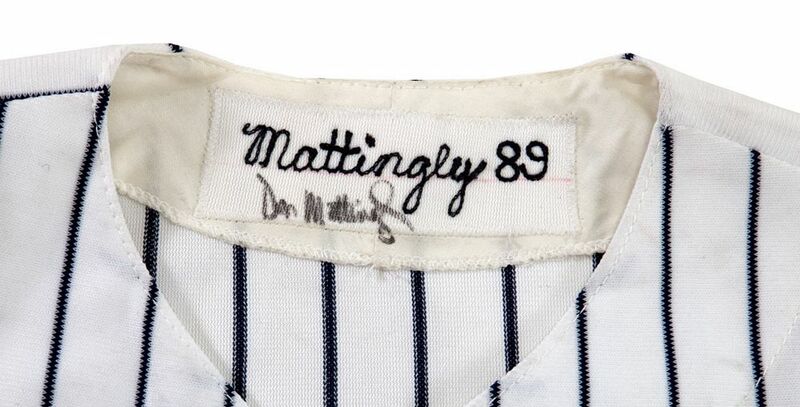 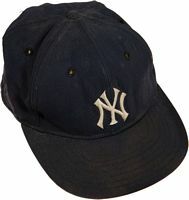 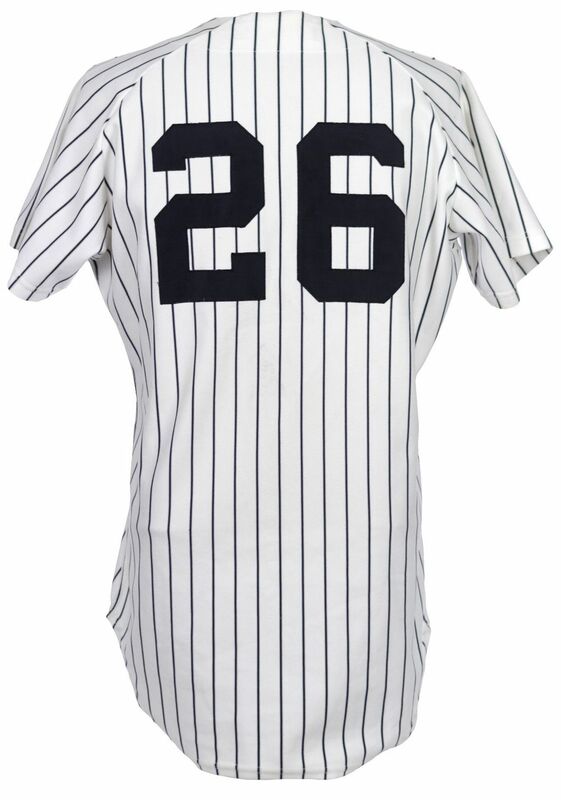 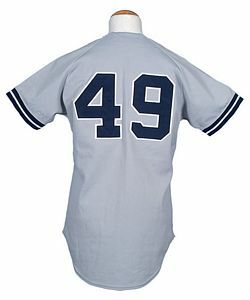 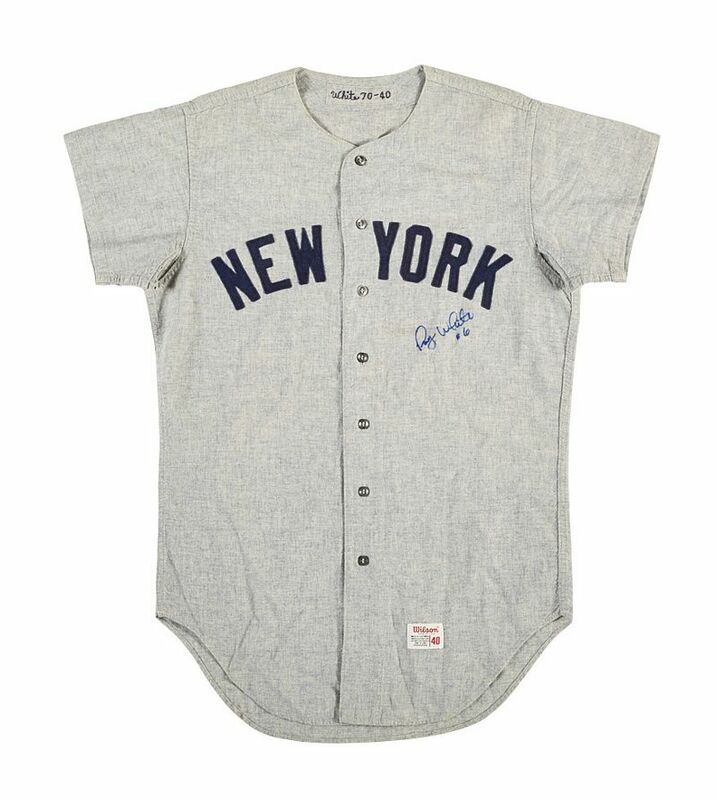 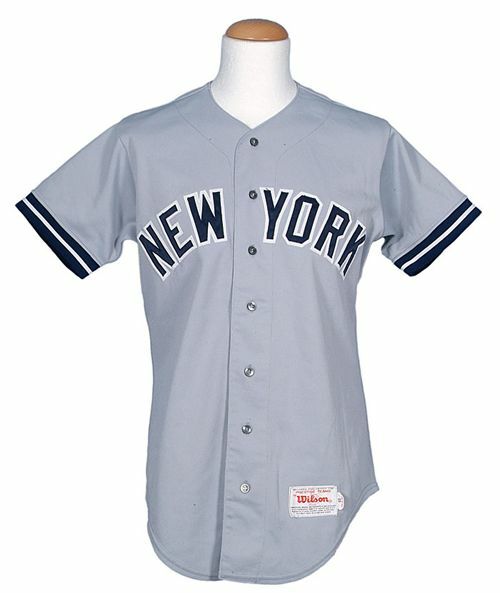 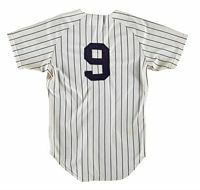 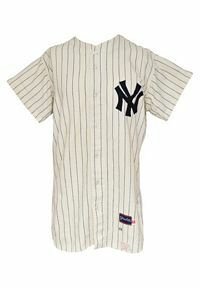 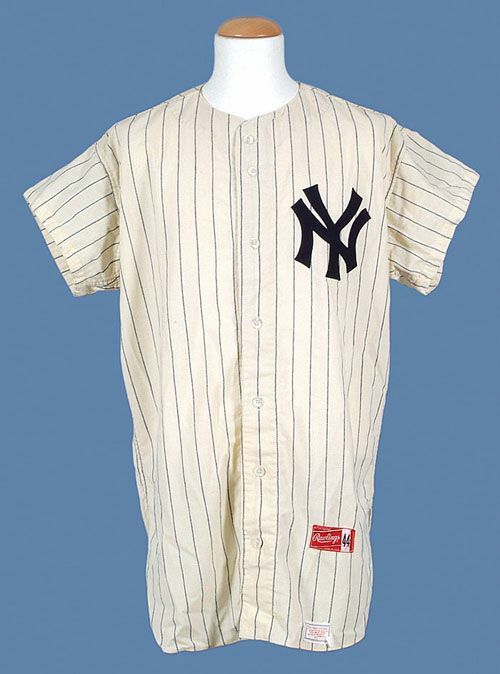 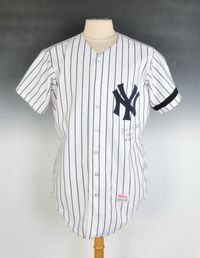 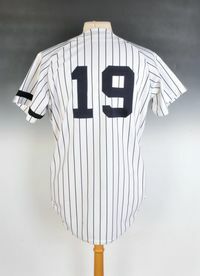 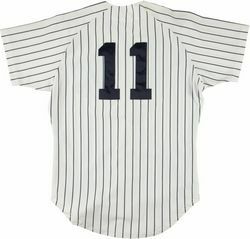 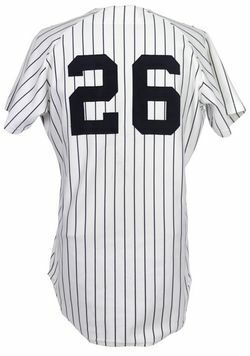 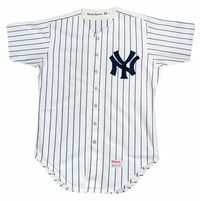 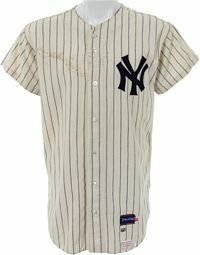 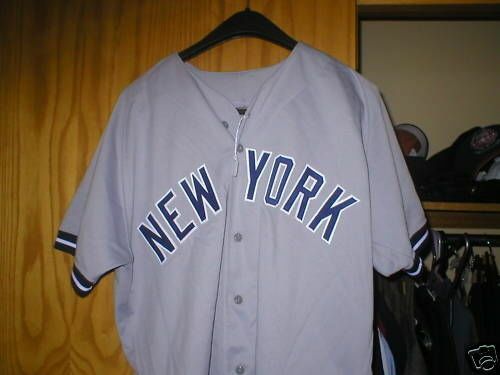 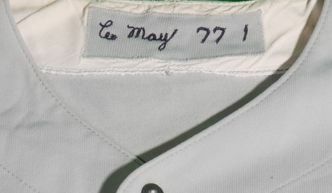 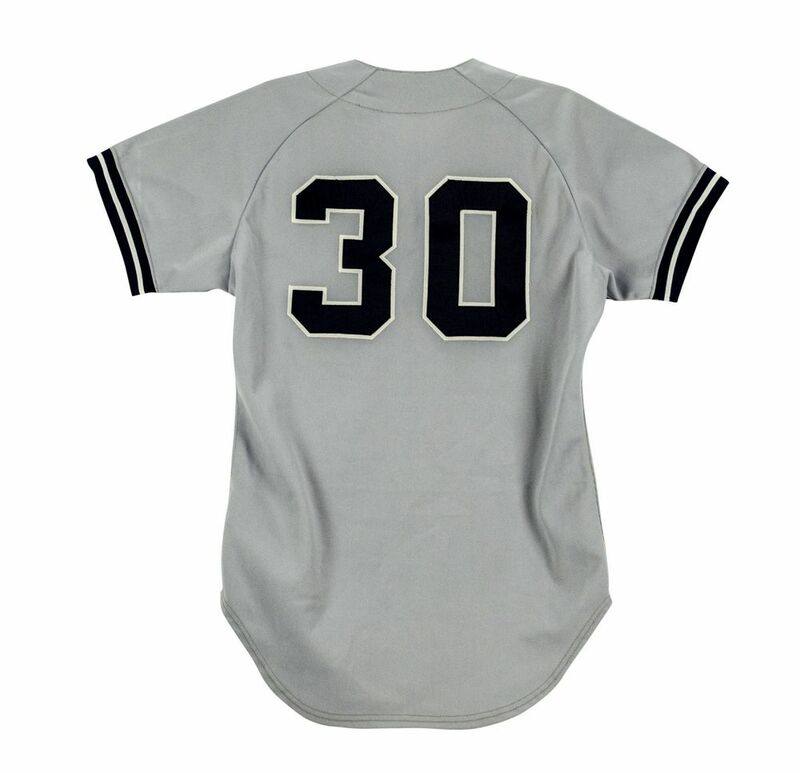 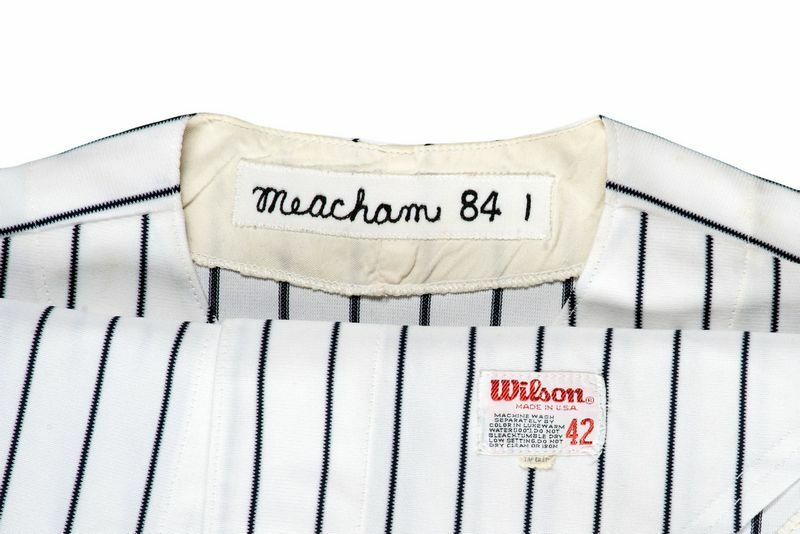 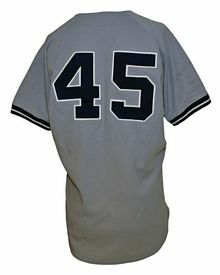 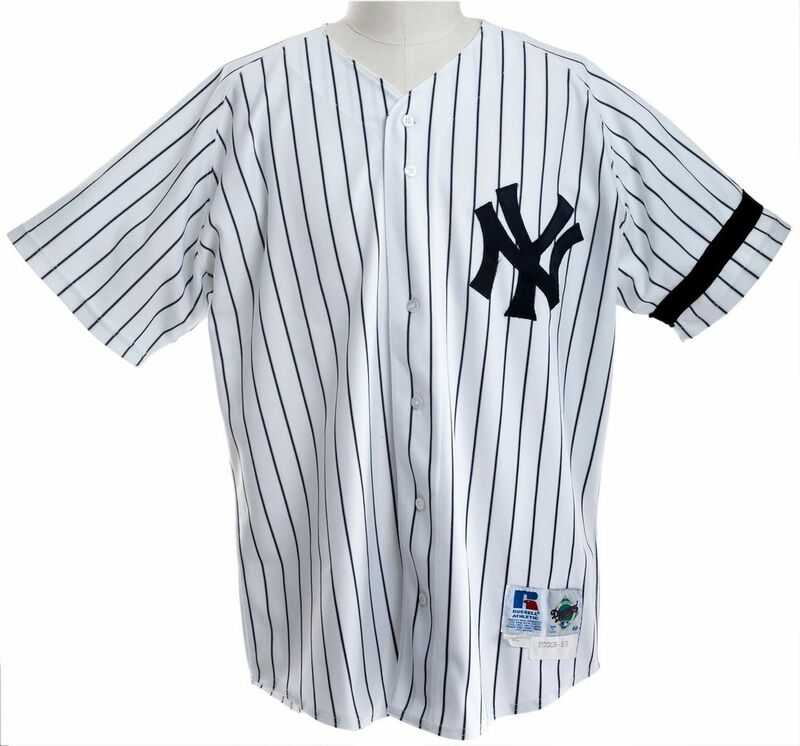 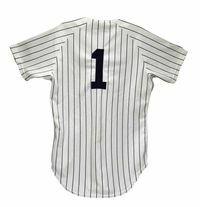 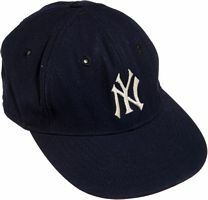 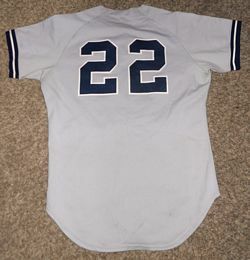 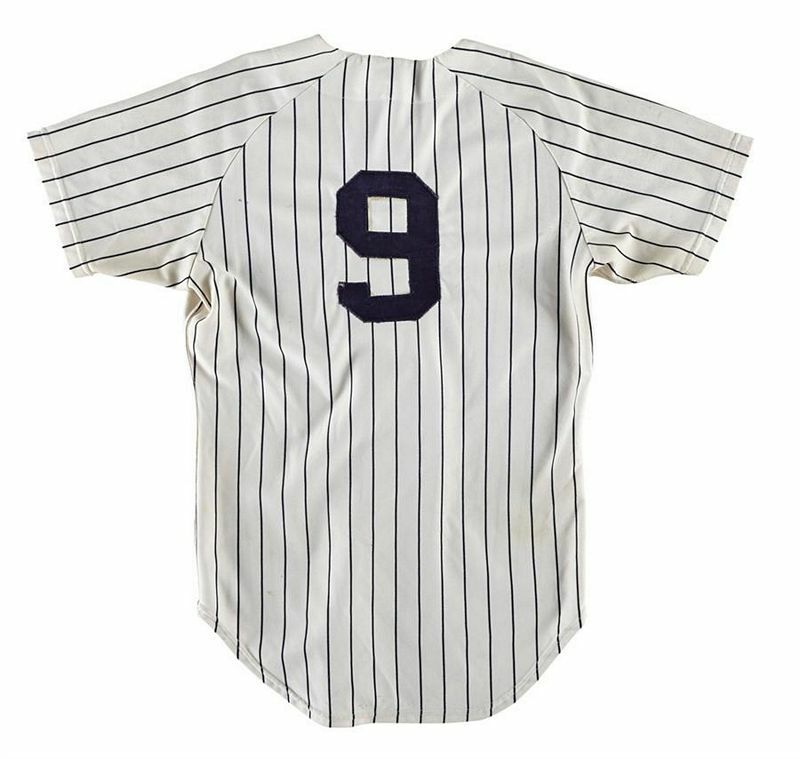 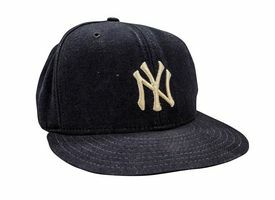 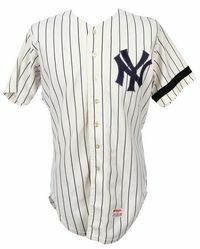 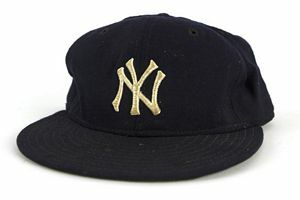 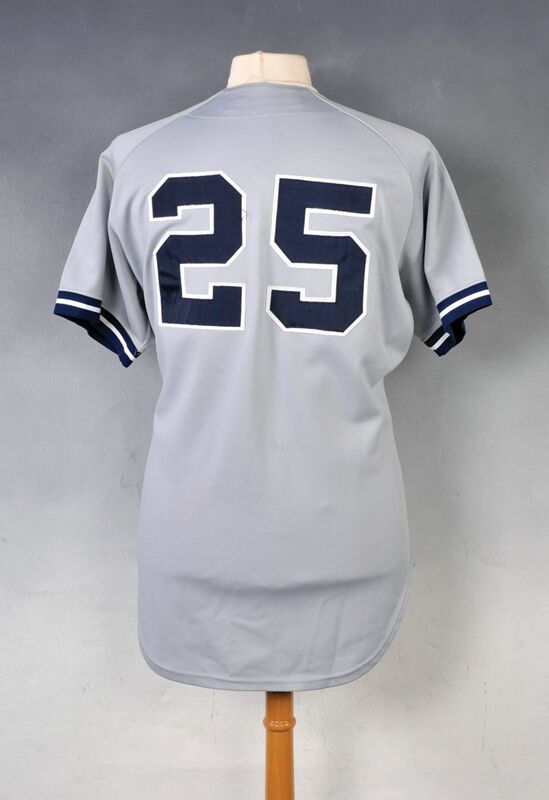 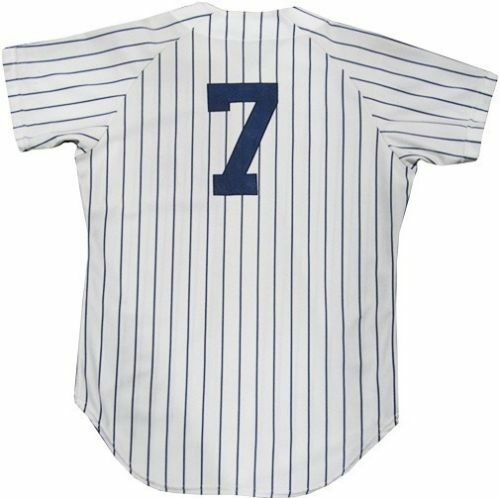 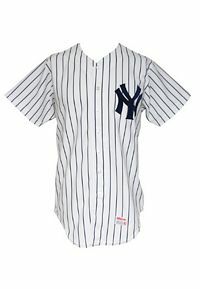 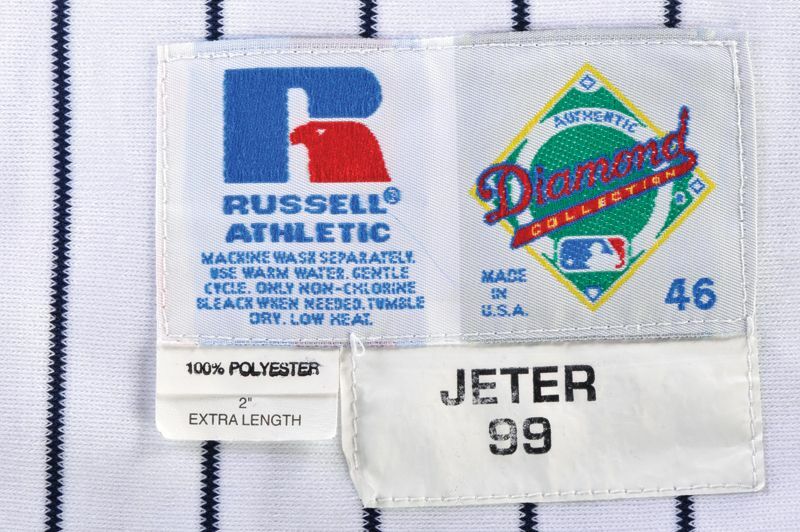 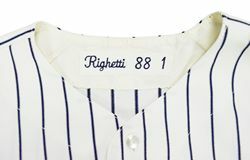 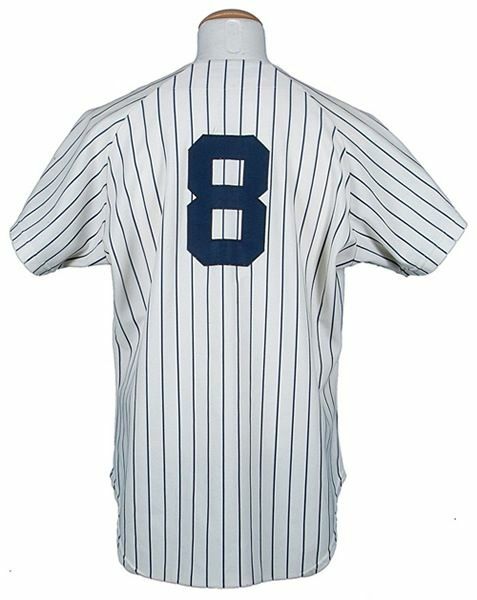 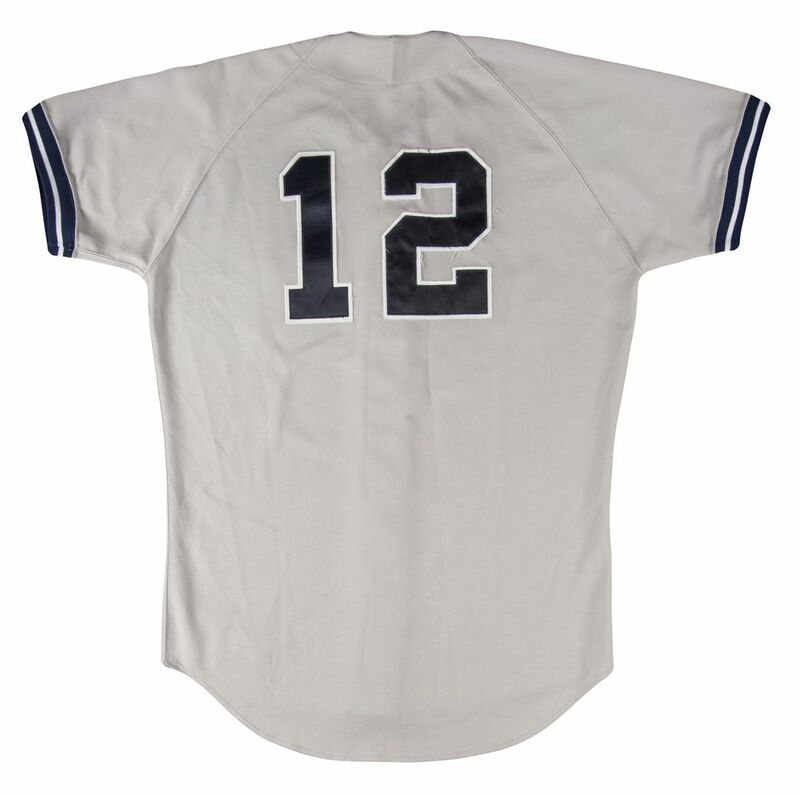 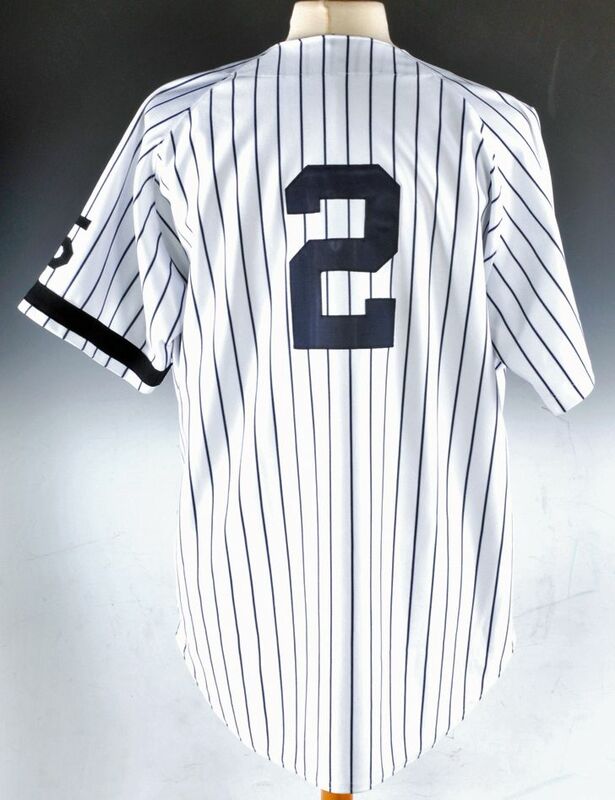 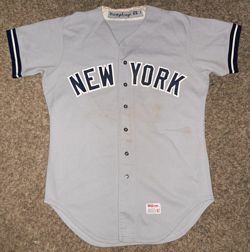 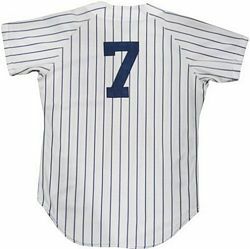 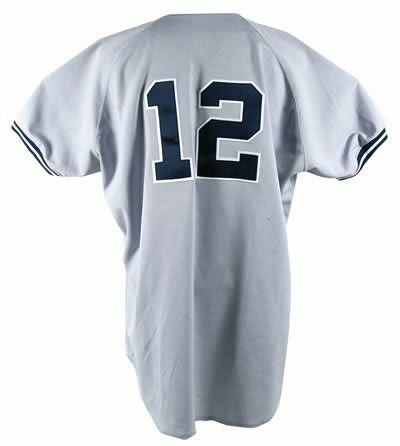 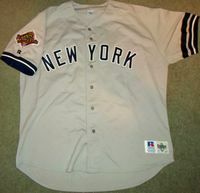 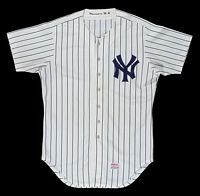 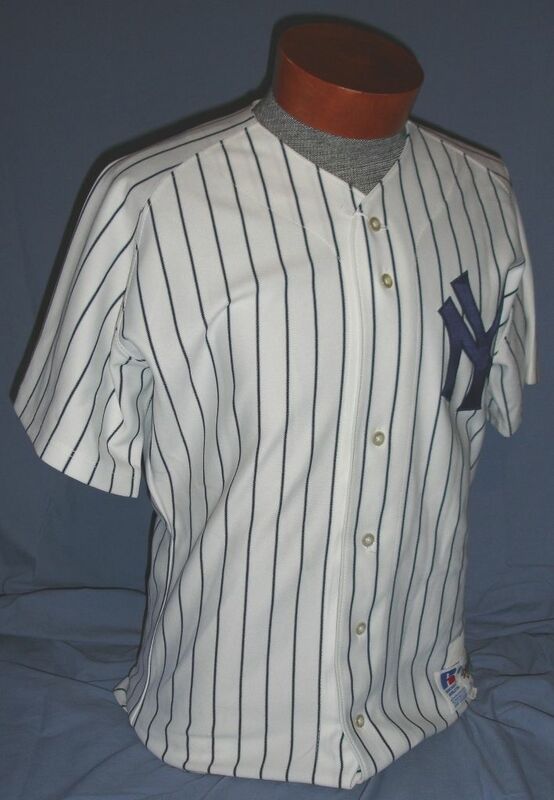 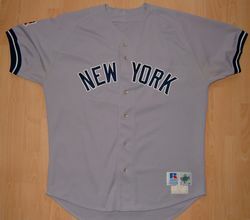 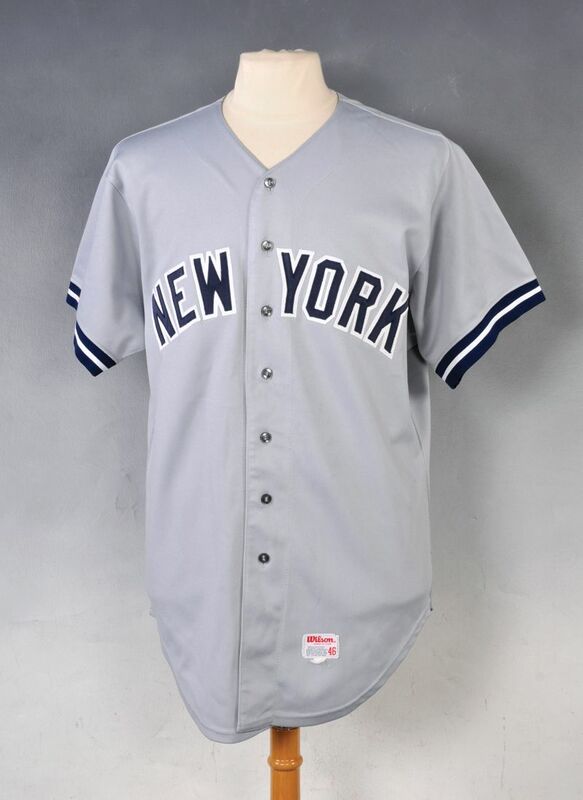 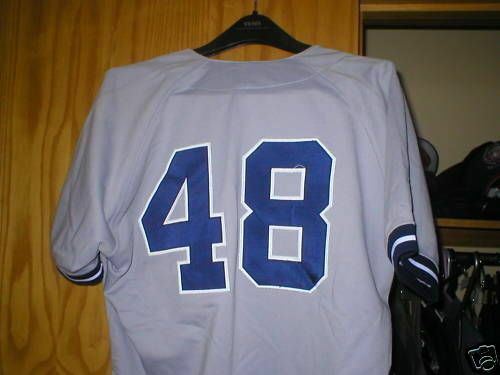 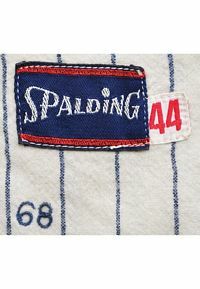 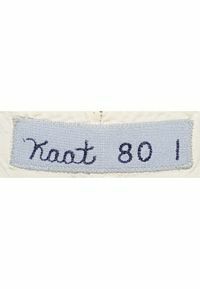 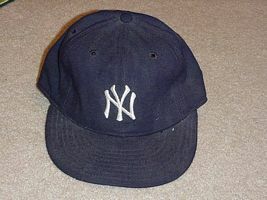 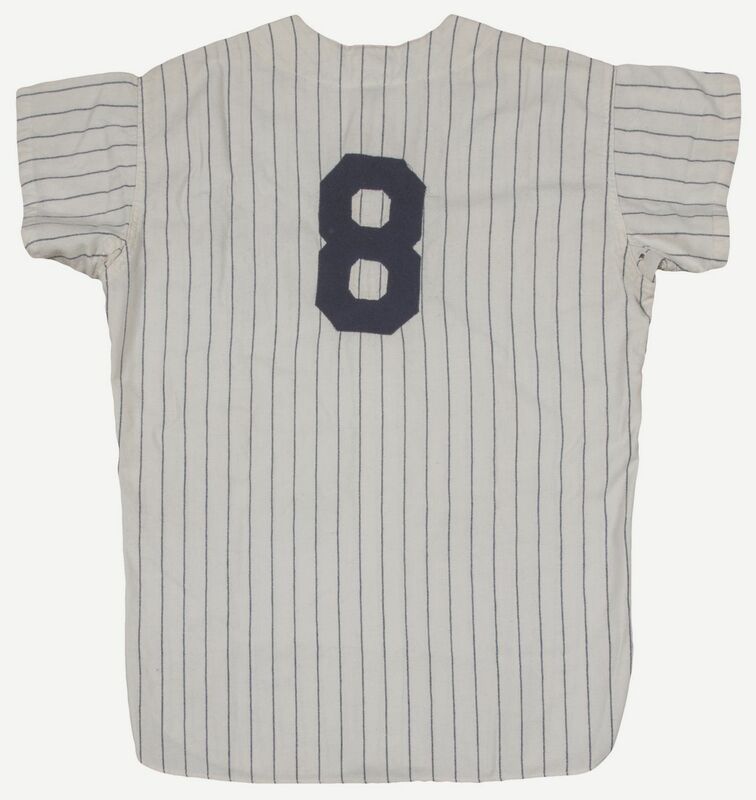 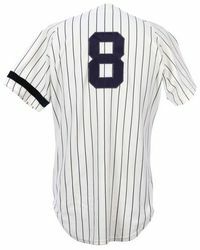 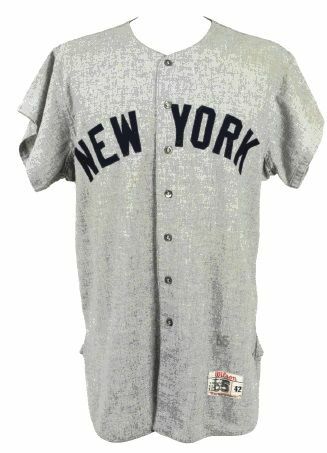 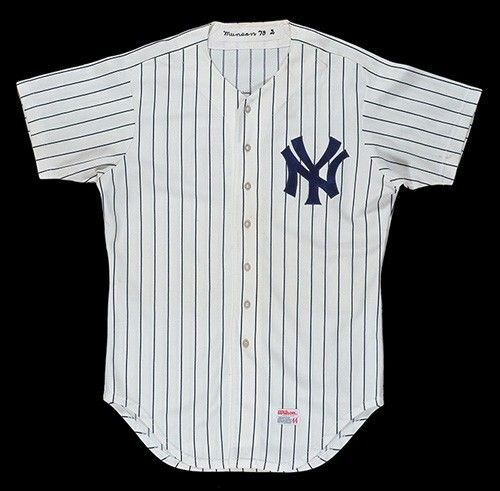 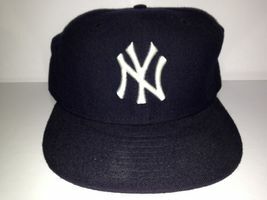 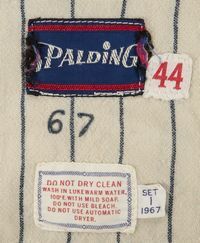 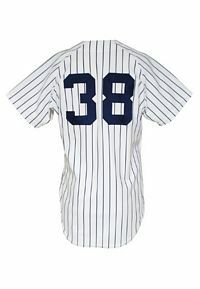 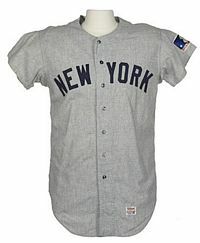 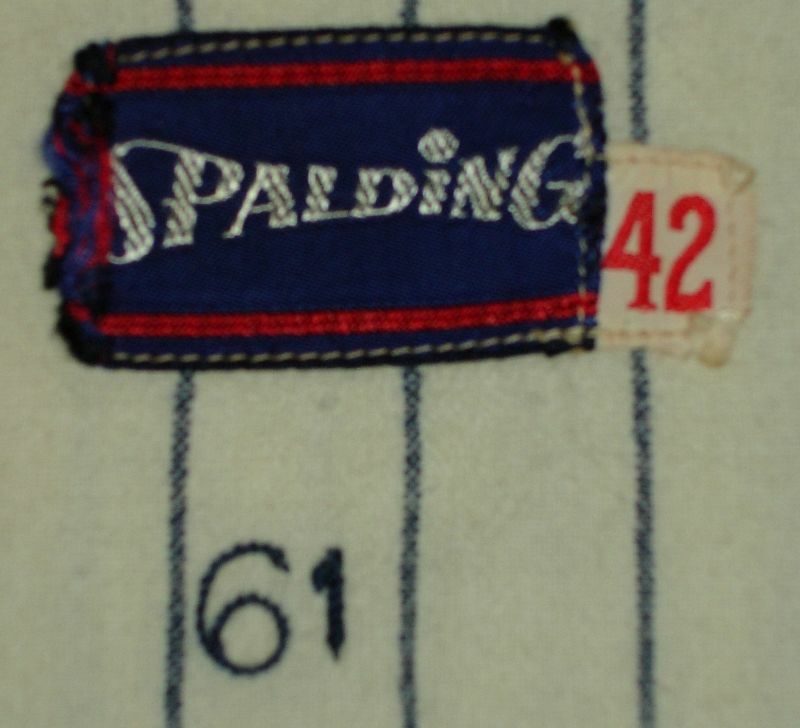 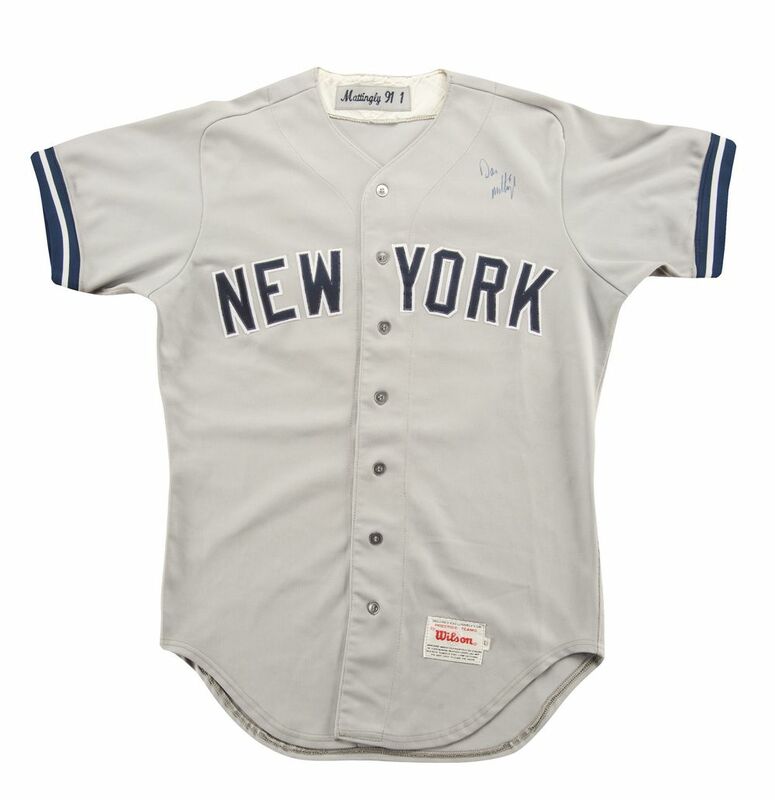 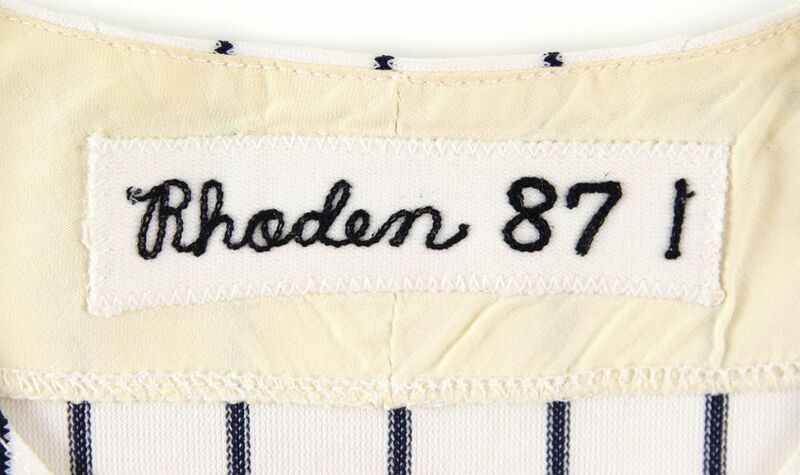 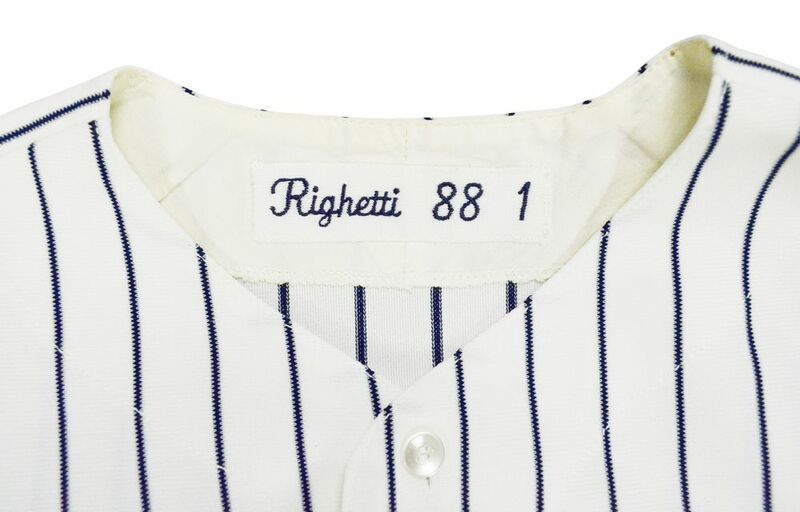 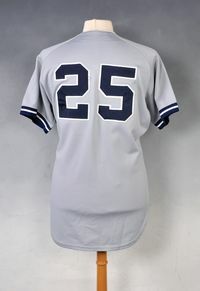 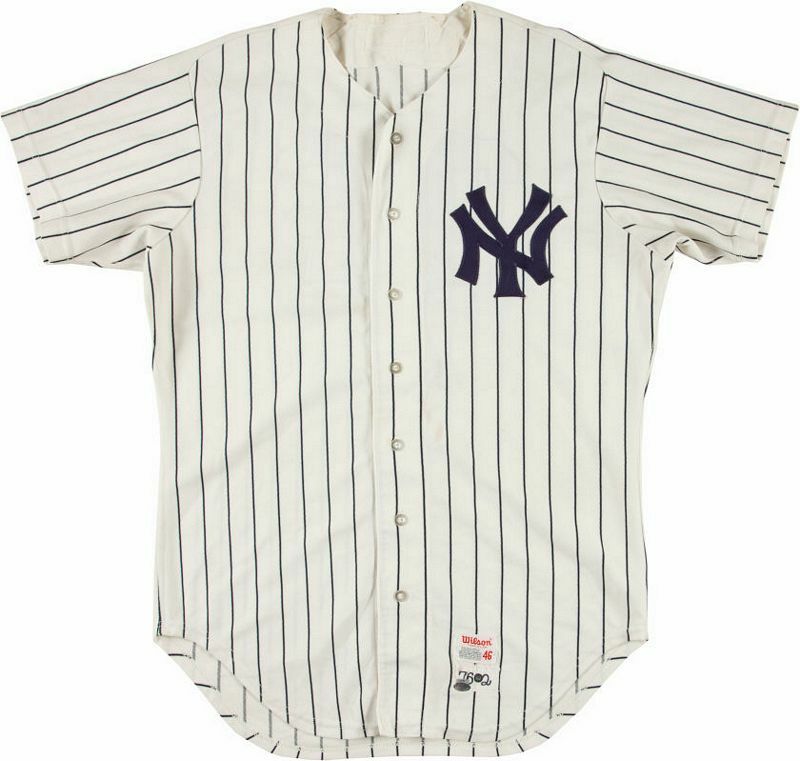 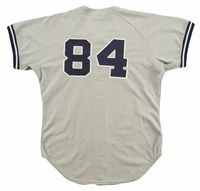 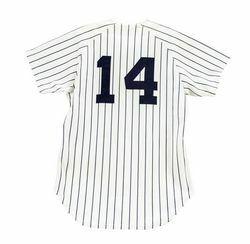 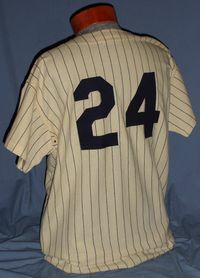 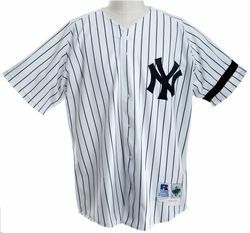 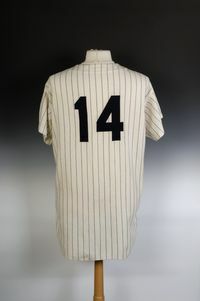 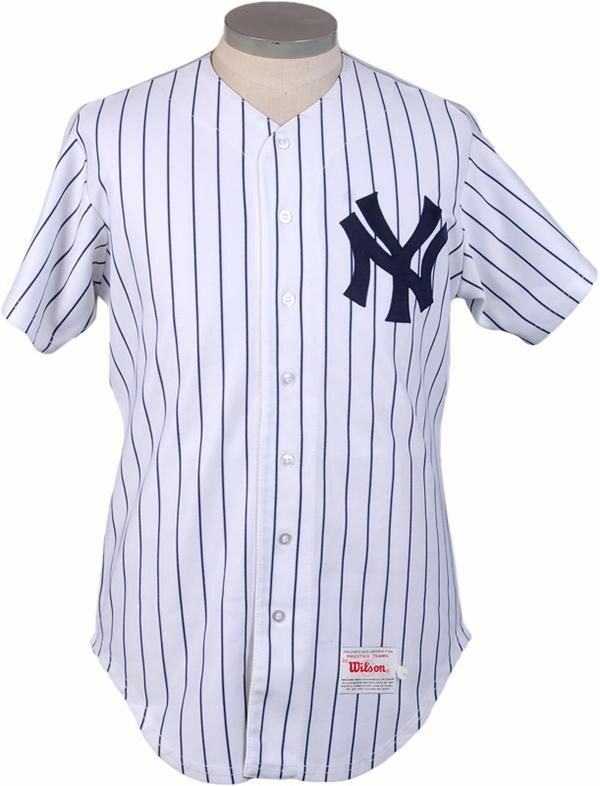 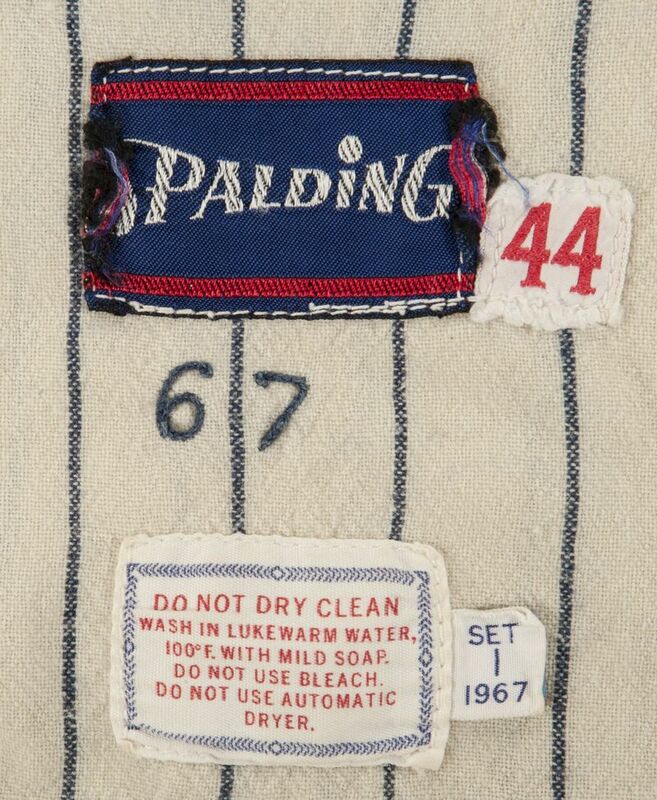 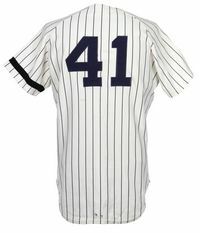 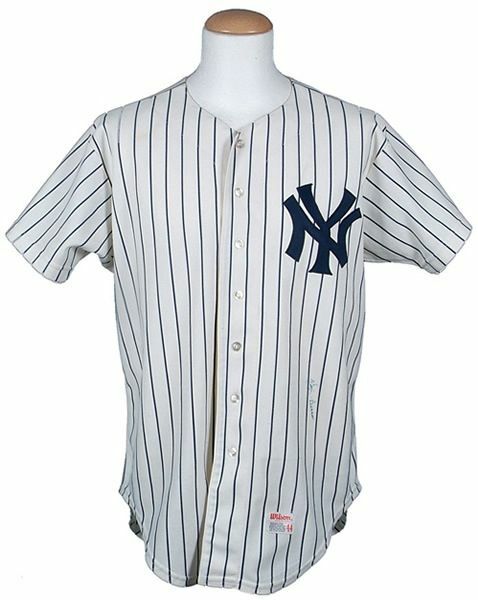 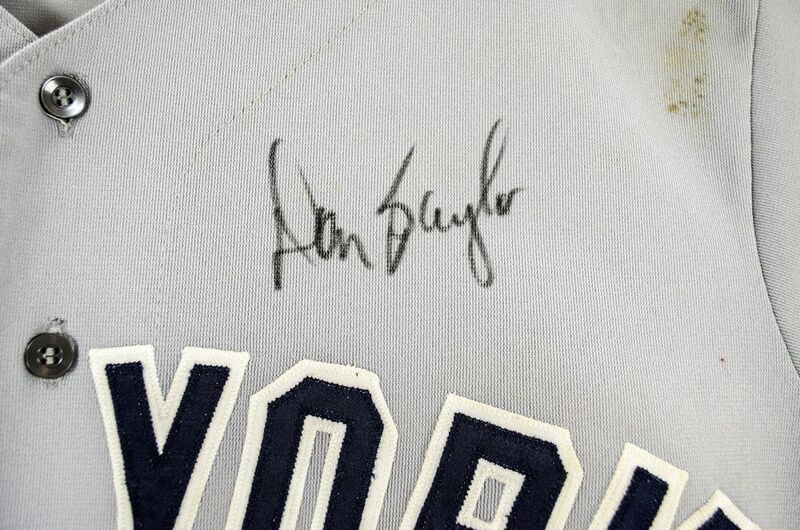 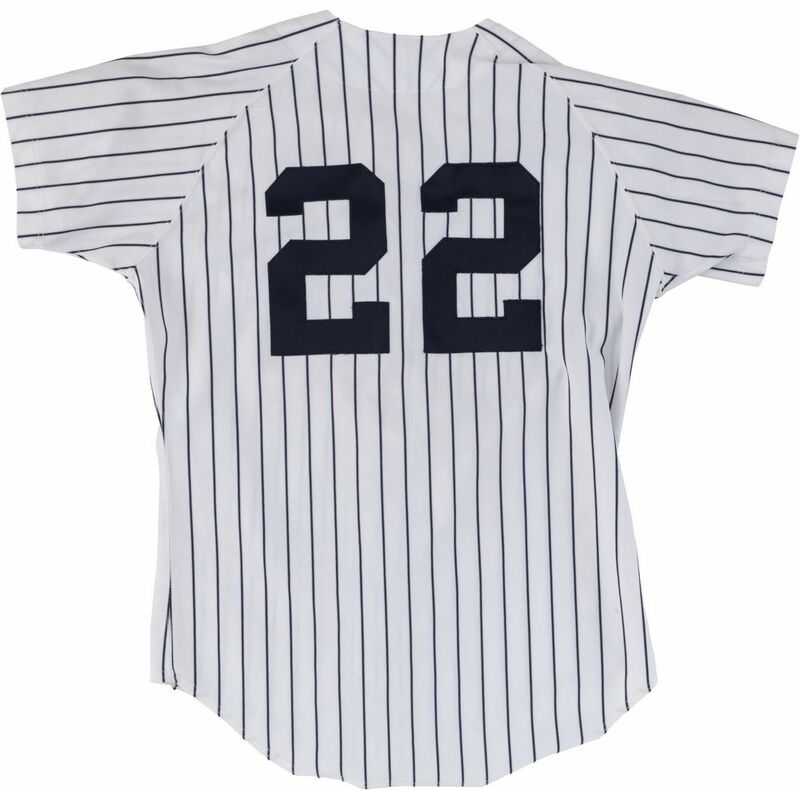 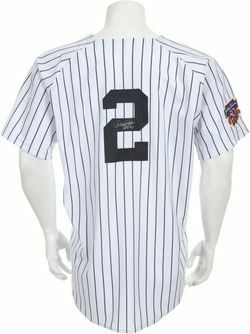 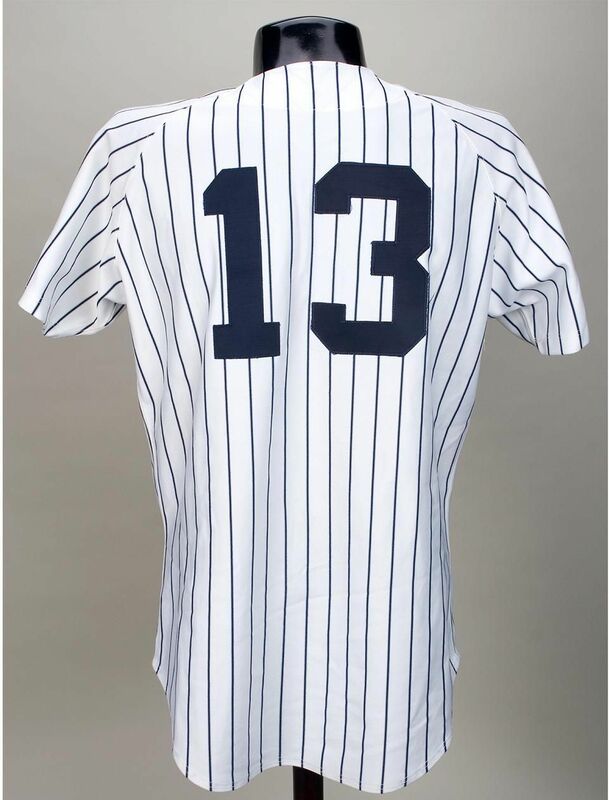 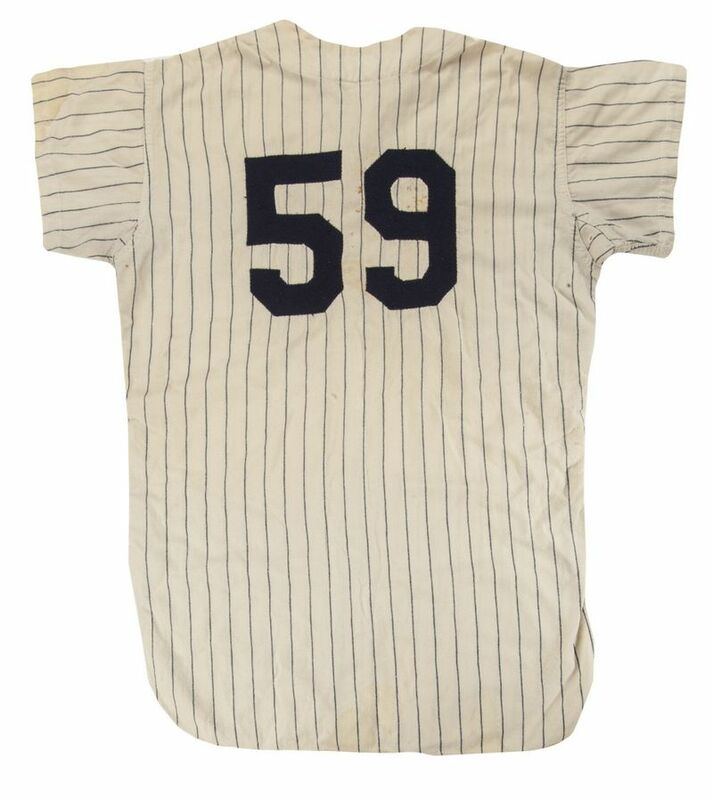 Yankee Stadium anniversary patch on home jersey only in 1973. 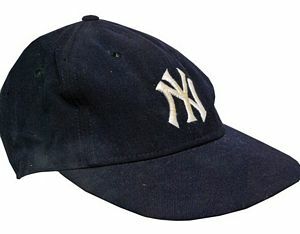 Cap logo grows a bit taller. 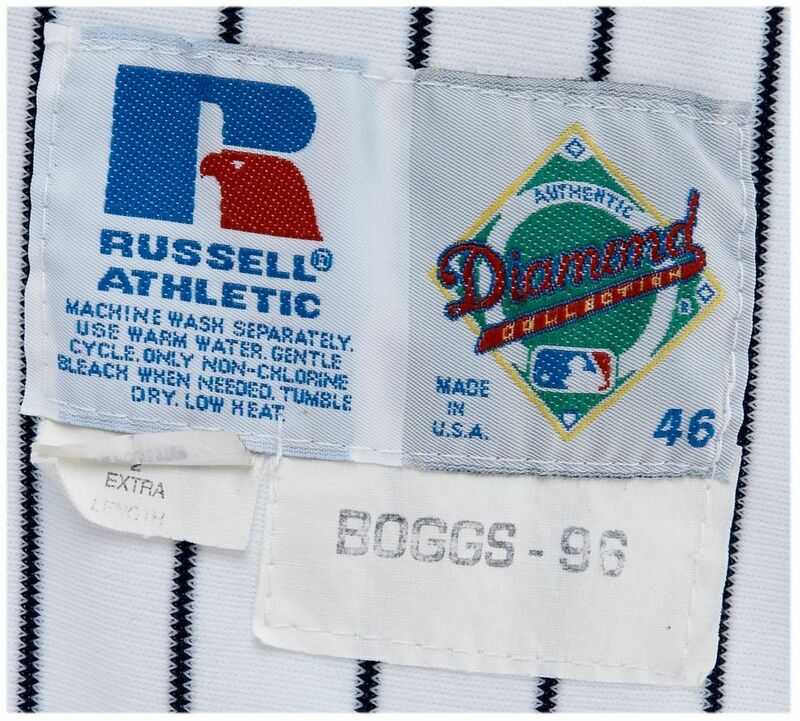 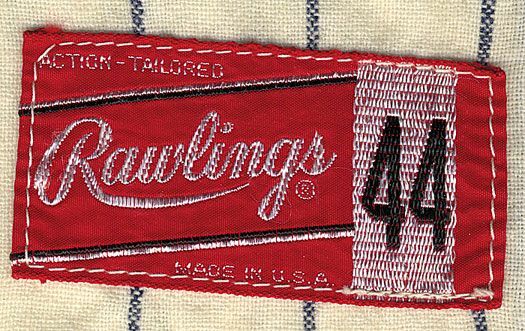 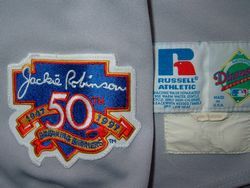 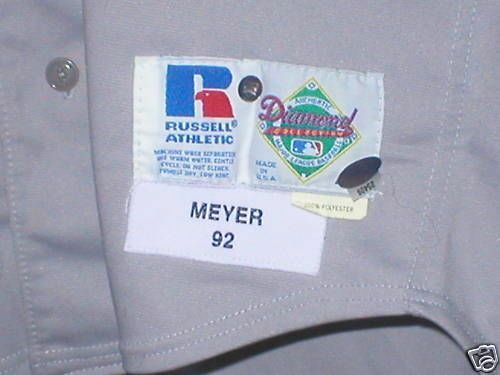 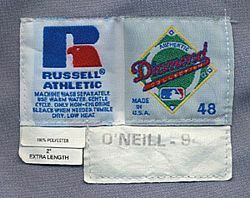 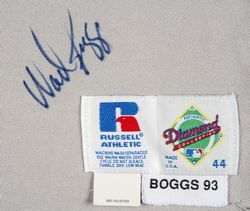 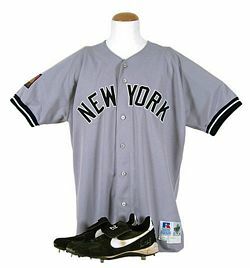 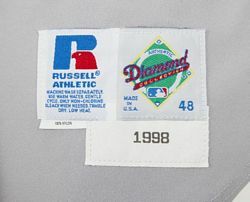 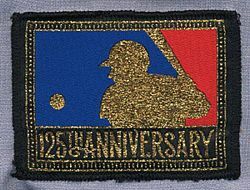 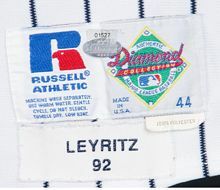 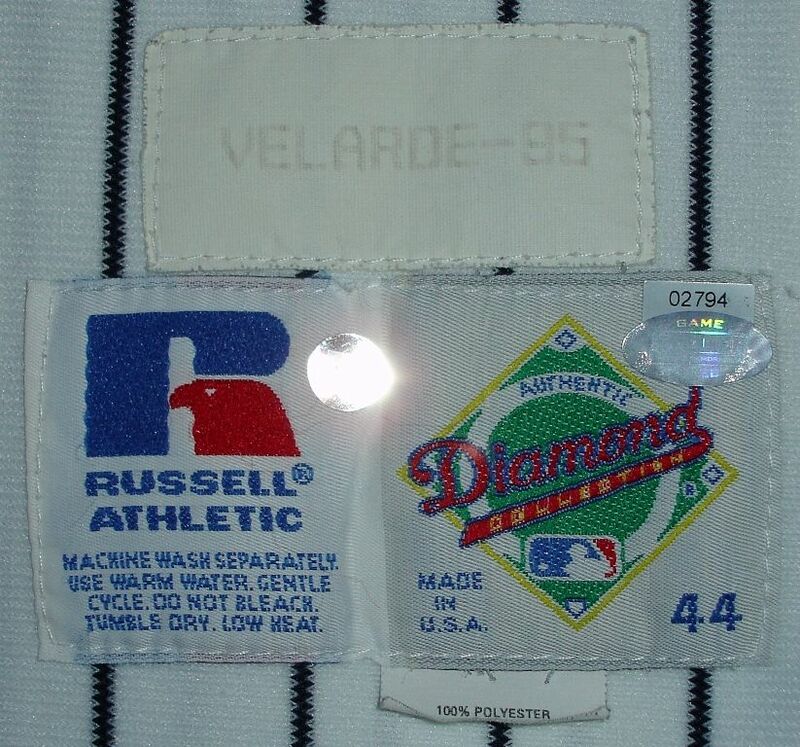 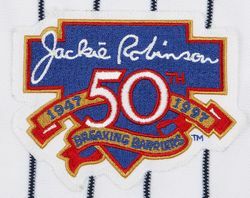 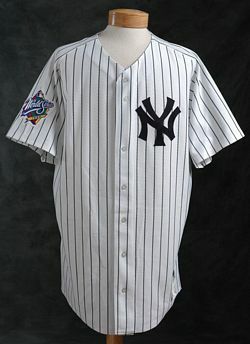 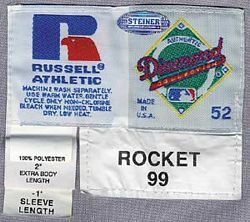 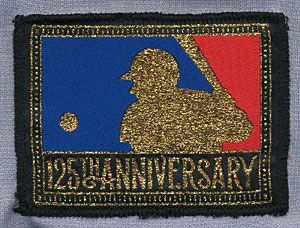 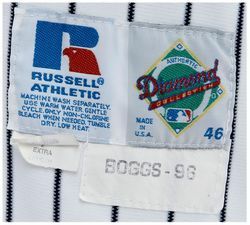 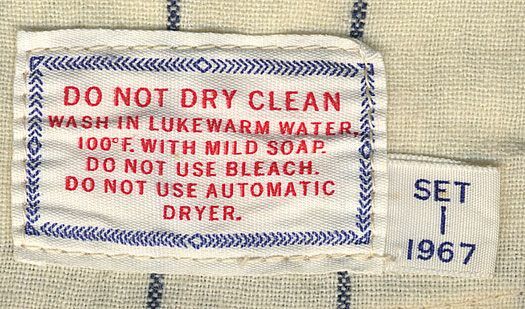 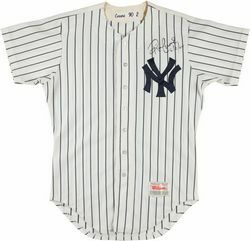 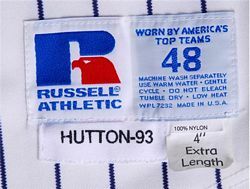 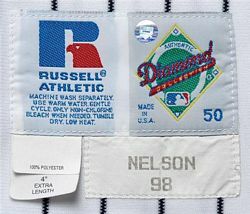 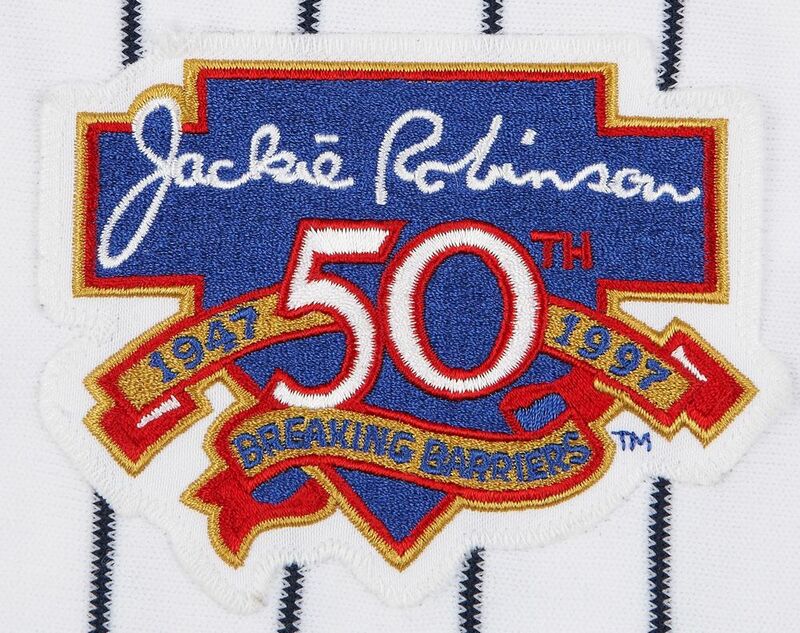 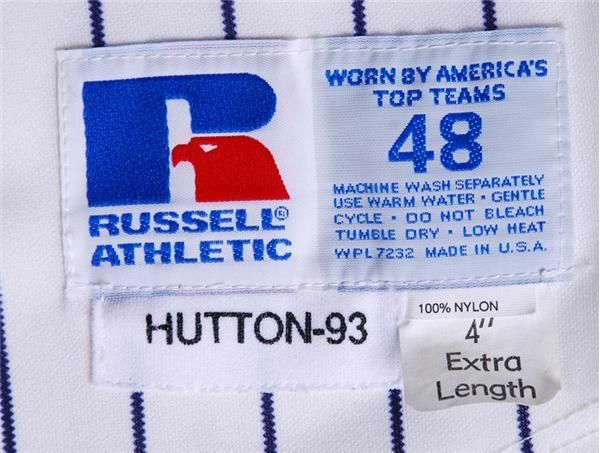 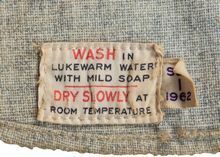 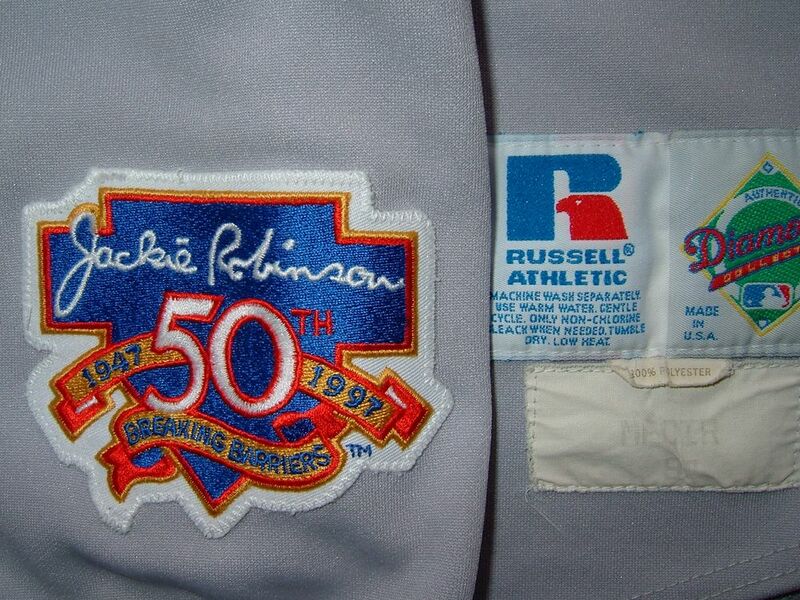 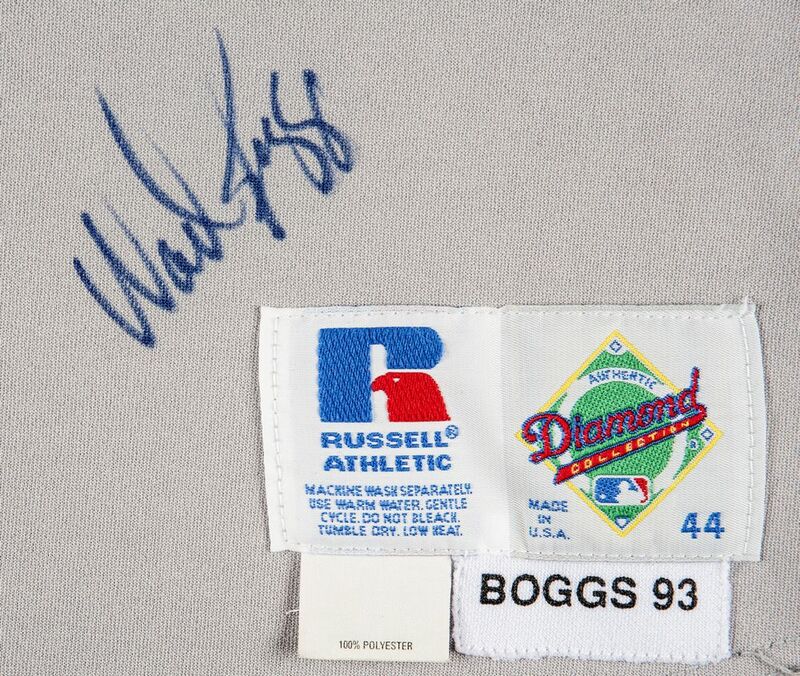 MLB 125th anniversary sleeve patch worn in 1994. 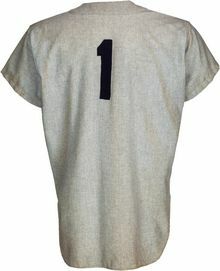 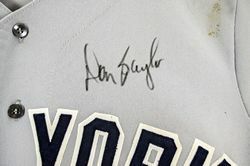 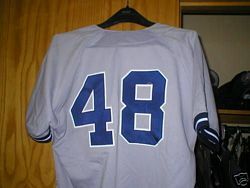 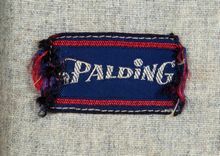 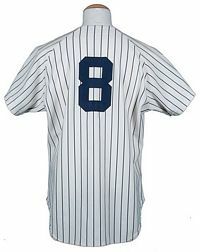 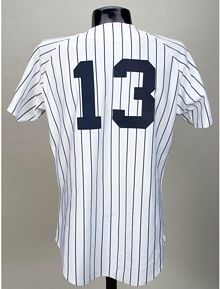 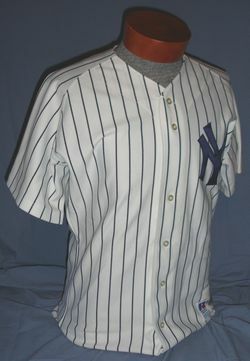 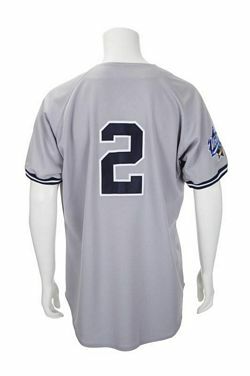 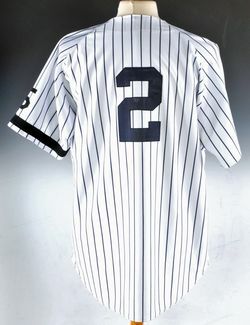 Back view is of a different jersey.